29 May 2012: Beer, no food. Then straight to bed! 31 May 2012: Ethiopian food and South African honey wine, delicious! Maybe we went a little bit over budget today but after all the stress about the car insurance it seemed well deserved. 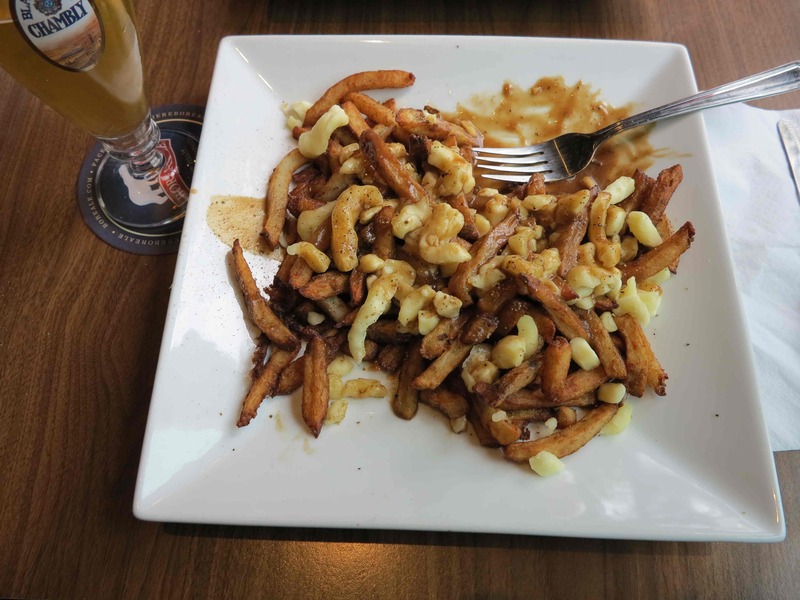 We are saving the famous local poutine for the weekend! 1 June 2012: Poutine classical style with local beer! We are too full to speak…..
2 June 2012: Ok….our friend Trine was right….if you eat a portion of poutine you will not need to eat again for 2 days. Today a bit of bread for dinner, no lunch. The poutine did us in! 3 June 2012: The lovely smell of food lured us into a fantastic, busy, noisy, little chinese restaurant in Montreal’s China Town. We had fried rice with vegetables, steamed choi sum and vegetable dim sum. The amount of food was overwhelming….and we ate it all! Later we had Quebec cider on the bed. 4 June 2012: Chinese again! Noodles with spicy pork and vegetables, steamed bok choi and fried pork dim sum. Slurp! And Quebec cider again. 5 June 2012: Cooked by ourselves at the hostel, cold couscous salad with onions, tomatos, carrots, olives and lots of ground cumin. Dark belgian chocolate for dessert. 6 June 2012: Left-overs from yesterday, Quebec cider, missing Frida! 7 June 2012: Delicious take-away pies and a bottle of wine. 8 June 2012: Thai take-away – and then take-off with Frida! 9 June 2012: Toasted black bread (thank you Christine for the toaster!!!) with humus, aged parmesan cheese brought all the way from Italy and fresh carrots. 11 June 2012: Indian style tortilla omelette = omelette with potatoes and lots of garam masala, chili, cumin, coriander and turmeric. 12 June 2012: Ground beef and tomato sauce with a tough of chili and served with toasted whole grain pita breads. 13 June 2012: The beef sauce from yesterday with pasta. 14 June 2012: Steaks from the BBQ at Irina and Sanzhar’s house! 15 June 2012: Kazakh “manty” made by Galina, Irina’s mother. The absolutely best manty we ever tasted!! Thank you Galina :). For desert, homemade tiramisu. Georgian wine and Kazakh cognac. 16 June 2012: Brunch with Anita and Palle 🙂 thank you guys! And dinner with Irina and Sanzhar at Thai restaurant in Calgary. Now we have gained 3 kg each and are ready to go to the mountains! 17 June 2012: Pakistani chicken and eggplant curry with Achar Gosht spice mix. Georgian red wine. 18 June 2012: Pasta with broccoli fried with olive oil/balsamico/mustard and coriander/chili spices. 19 June 2012: White potatos and long green beans boiled and mixed with olive oil, salt and parmesan cheese. 20 June 2012: White rice (boiled risotto rice mixed with parmesan and olive oil). 21 June 2012: White rice fried with carrots and sugar peas. Canadian brown ale. 22 June 2012: Excellent fresh salmon fried and served with boiled potatos and parsley. 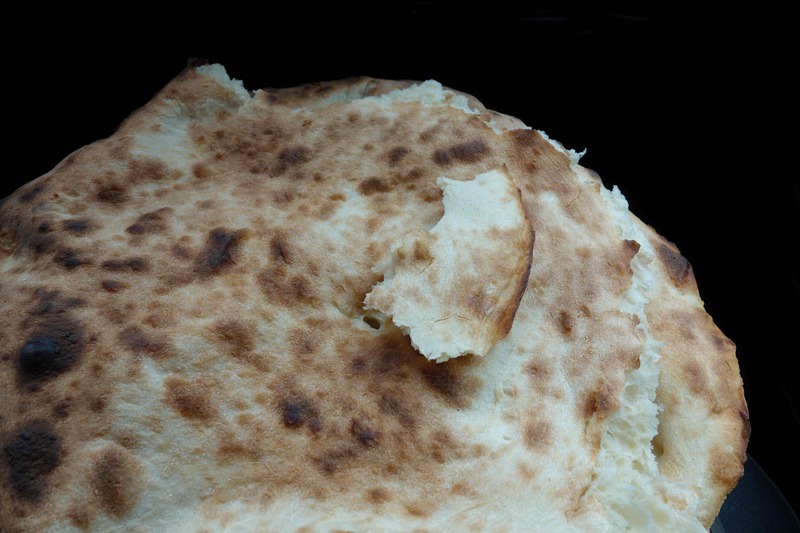 23 June 2012: Indian style tortilla omelette in the pouring rain while packing our rugsacks for the big hike tomorrow…! 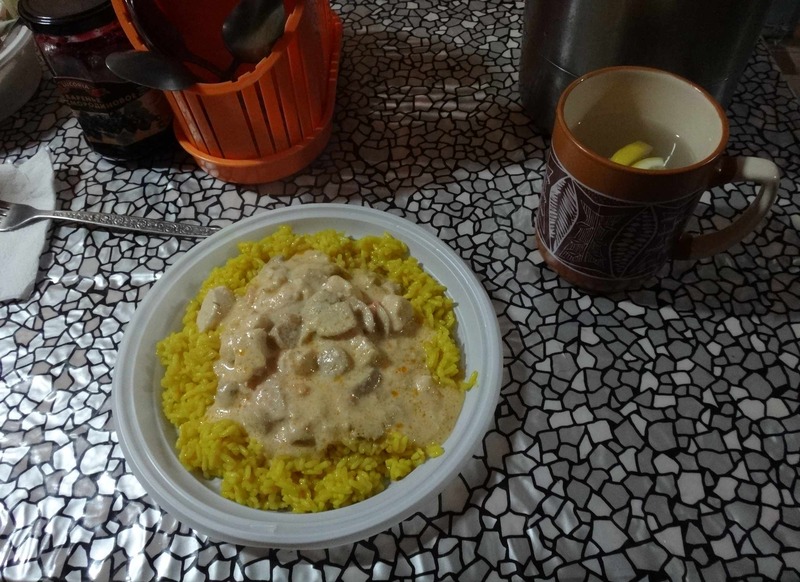 24 June 2012: Freezedried veggie curry with rice…….but we have a view to the north face of Mt Robson! 25 June 2012: Freezedried turkey with vegetables…….but fortunately still the view! 26 June 2012: An enormous portion of pasta with tomato sauce and parmesan. Radler (beer with lemon soda). The sun is shining and we are camping by the river close to Valemount. 27 June 2012: Ground beef and tomato sauce with a tough of chili and served with bread from the Swiss Bakery in Valemount. Salad. Canadian honey ale. The enjoyment was greatly enhanced by the implementation of our new mosquito coils and candles! Why are there mosquitos? 28 June 2012: Mix of freezedried veggie curry and tomato with basil sauce and rice. Rain at Murtle Lake. 29 June 2012: Freezedried chicken with brown rice. Rain at Murtle Lake. 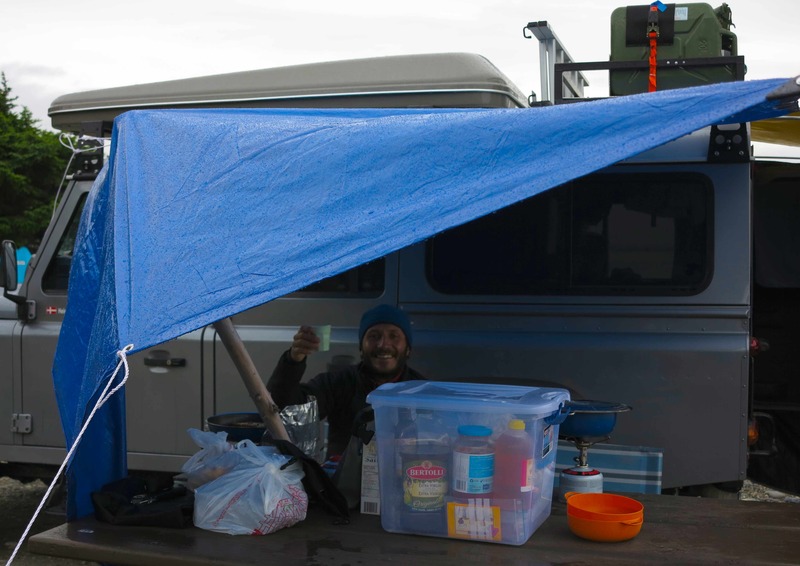 30 June 2012: Repeat from 28 June but now under cover from the rain at Blue River Campground. Beer and radler. 1 July 2012 – Canada Day: Salad with new potatos, avocado, green salads and white salmon from can. 3 July 2012: Tortilla wrap with parmesan cheese, carrot, celery and mustard. 4 July 2012: Fish and chips in Prince Rupert. 5 July 2012: Achar gosht curry with aubergine and the last bottle of georgian wine from Calgary. At Rennel Sound on Haida Gwaii with a view to the water and the bald headed eagles passing by. 6 July 2012: Extremely delicious smoked chinook salmon from Masset, Haida Gwaii. Pan fried and served with small new potatoes and parsley. Camping on Agate Beach in the rain. Lots of red wine. 7 July 2012: Cous-cous in the queue for the ferry back to Prince Rupert. 8 July 2012: Pan fried scallops and wild salmon – very very delicious! Greek yoghurt with buckwheat honey. 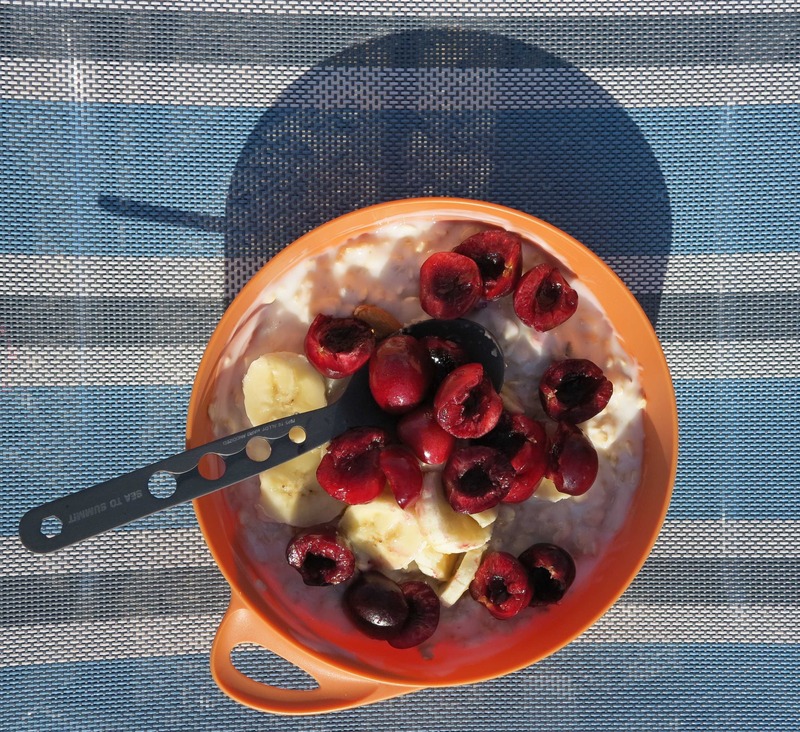 9 July 2012: We stopped very late so had just greek yoghurt with buckwheat honey again before going to sleep. Camped in the forest on the way to Lillooet. It was completely quiet and we slept very well with the tent open and the smell of pine forest. 10 July 2012: Rice with tomato sauce at Wedgemount Lake. 11 July 2012: Rice with tomato sauce at Wedgemount Lake….but the view makes it up for the boring food! 12 July 2012: An ENORMOUS portion of pasta with parmesan and olive oil after a very hard day (1050 m up to the top of Wedge Mountain and 2200 m down to the car). Cold beers. 13 July 2012: Ground beef cooked with onion, carrot, slightly hot peppers and fresh tomatos. We are in the USA and food is much cheaper! 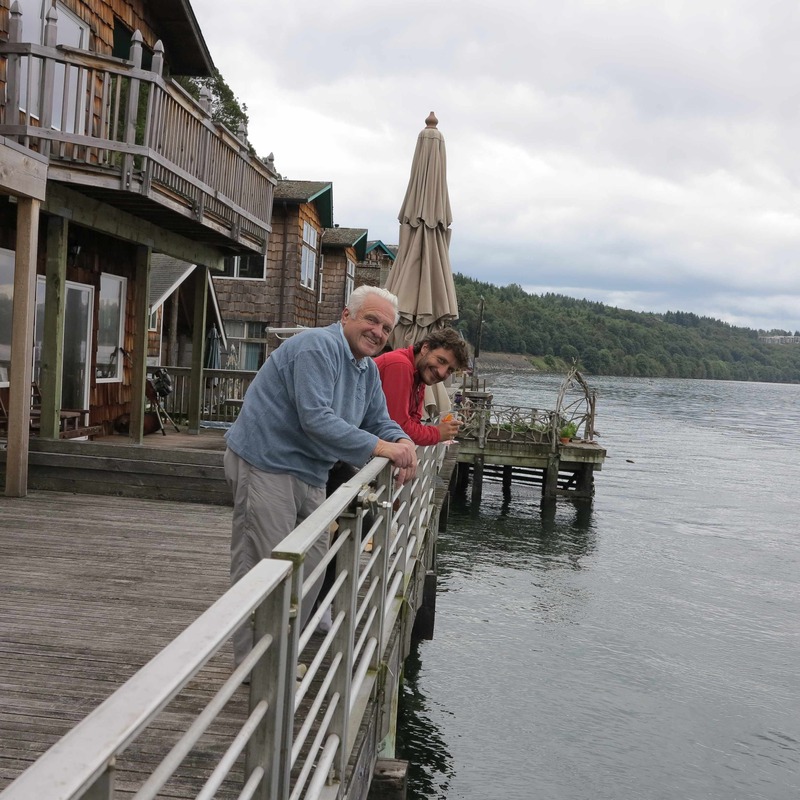 14 July 2012: We are in Seattle visiting Reimer, an old friend of the family! We had the car parked outside on the street and it was Saturday so we did not need to pay for parking. But as we came back from a walk along the waterfront, there was a note stuck under the windshield wipers. Dammit, a ticket! But it turned out to be a handwritten note from Giuseppe who has a restaurant just around the corner. He had noted the car and the Italian license plate. So we went to eat to his restaurant that night, a delicious dinner with a bottle of good Sicilian wine sponsered by Giuseppe! Reimer and I had rigatoni with sauce puttanesca (the sauce of the prostitutes directly translated), salmon and halibut. Marco had a seafood stew. Thank you Giuseppe! 15 July 2012: We went to Marlenes beach house at historic Salmon Beach, Tacoma. A magical place, hidden away beneath a steep bank and with the houses built on poles out in the water so that you can hear the sound of the waves under the house at high tide. We could spent hours just sitting on the large terrace looking out over the clear water where we saw seals and salmon schools passing. We had salad with fresh crab meat, lasagna (real italian) and italian icecream (pistacchio and coconut). A fantastic afternoon spent with great people at a beautiful place. 16 July 2012: Another feast! Mexican food at Chipotles. Farewell dinner with Reimer, tomorrow we are leaving for Mt Rainier. 19 July 2012: Camp Muir. Freeze dried teriaky chicken with rice. 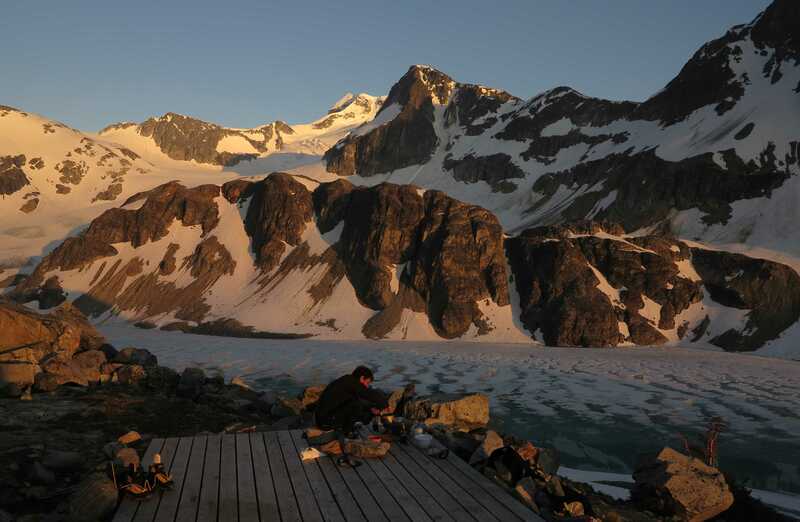 20 July 2012: Ingraham Flats. Some freeze dried thing with beef and beans…too many beans…! 21 July 2012: Summit Mount Rainier! An enormous portion of white rice with parmesan and olive oil for dinner flushed down with cold beers. In bed by 9 pm. 23 July 2012: 600 g of absolutely fresh tuna, pan fried in fresh lemon juice and served with new potatoes. 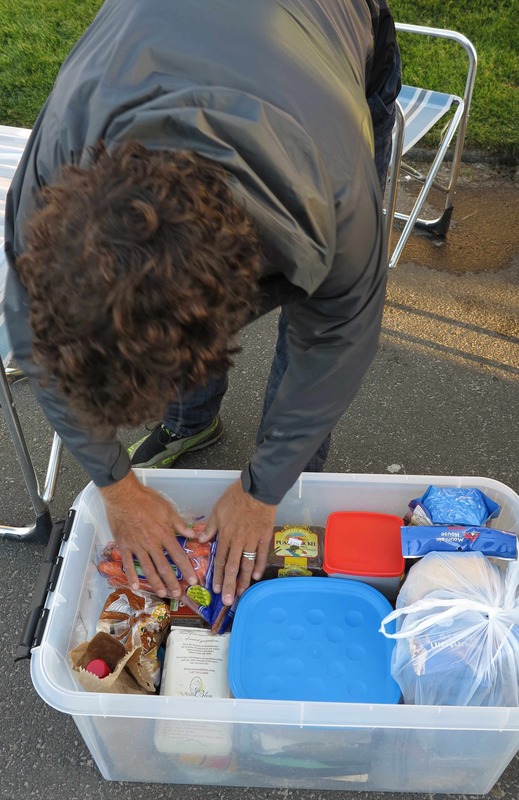 Marco putting our food box in order! 24 July 2012: Fish & chips in Port Orford. 25 July 2012: Camping at the base of Mt Shasta – a magnificent view to the two main volcanic cones. Cold cod salad with potatos, green beans, parsley, garlic and olive oil. 26 July 2012: Pasta with parmesan and olive oil at the Mt Shasta basecamp at Helens Lake. And along with the pasta, our new favourite beer: Weed Jalapeno Ale – a very hot beer! Cool it down in a glacier, open it with an ice axe and drink it after a good climb. 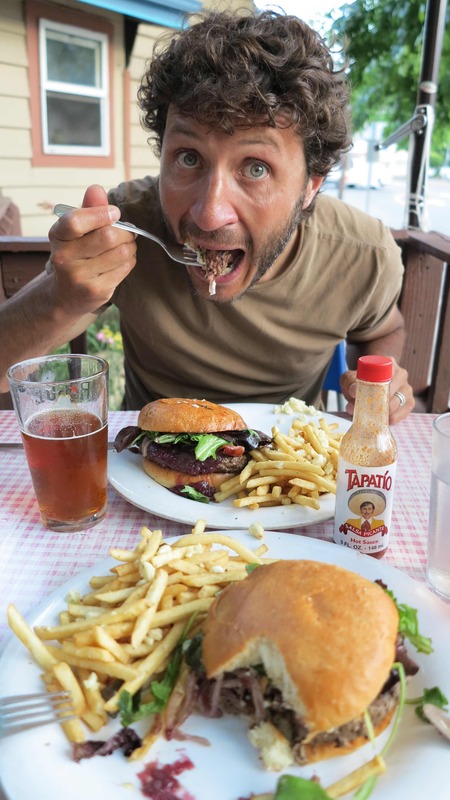 27 July 2012: A huuuuuge burger at The Goat Tavern in Mt Shasta city. 28 July 2012: Another big burger for lunch….and then salad for dinner. 29 July 2012: Omelet with eggplant. Salad. And a new favourite beer: Blackberry Blanche from the Etna brewery close to Mt Shasta….uuuuhhhhmmmm!!! 30 July 2012: Cold cous-cous with vegetables. Raspberry chocolate for dessert! 31 July 2012: Cous-cous again. Blackberry beer. 1 August 2012: Rice with parmesan – the last parmesan from Italy! 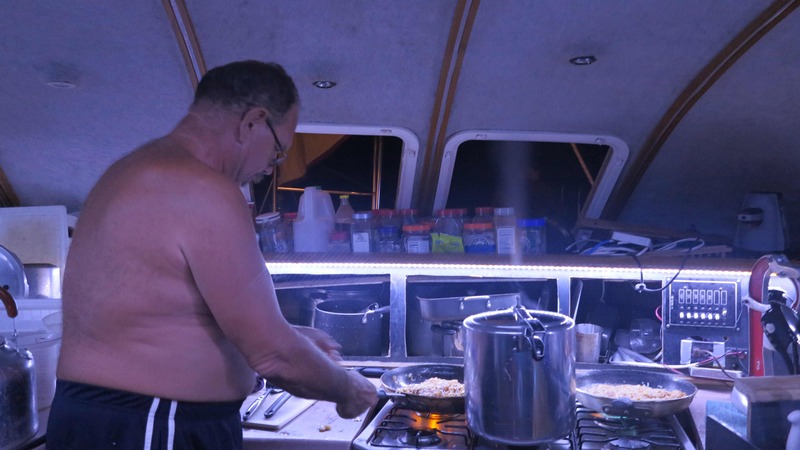 5 August 2012: Pasta with fresh tomato salsa at the boiling hot shores of the Salton Sea. The last jalapeno ale. 6 August 2012: Fresh fajitas with grilled shrimp, frijoles and guacamole. Strawberry margerita. Mexico!!! 7 August 2012: Wraps made with jalapeno tortillas and home made indian-spiced spanish-style tortilla omelette. What an incredible combination! 8 August 2012: Masala tomato sauce with cous-cous. Cold beers. It is extremely hot! 9 August 2012: Leftovers from yesterday. We are driving a lot and arriving late. 10 August 2012: Nachos and margaritas on the ferry from La Paz to Topolabompa. Now on the mainland ready to drive down south along the coast. Our target is to drink at least one fresh margarita each every day. 11 August 2012: Now we will have to mention also the lunch. First tacos with asado (grilled meat), then we passed by a place making freshly grilled whole fish (from the river) with tacos and we had to eat that as well! For dinner just a few beers with beef jerky from California and fresh papaya with lime. 13 August 2012: Grilled shrimp tacos for lunch (we just can’t get enough!). For dinner we had tacos with guacamole as starter and shrimp fajitas as the main dish accompanied by a couple of fantastic strawberry margaritas in a small restaurant on the beach. 14 August 2012: Dinner #1 chicken enchilladas and fruit punch. Dinner #2 chicken tacos and rice water with cinnamon. Dinner #2 was definitely the best! 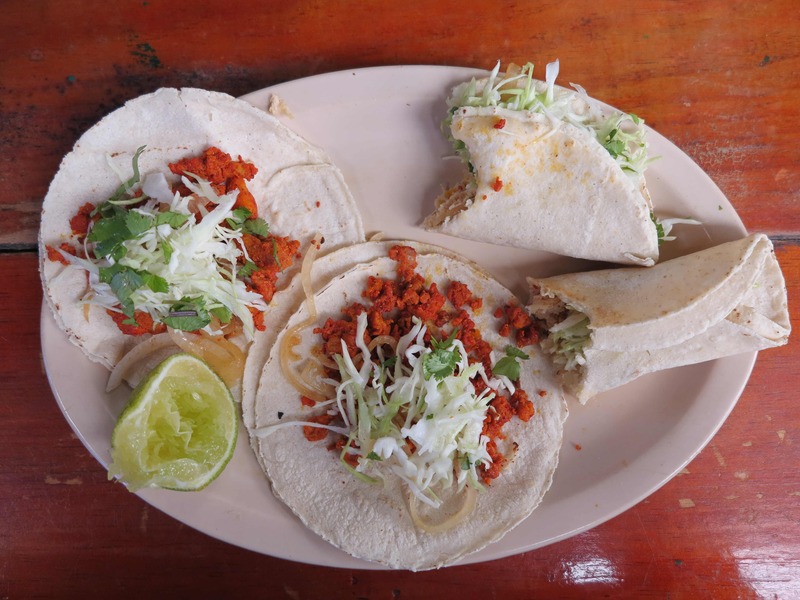 We love the tacos as they are always served with a choice of fresh and hot salsas plus beans and sometimes some vegetables or guacamole so you can combine your own special taco. 15 August 2012: We arrived late (too late) so made a quick pasta with avocado, fresh black pepper and olive oil. 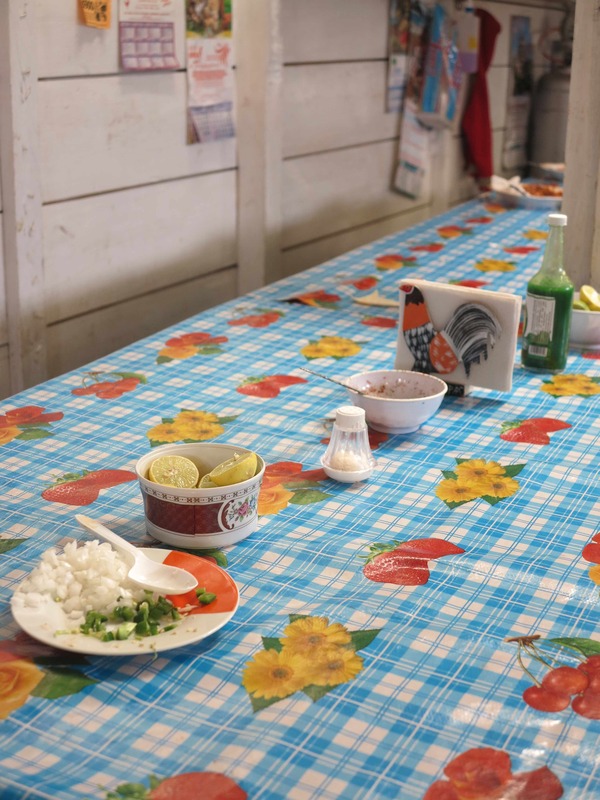 16 August 2012: Tacos a la Tres Marias with shrimps and – unfortunately – mayonaise sauce! Strawberry daiquiri. 17 August 2012: Argentinian empanadas and mexican tacos with tuna. 18 August 2012: For lunch delicious tacos and quesadillas with chicken served on the street in front of the supermarket. For dinner pina coladas and shrimp diablo – shrimp cooked in a hot sauce. 19 August 2012: For lunch Quiso de Pollo – chicken casserole with beans, rice and tacos served along the road. For dinner tacos with chicken, with chilis and with cactus! It was quite good. And here is the final product – delicious!!! 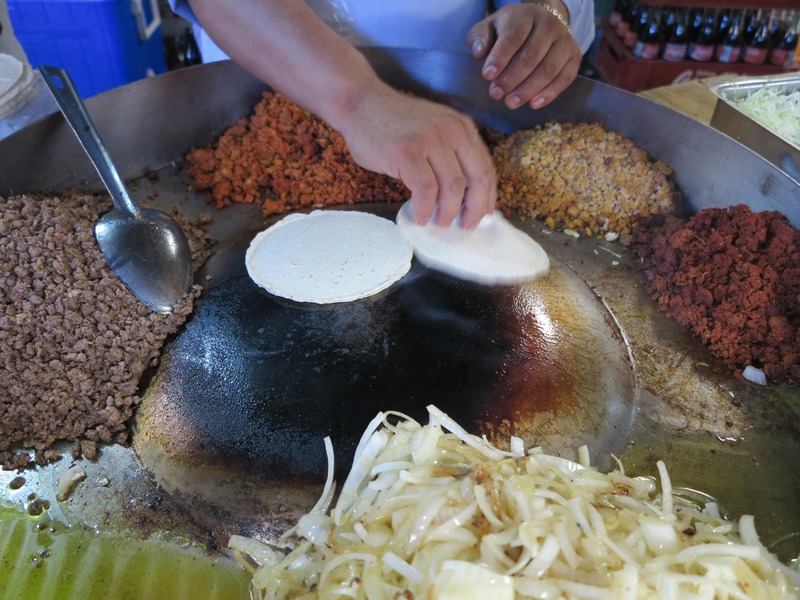 20 August 2012: For lunch tacos with chicken and with spicy beef (chorizo) at the food market in San Christobal (see photos above). Very tasty! And for dinner we had organic biodynamic sustainable etc wholegrain quesadillas with cactus, spicy green pepper and the yellow flowers of squash/zucchini. To drink fresh papaya juice. Slurp! 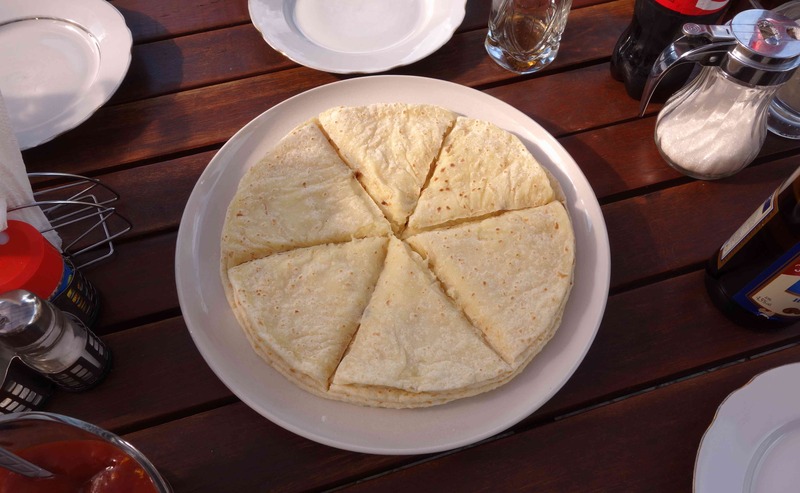 21 August 2012: Boring quesadillas with beans and cheese at the campsite in Palenque. One thing was good though: The fried platanos (large not-so-sweet bananas). 22 August 2012: We went shopping and had a feast – home made tacos with shrimp, green salsa and home made guacamole. Prepared and served at candlelight under our awning (markise) with the tropical rain pouring down in the darkness all around us. 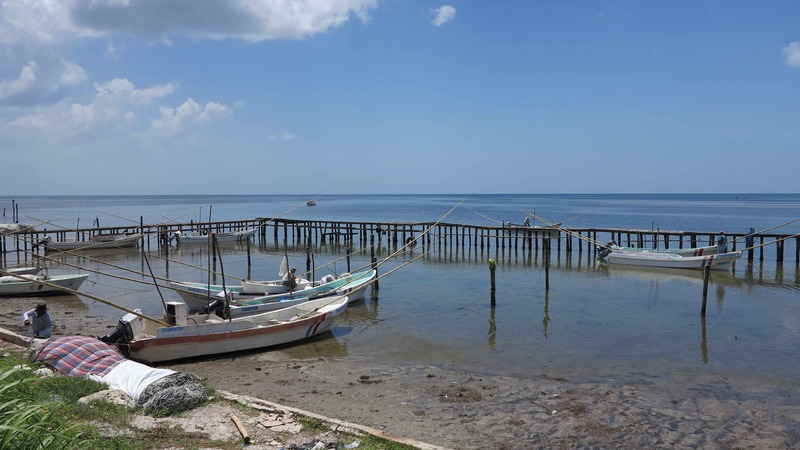 23 August 2012: For lunch we stopped in Champoton where we saw the Atlantic Ocean for the first time on our trip. We had tacos with fresh seafood and a view over the Atlantic Ocean: Shrimp in enchilada sauce, octopus in their own ink, ceviche (peruvian style fish marinated in lime juice) and fried fish. It was simply excellent! For dinner we had leftovers from our shrimp feast yesterday. Tacos with shrimp and octopus…..
…caught in the Atlantic Ocean just across the street. 24 August 2012: Tonight in Merida we had typical Yucatecan food at the “loncheria” Punta y Coma (punktum og komma) which means eat and don’t speak! It is located inside the “Mercado” at Calle 60 crossing Calle 65 & 67. Recommended! 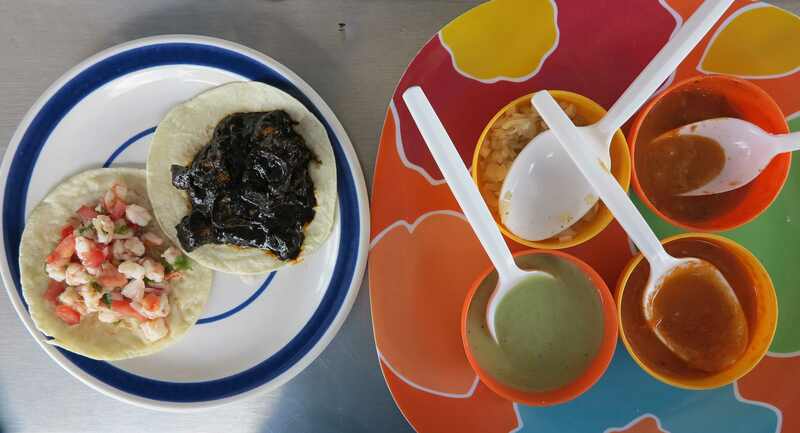 First Salbutes and Panuches: One is a soft tortillas with turkey, avocado, lettuce and pickled onions on top and the other is almost the same but on a fried tortilla and including black beans. Very tasty! Then we had a taco with turkey liver pate baked around a whole egg and some turkey meat. Also very good. Last we shared a tamale with turkey – a tamale is made with a dough of starch rich corn flour and baked inside a leaf wrap. It is an ancient dish which has been traced back to the B.C. Maya cuisine! It was not our favourite but interesting to try. Uhm, fresh papaya and pineapple for lunch…..
25 August 2012: In Tulum we tried again the salbutes and panuches but they were not as nice as in Merida. 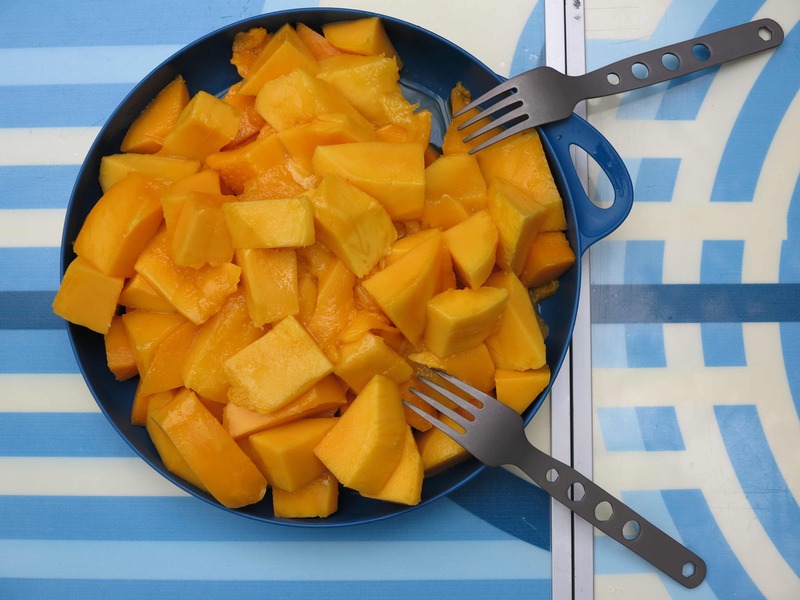 26 August 2012: For lunch fresh papaya and pineapple, so tasty! And along the road we snacked on fried platanos and delicious home made coconut empanadas which we got from a lady selling them along the road. Slurp! For dinner, tacos with chicken and a very very very hot home made sauce in Chetuman on the border to Belize. 27 August 2012: Tonight we had a traditional Belize meal: Rice with beans and grilled fish (could also have been chicken). Basic but good. 28 August 2012: Home made pasta with sauce of fresh tomatos, onion, carrot, green pepper, garlic. 29 August 2012: Home made cous-cous with vegetables. We need vegetables! 30 August 2012: Pasta with avocado lightly mashed with lime, salt and pepper. For lunch tortillas baked with beans inside and with a topping of tomato salsa and fresh jalapenos. Burning hot but good! 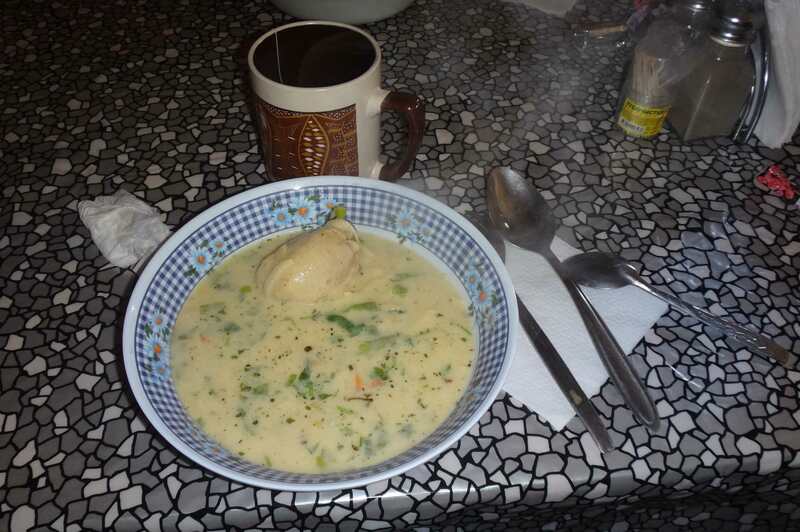 31 August 2012: Malene had the typical Coban dish Kaq’Ik, a soup with turkey and on the side tamales and rice. Marco had a big salad and chicken tacos. 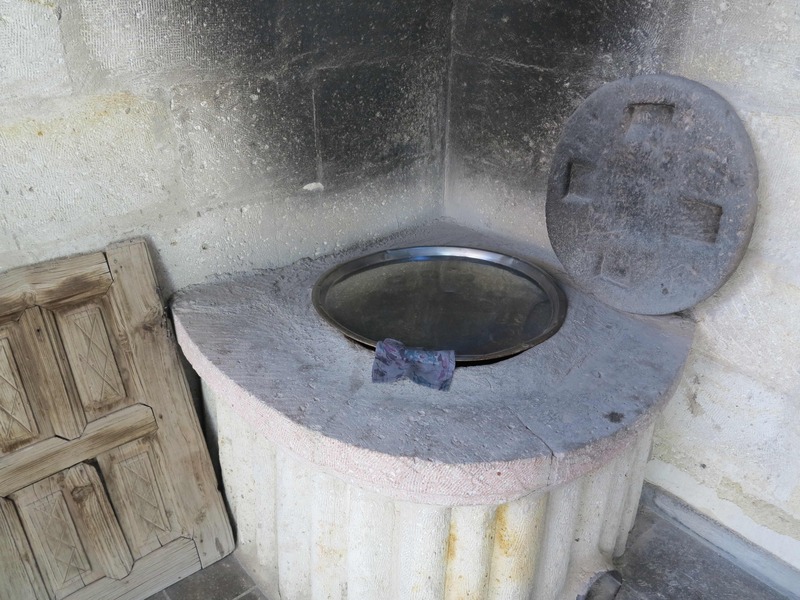 1 September 2012: We stayed overnight outside a small restaurant (comedor) on the way to Huehuetenango. In the comedor we ate a very nice omelet with vegetables and cheese, on the side frijoles, tomato salsa and tortillas. 2 September 2012: Home made pasta with tomato sauce and basil from the market in Huehuetenango. 3 September 2012: We slept outside a restaurant owned by a very nice family from Nicaragua at the foot of Volcan Tajumulco, we ate chicken breast with frijoles refritos, vegetables, rice and tortillas. Off to bed at 8 pm, ready to get up at 1 am to climb the volcan for the sunrise. 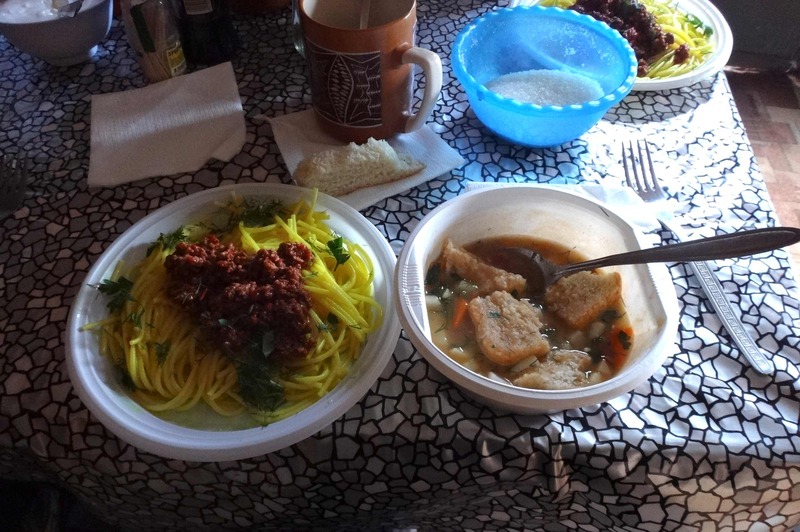 4 September 2012: Homemade vegetable stew in Quetzaltenango. 5 September 2012: White rice cooked with carrots and mixed with hard white cheese from Guatemala. 6 September 2012: Boiled new small potatos and cauliflower from the market in Chichicastenango, eaten with salt and olive oil and fresh cilantro. 7 September 2012: In beautiful Antigua. Broccoli soup, vegetable lasagna and a good bottle of wine from Chile 🙂 happy birthday Marco!!! At home we had the cake; a delicious banana bread still warm from the oven. 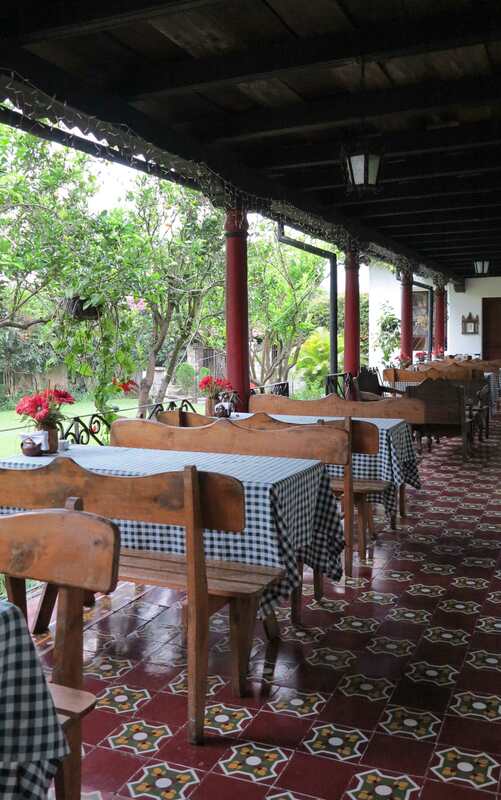 8 September 2012: We went to a fantastic local restaurant in Antigua. Actually, this is where we wanted to go yesterday night but they close already at 7 pm! So today we went for a late lunch. We had the typical dishes “pepian” and “jocon” – the first one is chicken (or pork) and vegetables in a red sauce and the second one chicken and vegetables in a green sauce (made with green tomatos instead of red and with cilantro). Served with a half avocado, rice and tortillas. Very tasty! Ah yes and to drink we had a liter of fresh lime lemonade. For starter we had “chiles rellenos”, stuffed and fried peppers. 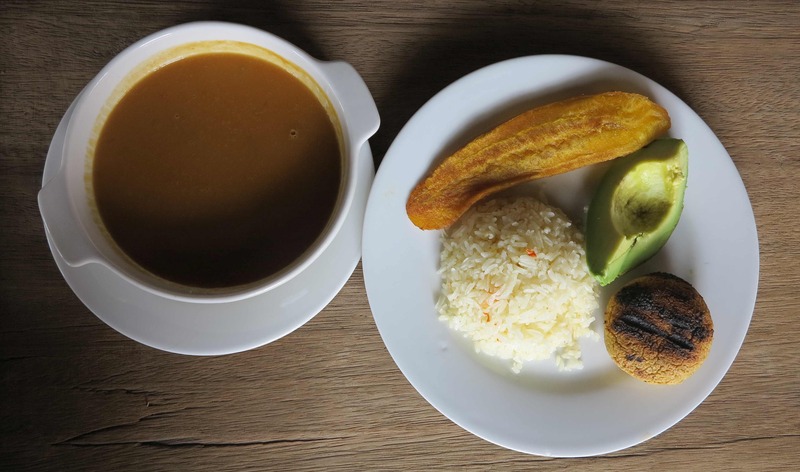 For desert we had “mole de platanos”, which is fried plantains (the fat not-so-sweet bananas) served in a sauce made with guatemalan chocolate, and “rellenitos de platano”, which is fried balls of mashed plantains with a center filling of sweet black beans. Does it sound like a lot of food? It was a lot of food but it was irresistably tasty! 9 September 2012: Now we spent our food budget for the month so back to basics! Today boiled potatos and cauliflower served with pepper and olive oil. 10 September 2012: Home mad meat sauce (with ground beef, tomatos, green pepper, carrot, pumpkin and onion) and tortillas. 11 September 2012: Boiled potatos again but this time with long green beans, parsley and a local, hard and salty guatemalan cheese. The vegetables in Guatemala are both cheap and tasty. 12 September 2012: Pasta with guacamole and two bottles of good Argentinian wine together with Luis at Posada San Sebastian in Antigua. Tomorrow we are leaving for El Salvador. We will miss Luis and our home in Antigua! 13 September 2012: Delicious pupusas, the national food of El Salvador! We love pupusas and we are delighted to report directly from El Salvador that they make the best pupusas in the world here! Pupusas are thick corn tortillas with a baked-in filling like for example beans, pork, chicken, etc, with or without cheese. We like them with beans! 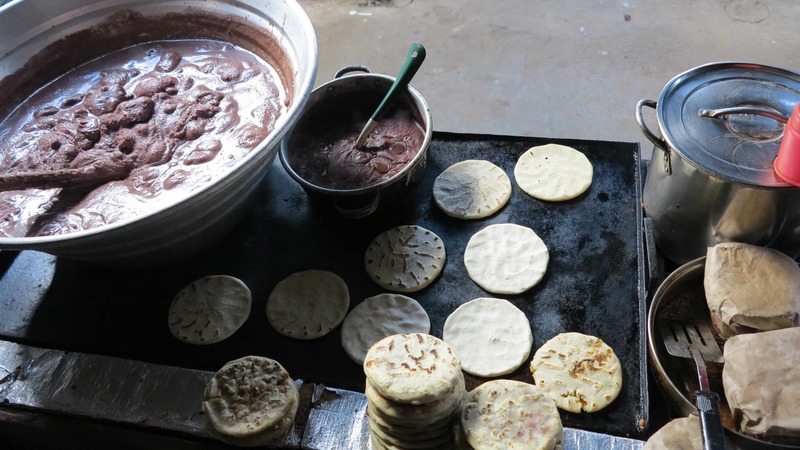 Pupusas in the making at the market in Ataco, El Salvador. 14 September 2012: For lunch, pupusas with beans. For dinner chicken with rice and beans and tortillas. 15 Sepbemter 2012: For lunch, chicken with rice and beans and tortillas….again! For dinner in Matagalpa, the very typical local street food “guirila”, which is a thick, sweet corn tortilla, baked in banana leaves and eaten with salted soft cheese. 16 September 2012: We had a sandwich for lunch on the square in Granada and for dinner just homemade guacamole with nachos and a beer. 17 September 2012: Vegetable stew with tortillas at Coco Beach. 18 September 2012: Vegetable stew with fish at Montezuma Beach. 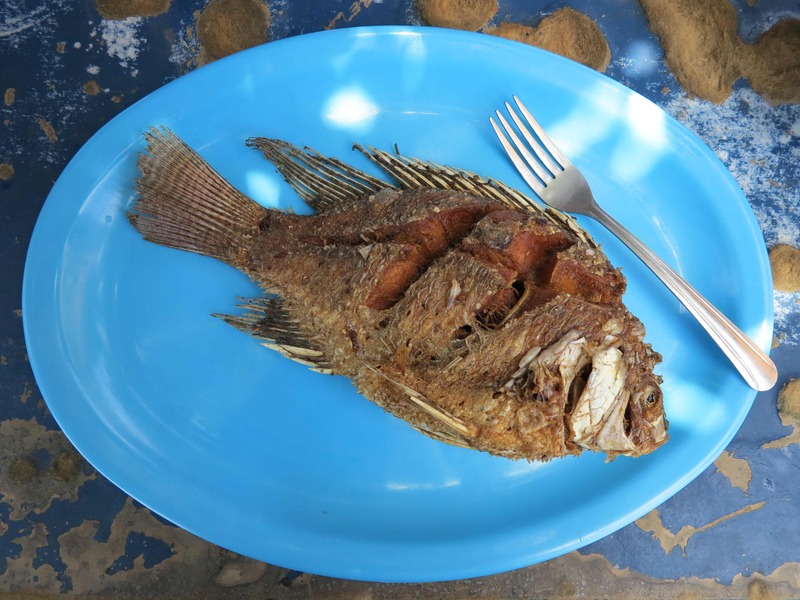 19 September 2012: Fresh red snapper grilled over open fire with timian. 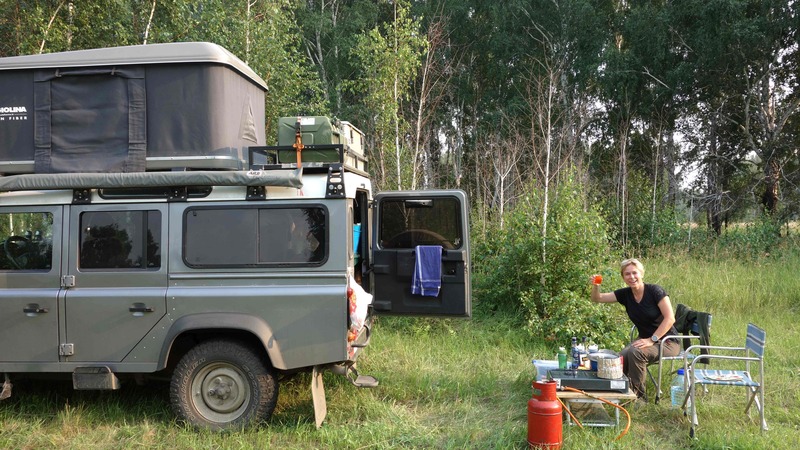 We are having a reunion with Thomas and his Defender plus Nadine and Lily at Samara Beach! 20 September 2012: Green salad and pasta salad with avocado and leftover potato and fish from yesterday. 21 September 2012: We drove over the mountains, close to Monte Verde, to the Laguna de Arenal. Very rough road in places, Frida was enjoying it a lot! When we finally found civilisation again we had the classical lunch: Chicken breast with rice and beans. For dinner, bread from the German bakery in La Fortuna with cheese. 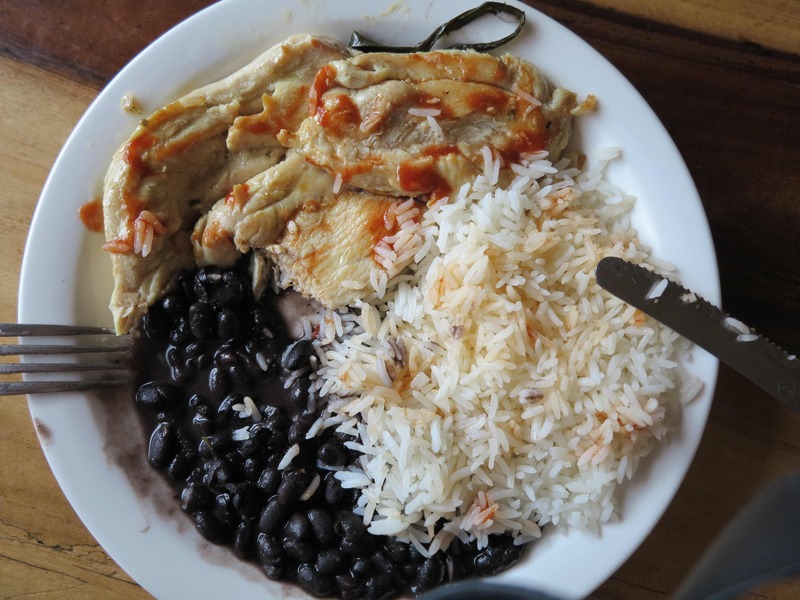 The classical central american dish: Chicken with rice and beans. And a bit of hot salsa on top. 22 September 2012: Vegetable stew with tortillas. 23 September 2012: Tonight we had Carribian cuisine in Tortugero, on the Atlantic Coast. We had shrimp in a delicious coconut/tomato sauce and rice cooked with beans and fried in coconut oil. 24 September 2012: Carribian night again! This time chicken cooked in a coconut sauce, really delicious. 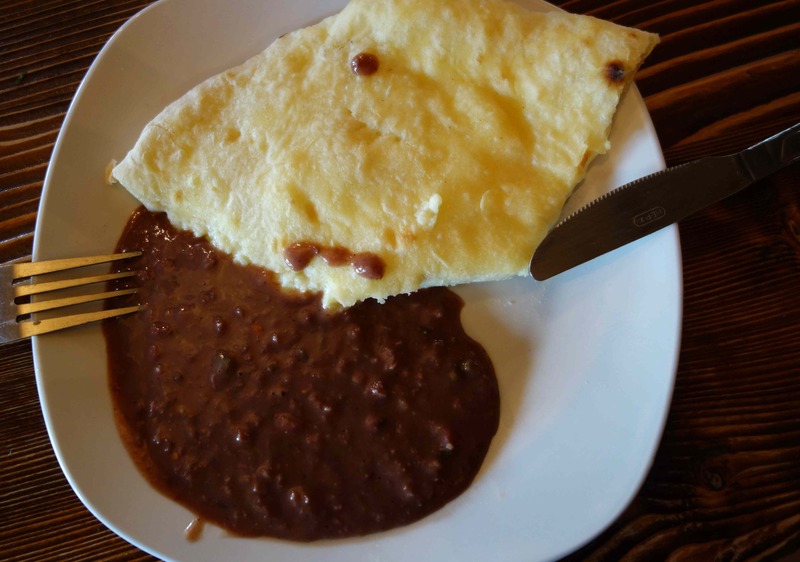 25 September: Pupusas with beans! We found a lady from El Salvador making pupusas from a small kiosk on the road. Pupusas, we love you! 26 September 2012: Argentinian empanadas at the Jaulares Restaurant who kindly let us sleep for free in their parking lot. Close to Volcan Poas. 27 September 2012: Vegetable stew at Manuel Antonio. 28 September 2012: Pasta with avocado. 29 September 2012: Rice with carrots at the Base Cretones Hut on the way to Cerro Chirripo. 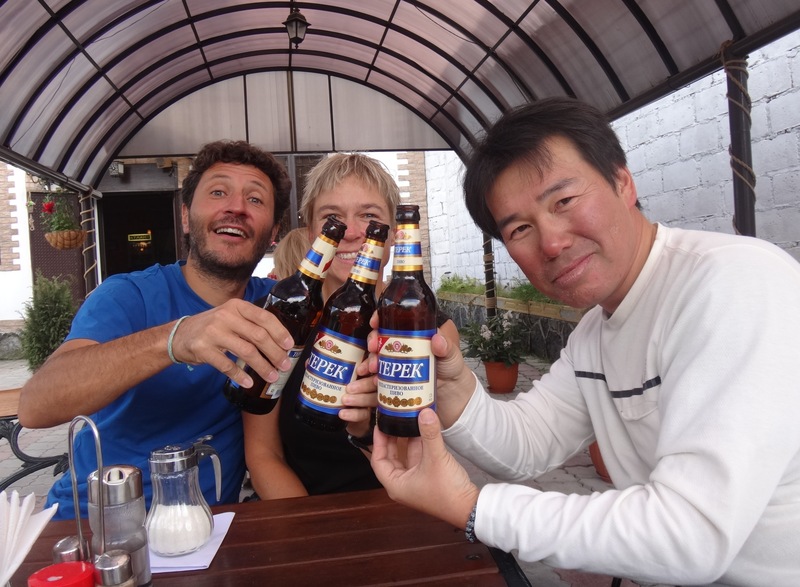 30 September 2012: Fresh pan fried trout and beers after a successful ascent of Cerro Chirripo. 1 October 2012: Eggplant/ginger veggie stew. We are sleeping for free on the property of a beautiful rancho! Woken up in the morning by the hungry geese. 2 October 2012: Pasta and tortillas with ragu’ (ground meat and tomato sauce, cooked with cloves and peperoncino). Tonight we are climbing Volcan Baru in the moonlight. 3 October 2012: Swedish pickled herrings in mustard sauce with boiled eggs (3 each! ), boiled small potatoes and fresh tomatoes. We finally found a place to sleep in a Chiquita owned recreational area north of Almirante. Dinner background music was supplied by the ongoing arobics class next door (uno, dos, tres, cuatro, cinco, seis, siete, ocho, ocho, siete, seis cinco, cuatro, tres, dos, uno….). 5 October 2012: Still at Loma Lodge. Tonight we had a mango/vodka/lime/and-a-dash-of-something-else cocktail for appetizer (Henry makes fantastic cocktails), a spicy pineapple salad with cilantro for starter and then a delicious Chicken Mole for the main dish made with homegrown chicken and cocoa! Served with pan fried red cabbage and rice. For desert a passion fruit pudding and homemade chocolate truffles. Delicious!!! 6 October 2012: Back to reality. We drove to Panama City and had a very boring Caesar’s salad for dinner. 7 October 2012: In Panama City. Chicken wrap with salad at the hotel. 8 October 2012: Shrimp ceviche for lunch at the marina in Panama City. Making paperwork for exporting Frida! 9-10 October 2012: Every night chicken wrap with salad at the hotel! Looking forward to the fresh baked German bread on the sailboat from tomorrow and the next 5 days…! Got Frida in the container today so we are all ready for the journey to Columbia. 11-14 October 2012: We are on board the catamaran Jacqueline with the German captain Fritz and we are eating kaiserschmarrn, “frikadeller”/meatballs with cold potato salad, beef roast with macaroni, lentils with fried eggs, fried sausages with mashed potatoes and soft brown onions and of course lots of German dark bread! Fritz in the kitchen, supervising the preparation of the soft brown onions. 15-21 October 2012: We are in Cartagena, waiting for the cars to arrive with the container. During the day we are eating empanadas colombian or argentinian style. And in the night cooking something at the hostel (ragu with pasta, vegetable stew with bread, pasta with eggs (carbonara without the bacon), asien style chicken with rice and spicy pineapple salad, spanish style tortilla omelette). 22 October 2012: We left Cartagena at 7 pm, just as we got the cars out of the port. 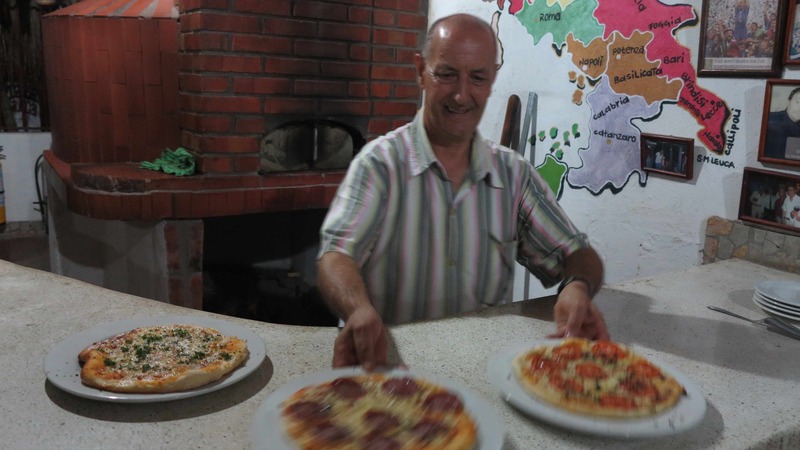 About one hour south we found the Pizzeria La Fattoria, run by Salvatore from Lecce in Puglia. 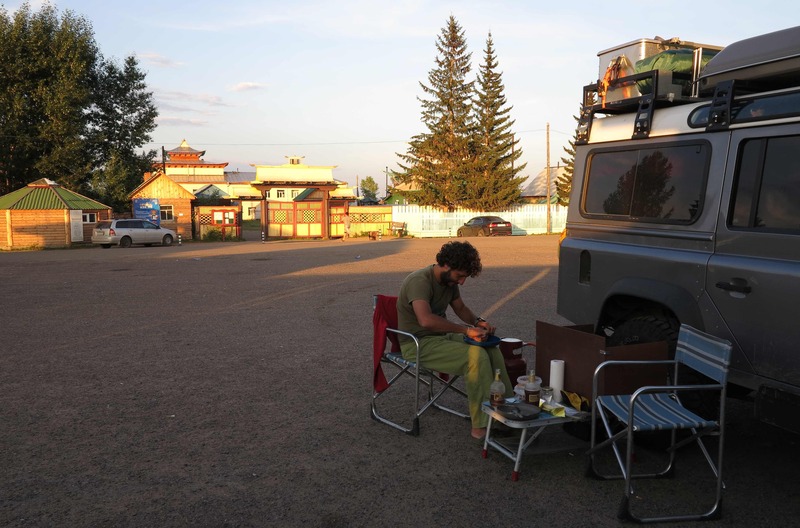 We had a good pizza and a beer and a good nights sleep in the parking lot of the restaurant. 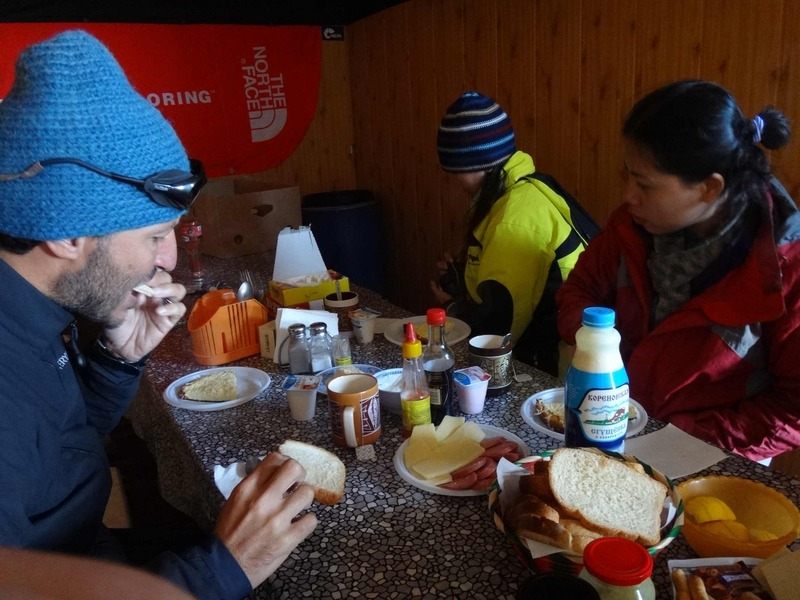 In the morning we got up at 4 am….and Salvatore and his wife were ready with espressos, hot chocolate and sandwiches! Salvatore serving our pizzas straight out of the oven. 23-25 October 2012: We stayed in Medellin with Jorge and Mechas. On Jorges birthday, 25 October, we were invited to a true Colombian barbeque with grilled sausages, marinated pork chops and steaks. A lot of meat but very tasty and excellent company! 26 October 2012: Before leaving Medellin we had lunch at our now favourite restaurant: Beans, rice, fried platano, avocado and arepas (delicious grilled corn balls). It sounds simple but it does not get any better! In the evening we stayed overnight at a coffee farm close to Manizales and we ate our own home made tabouleh. 27 October 2012: We stayed overnight at the hot springs at Coconuco. We ate one banana and four alfajores! 28 October 2012: At the border to Ecuador. We made the usual favourite omelette with potatoes and indian spices. 29 October 2012: Arrived to Quito. For dinner shrimp cheviche. 30 October t0 6 November 2012: On board M/S Samba, sailing around the Galapagos Islands, eating very nice Ecuadorian/International cuisine. It is too much to mention all the things we ate….it will be enough to say that every day we had dessert twice: At lunch time and at dinner time! 7 November 2012: Shrimp empanadas and chicken with rice and beans in Quito. 8 November 2012: Our own lovely vegetable stew, prepared at the start of the trail to Illiniza Norte. 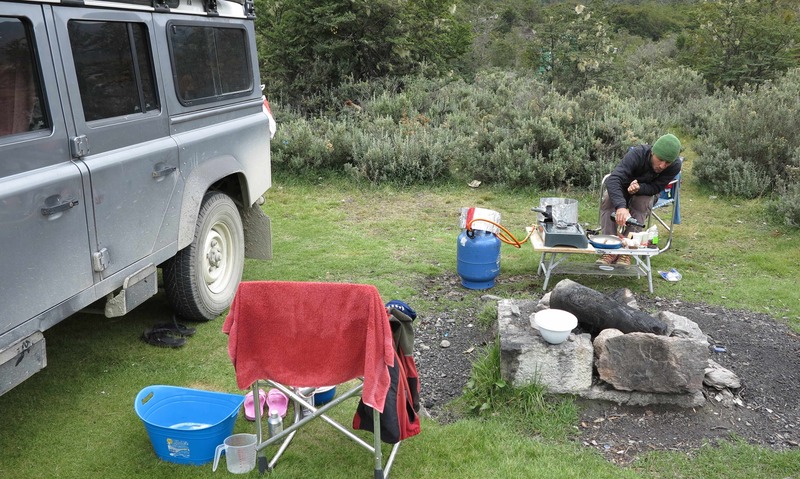 9 November 2012: For lunch, pork rice and lentils as we came down from the Illiniza Norte mountain. For dinner, potato soup with cheese and avocado, chicken breast with rice croquettes and red cabbage salad, guayabana mousse. We are eating too much! 10 November 2012: Spaghetti with a can of tuna and ketchup! We are in the hut at 4800 m on the Cotopaxi volcano, ready to start the climb at midnight! 11 November 2012: Very hungry after a successful climb of Cotopaxi! First we had a 6 egg omelette with potatoes for lunch and then for dinner we had potato soup with cheese, steak with vegetables and mashed potatoes and chocolate cake for dessert. 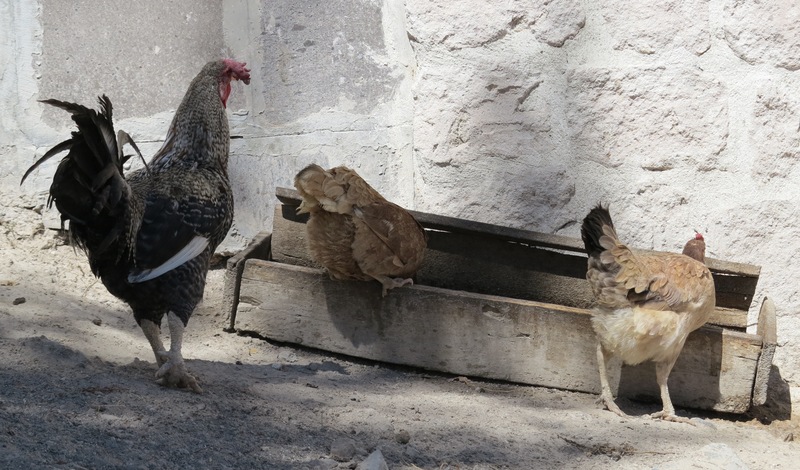 12 November 2012: We arrived to the hot springs near Cuenca – we had a dry piece of chicken breast with rice for dinner…it was late! 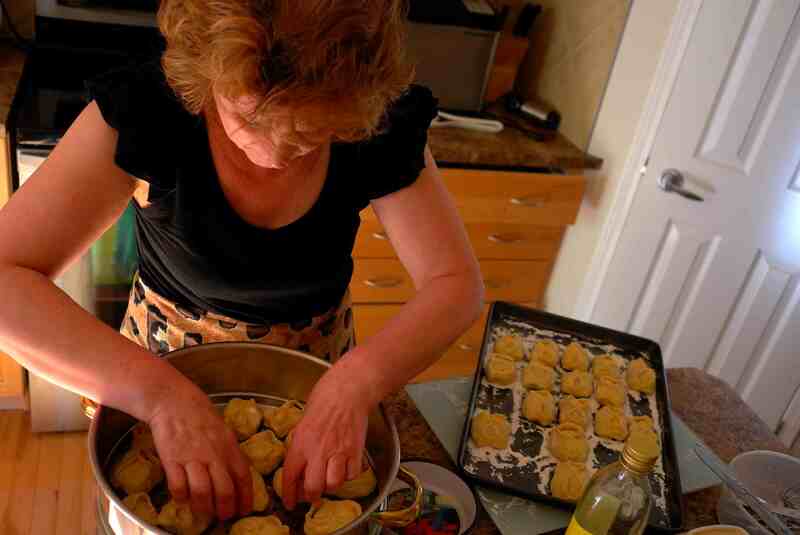 13 November 2012: In Saraguro, we made veggie stew with tortillas. 14 November 2012: Enter Peru! We slept in Piura and had 2 burgers each for dinner! They were fantastic, uhmmmmm, made on charcoal. There were 4 guys working at the barbeque full time and the small place was full of people (no places to sit, only pickup). We had one classic burger each (it included 5 different sauces of which at least one was very spicy), walked around the corner to eat them, then returned, had another classic burger each, walked around the corner to eat it, and then we barely managed to crawl back to the hostel. The best burger we ever had outside the US! 16 November 2012: Pasta with stir fried red cabbage/tomato sauce. 17 November 2012: Dinner at the Way Inn Lodge, potato soup, pan fried trout (peruvian speciality), and strawberry roll with dulce de leche for dessert. 18 November 2012: Freeze dried pasta primavera…hmmmm. 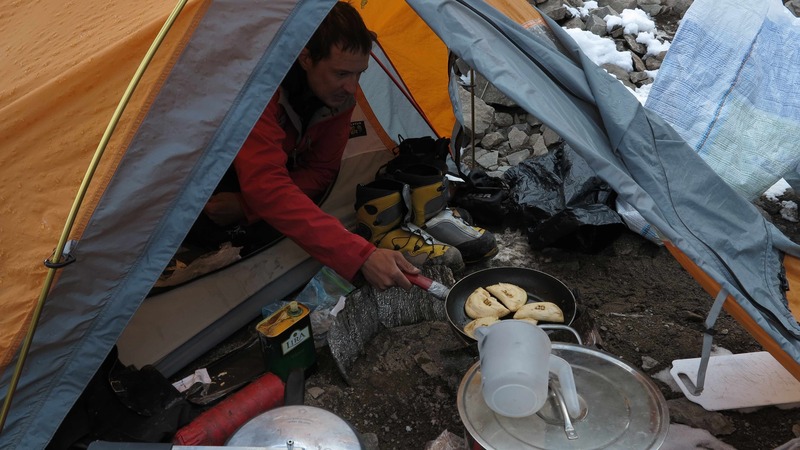 19 November 2012: Freeze dried teriyaki chicken in the Refugio Peru at 4680 m, after coming down from Nevado Pisco 5752m. Delicious! 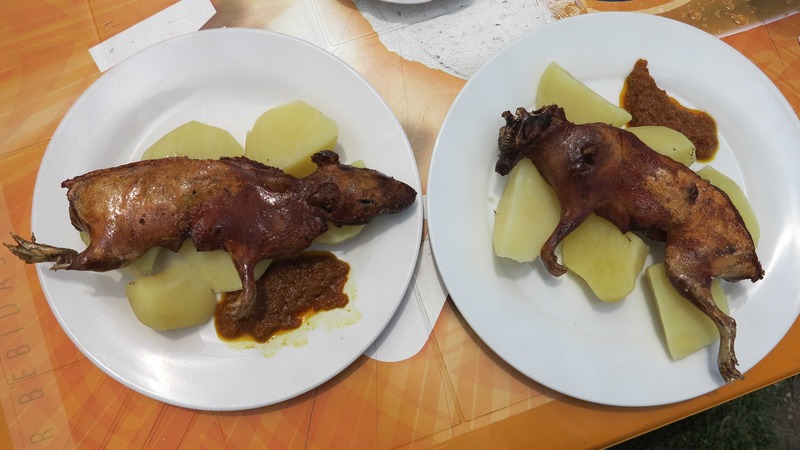 20 November 2012: For lunch: Half a guinea pig each with potatos and spicy sauce. Then we ate a lovely 3 course (normal) dinner at the Way Inn Lodge. We were hungry after the Nevado Pisco climb! And there was not a lot of meat on the guinea pigs…poor! 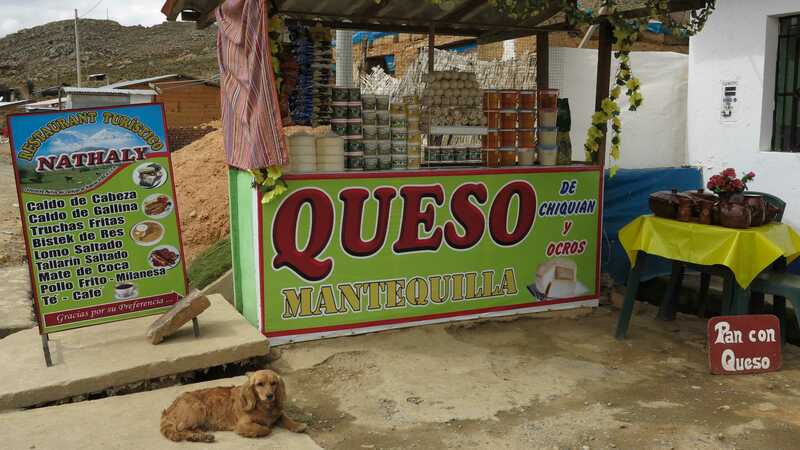 21 November 2012: Arrived to Lima, for dinner we had cheese sandwiches with fresh farmers cheese from the small road side shop below. 22 November 2012: In Lima! 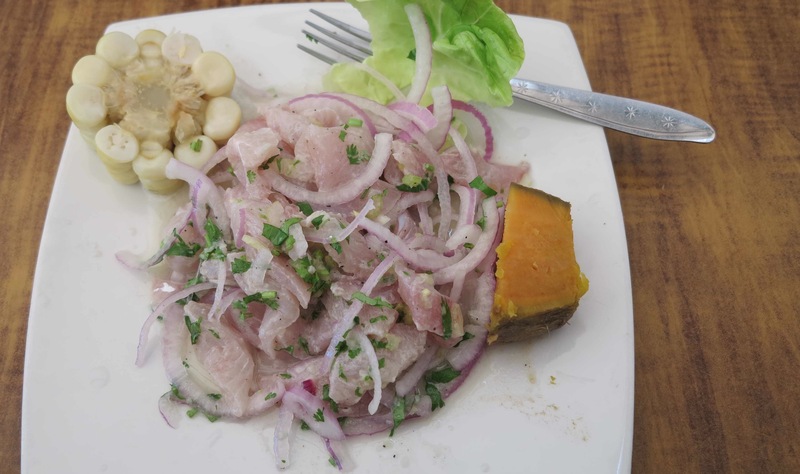 Delicious ceviche for lunch, see photo below. For dinner, two Pisco Sour each and a couple of empanadas from the bakery around the corner. Life is good! 23 November 2012: In Nazca. Pasta with tomato sauce, canned salmon, dark bread. 24 November 2012: We drove for 12 hours over high mountain passes to reach Cusco, 3400 m. For dinner we had alpaca steak and local trout. Delicious! 25 November 2012: Alpaca steak again! It is really tasty. 26 November 2012: Pasta with guacamole at the Titicaca Lake. 27 November 2012: Marco ceviche, Malene ravioli with spinach. Last night in Peru. 28 November 2012: Mashed camote with rice. We love the camote! In Peru they serve it boiled with the ceviche. It is sweet and delicious. 29 November 2012: Leftovers from yesterday with fresh goat cheese. 30 November 2012: Spicy omelette with potatoes. An old time favourite! Today upgraded with a view to volcanos. 2 December 2012: A big, juicy, tasty argentinian steak with a good bottle of red wine on the old beautiful square in Salta! Aaaahhhh Argentina! 3 December 2012: Empanadas for lunch, empanadas for dinner. We are in empanada heaven! Today we are eating a selection of empanadas with cheese, chicken, meat and dried meat. 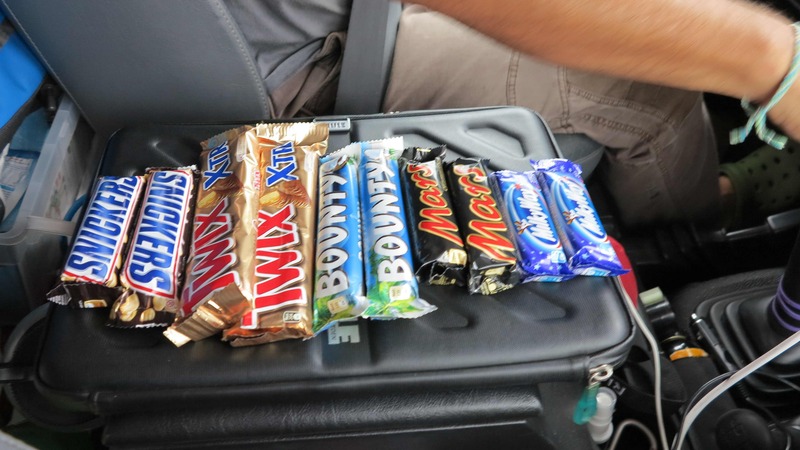 Seems we might gain some kg in Argentina…. 4 December 2012: Empanadas with meat and with quinoa. We are in the small town of Cachi, ready to go hiking for 5 days up the valley towards Nevado de Cachi. 5 December 2012: Freeze dried asian style rice with chicken in between the thunderstorms! 6 December 2012: Down from the mountains again! The weather was a bit too much… Tonight pasta with peperoncino. Unfortunately we had made only a portion for two so there was not enough for all the unexpected visitors! 7 December 2012: We drove to Cafayate, the local wine district. For dinner we had pasta with fresh tomato sauce and a good bottle of local red wine (merlot). 8 December 2012: Each 1/2 kg icecream for lunch! Then a freshly baked bread with inside cheese for dinner and an alfajores + a conetto for dessert. The icecream was from Miranda in Cafayate where they invented the wine sorbet. We had Sorrento (white wine) sorbet with dulce de leche icecream and cabernet (red wine) sorbet with chocolate and tiramisu icecream. It was unforgettable!!! Do not miss the Miranda icecreams if you ever come to Cafayate! 9+10 December 2012: Driving across northern Argentina from west to east. Vegetable stew and rice with parmesan. 11+12 December 2012: Minced meat with tomatos and a touch of peperoncino served with mashed sweet potatos and minced meat with vegetables served with mashed potatos. We are at the Ecological Camping in Iguazy, a wonderful place! 13 December 2012: Boring empanadas and free Wi-Fi at an Esso gas station somewhere between Iguazu and Campana. 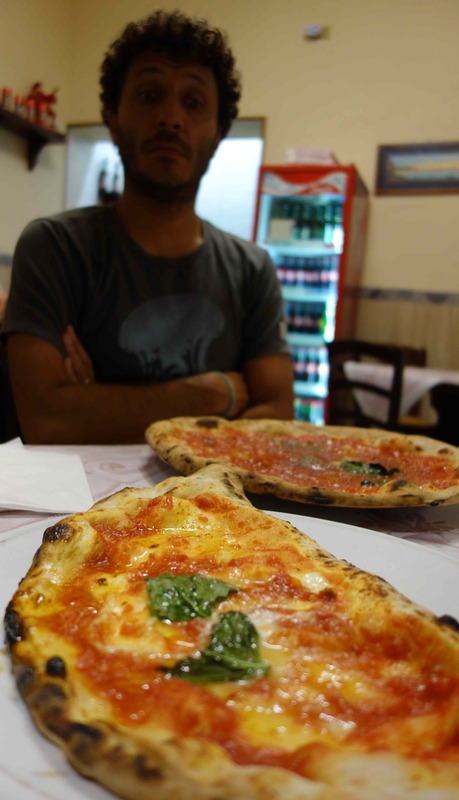 14 December 2012: All-you-can-eat pizza and a dark beer at the legendary, busy and noisy Pizza Libre in Campana. 15 December 2012: A very good pasta at the Italpast restaurant in Campana. Today we cleaned Frida inside-out and then went running 10 km so we were very hungry! 16 December 2012: Asado!!! Thank you to Fabio and his lovely family! 18 December 2012: Asado!!! thank you to Fernando and Agustina! 19 December 2012: Spaghetti al pomodoro with Torrontes white wine at 1 am – our parents have arrived to Buenos Aires for Christmas! 20 December 2012: Empanadas and salad and more Torrontes on the roof terrace. 21 December 2012: Tango show with dinner. Excellent show! 22 December 2012: Big asado lunch at a ranch outside Buenos Aires! Salad and pumpkin soup for dinner. 23 December 2012: Spaghetti al pomodoro and Torrontes wine on the roof top terrace. 24 December 2012: Christmas dinner at Cabanas las Lilas in Buenos Aires. Look at the size of the steak and the knife (!) in the photo below. It seems that Malene’s mother killed the cow herself! It was absolutely fantastic, both the food, the wine and the company of our parents! 25 December 2012: Dinner “at home” in our apartment in Palermo Viejo, smoked salmon, parma ham, provolone cheese, pate, olives, tapanades, etc and finally the traditional Danish “risalamande” for dessert including the hidden whole almond which was found by Marcos mother! Finally, the dinner was rounded off with another Danish tradition, the “nu-er-det-jul-igen” dance around the house! Thank you to the Italians for putting up with the Danish and their strange traditions!!! 26 December 2012: Dinner at Patagonia Sur in Boca, Buenos Aires. This is the best food we have had so far in Argentina! We had lamb cooked for 7 hours – incredibly tender and tasty – and then we had home made dulce de leche ice cream for dessert. We have tasted a lot of dulce de leche ice creams in Argentina but this one was superior, seemed to be made in heaven!!! 27 December 2012: Asado with Fabio and family in their beautiful house in Tandil. Fabio and Gisela, thank you for being so guest free, for always serving us the most delicious meats, for listening to all our stories and for making us feel so much at home when we are visiting you! 28 December 2012: Now we are living “on the street” again after a little more than a week of luxury, a lot of hot showers and a very busy washing machine! Tonight we had spaghetti alla puttanesca at a petrol station on the pampa on our way to Mendoza. 29 December 2012: Pakistani eggplant and tomatos. 30 December 2012: Spicy omelette with potatoes. 31 December 2012: New years eve in the tent in the valley of Vallecitos close to Mendoza. Something freeze dried for dinner, then a small bottle of champagne with spoonfulls of dulce de leche, slurp! 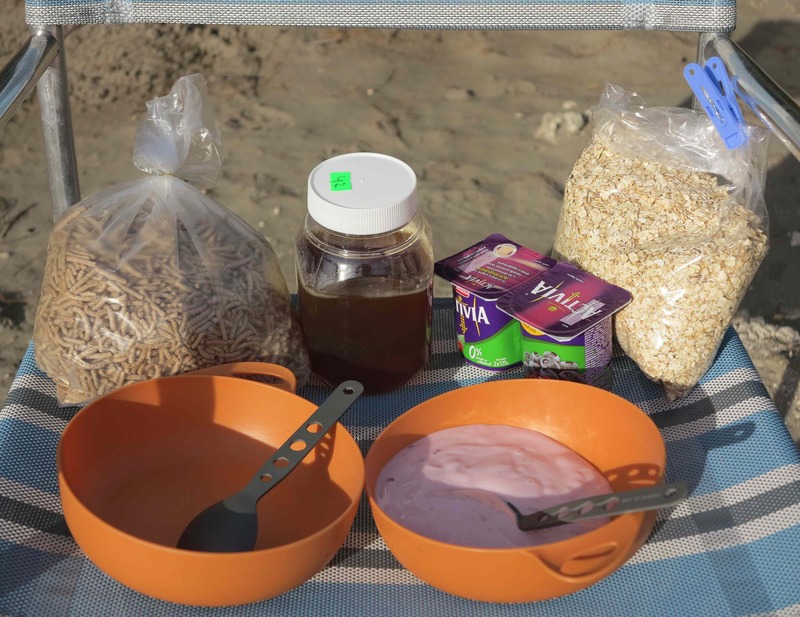 1-5 January 2013: In the mountains….freeze dried foods…except the night of the 5th where we returned to the car and had a big portion of saffran rice with a very good parmesan from Italy and an exceptional bottle of red wine from Salta! 6 January 2013: Today was a good day! We started with a good home brewed cup of coffee with the delicious biscuits of Malene’s mother (hjemmelavede vaniliekranse fra Vejle). Then we drove down through the valley and bought empanadas and tortitas caseras from a private house (tortitas caseras = small home baked breads and here in a lovely variant with small pieces of chorizo baked into the bread). Then we arrived to Mendoza and had a big juicy steak and a good bottle of red wine to celebrate that we passed the 50.000 km together with Frida! 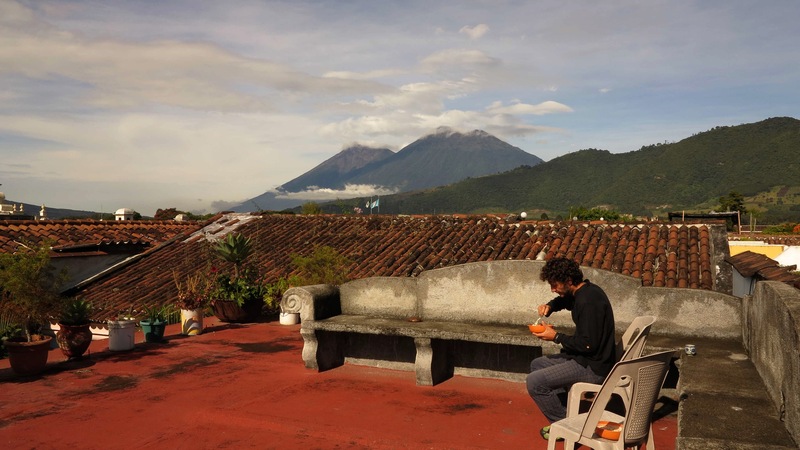 7-10 January 2013: We are in the mountains again, but this time coming back down to sleep in Frida every night and eating classic dishes like pasta with guacamole, spicy indian style omelette with potatoes and vegetable stew. Fortunately we also have a couple of very good bottles of wine in the car and they go very well with all the food. 11 January 2013: Back in Mendoza for another big tasty steak with mashed potatos on the side. 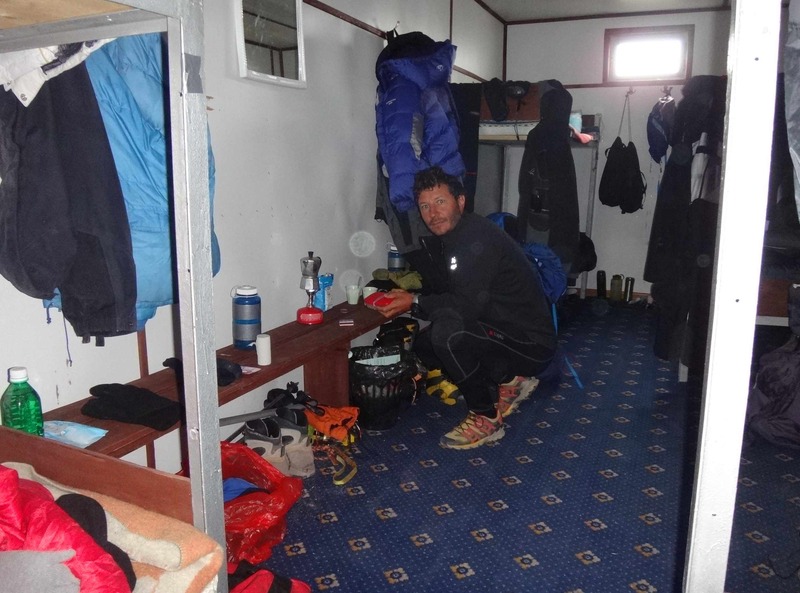 12 January 2013: Salad in the hotel room while packing our gear for Aconcagua. 13 January 2013: Steaks with the team for Aconcagua. 14 January 2013: Again steaks with the team for Aconcagua! We should have been in Penitentes but the road was closed because of a landslide. 15 January 2013: In Penitentes, ready to start the Aconcagua expedition tomorrow morning. We ate our last civilised meal for a couple of weeks: empanadas and home made ravioli with ricotta cheese. 16-17 January 2013: Hiking up the Vacas Valley. Danny made cheeseburgers for dinner the first night and the second night the muleteers made us a delicious asado/barbeque. 18-20 January 2013: Arrive to base camp at Plaza Argentina. We ate a lot the next few days: Gnocchi with tomato sauce and pork ribs with stuffed pumpkin. 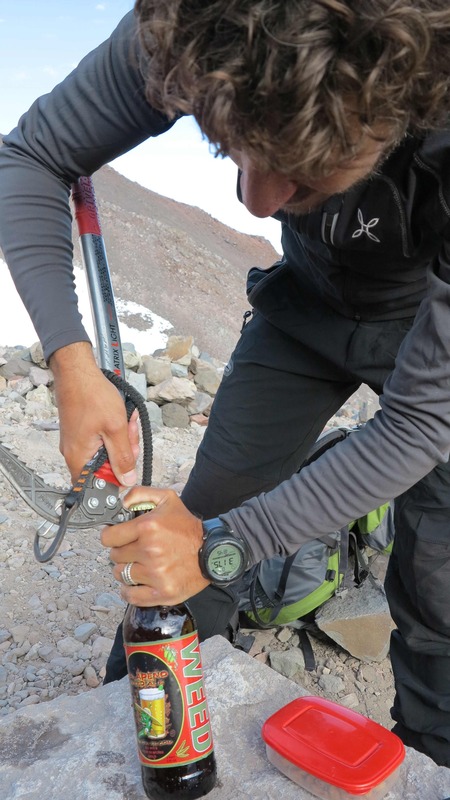 21-29 January 2013: On Aconcagua. 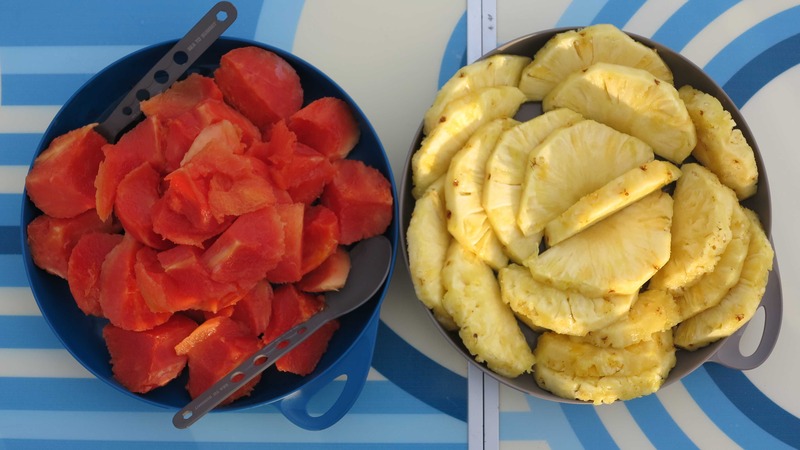 Culinary highlights include pan-fried empanadas, quesadillas with hot sauce, french toast, pizza delivered to the tent, ramen noodles with cous-cous, pea soup with lots of garlic and of course the famous oatmeal of Lhakpa! 30 January 2013: Summit day! When we came back down we ate soup and mashed potatoes with canned tuna. It was delicious! Then we crawled in the sleeping bags for a good rest. 31 January 2013: Descent to Plaze de Mulas. Here we had hamburgers with fries and coca cola for lunch and a big piece of meat with ravioli for dinner. Cold beers. 1 February 2013: Back to civilization in Penitentes! After a good shower we had empanadas and chicken (Marco) / steak (Malene). To drink first beer, then red wine and finally champagne! 2 February 2013: In Mendoza, going out for dinner with the team. We are hungry like wolves! Marco had shrimp salad with avocado and salmon, Malene had salad and filet mignon. Red wine Punto Final! 3 February 2013: Still in Mendoza and still incredibly hungry, we went back to the same restaurant and had empanadas with filling of blood sausage, chorizo sausage and meat for starter and an incredibly tender filet mignon for main course. For desert, creme brulet with dulce de leche and rice pudding. Red wine. 4 February 2013: We left Mendoza and drove south. Bought a lot of vegetables and made a big pot of vegetable stew for dinner. 5 February 2013: Too tired to cook so we had bread and red wine for dinner. 6 February 2013: Cous cous with eggplant and tomatos. 7 February 2013: Mashed potatos with canned tuna. The internet is too slow and our diet is too monotonous for us to keep this section of what we are eating up-to-date. In summary we are eating as many empanadas and alfajores as we can! We cannot stay in Argentina forever and in our opinion one can never get too many empanadas or alfajores. Sometimes we eat a good steak and quite often we drink a good bottle of Argentinian or Chilean wine. If we cook, we cook the usual stuff, see above! We will get back to you with news as soon as we find something more unusual or interesting to eat. 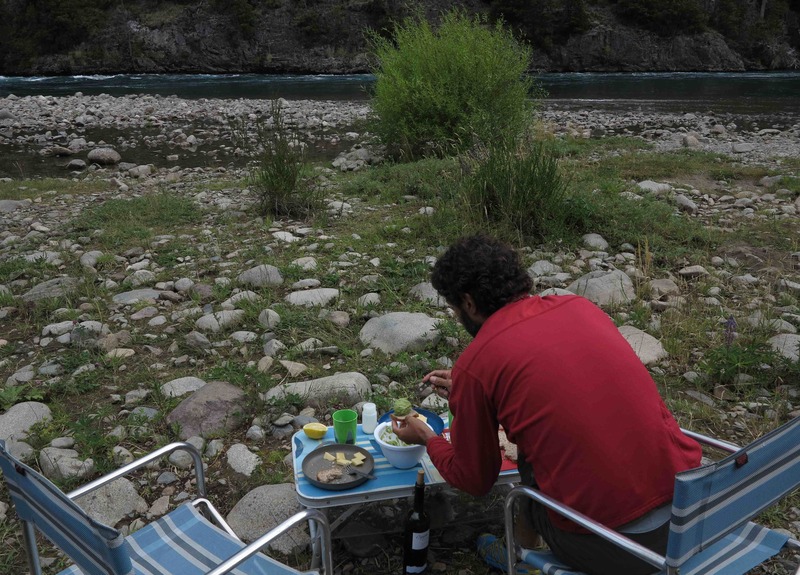 Eating left-overs at the riverbank of Rio Grande before entering Chile. Going down south to Ushuaia we crossed several times back and forth into Chile and every time the chilean border patrol is breaking our balls about bringing foods into Chile. Sometimes they have a scanner (dangerous) sometimes no, but in summary we are trying to eat all vegetables, fruits and honey before crossing the border. Furthermore, in many areas of Patagonia it is difficult to find nice fresh vegetables – or we find them and they are expensive. Alfajor: We have an important update to bring. 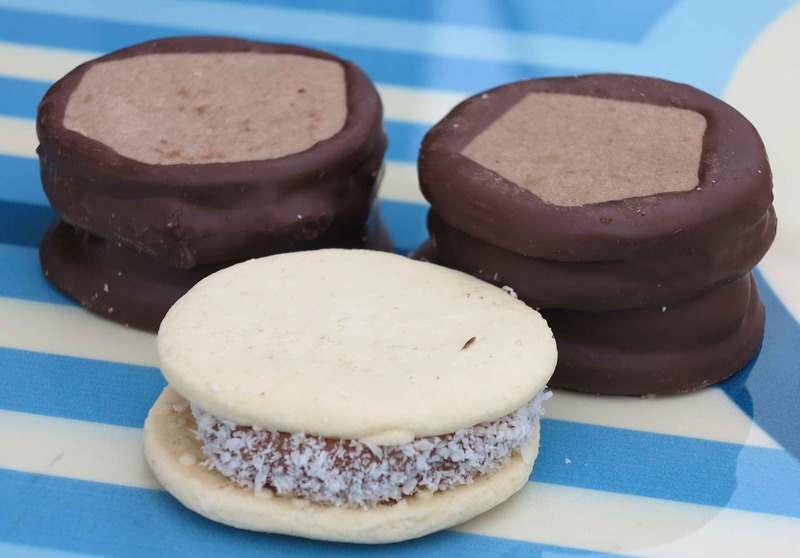 We have discovered the best alfajor in Argentina, possibly in the world! We have persistently tested the alfajores in every new city we have passed through so we consider ourselves to be kind of experts. 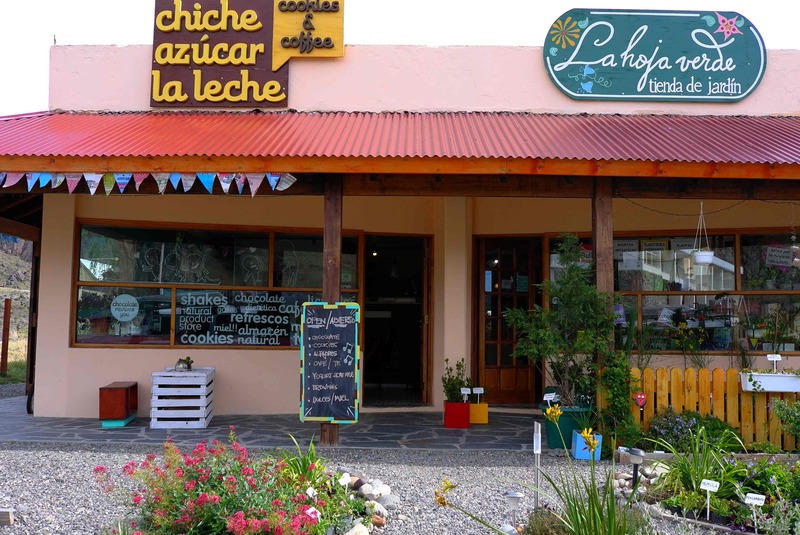 And the best alfajor we have had to date is from El Chalten in Patagonia, from a small place called Chiche Azucar La Leche (see photo below). The guy is making several varieties of alfajores, the ones with dulce de leche are all delicious, but the best best best one is double layered with three biscuits and with internal layers of dulce de leche, banana and lemon zest. It sounds strange but it tastes incredible! Chiche Azucar La Leche in El Chalten. Go here for the alfajores! A classic alfajor in the foreground and the amazing double layered dulce-de-leche-banana-lemon-zest alfajores in the background. 25 February 2013: Cordero Patagonico for dinner! We treated ourselves to a really nice dinner in El Calafate. 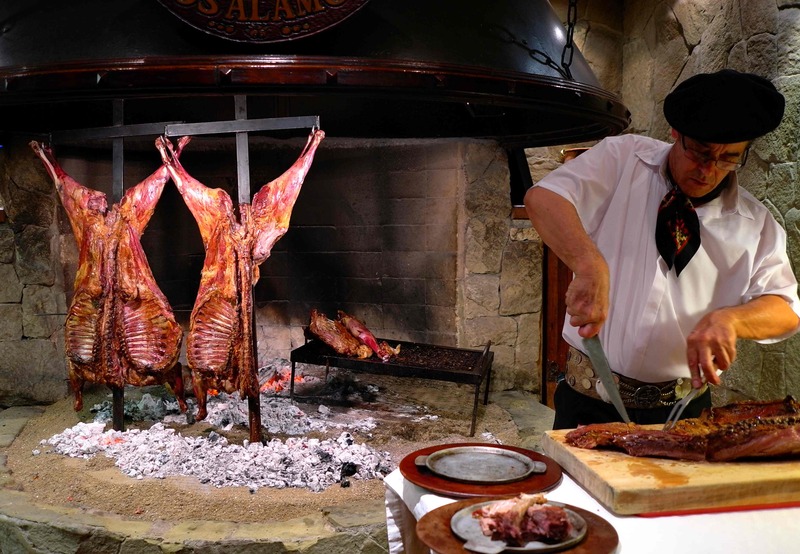 See the gaucho cutting our meat below. 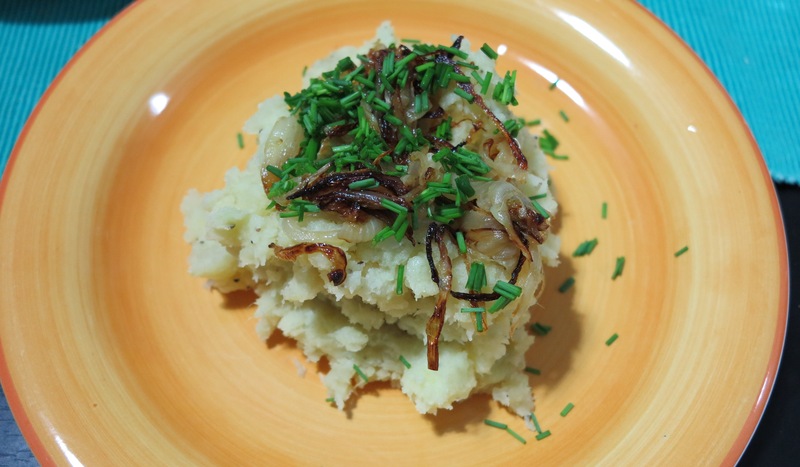 March 2013: We can report that we have re-discovered a very nice dish which is especially usefull when you are traveling through areas of few fresh vegetables: Mashed potatos with on top brown fried onions. The onions have to be completely brown and lovely. It takes more or less as long to fry the onions (slowly) as it takes to cook the potatos = perfect timing. Enjoy! Marco serving the wine after taking a cold “shower”. On days like this we like to eat cheese with honey and if we are lucky enough to find it, toasted dark bread (rugbrød). Mid March: We are now more or less vegetarians and instead of meat we eat a lot of lentils or chick peas in spicy tomato sauce. 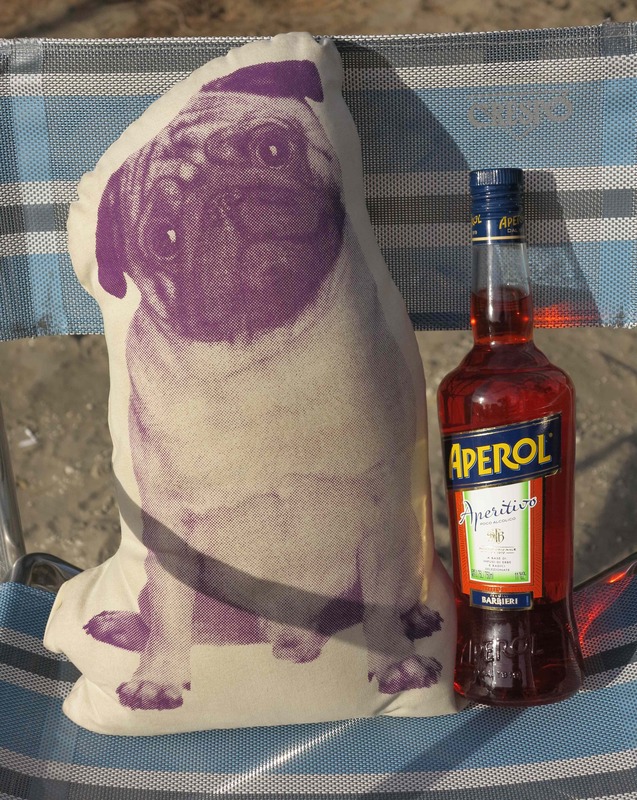 Cheap, tasty and helps you keep warm in the cold tent at night…..
…but the dinner aperitif has been upgraded significantly since we found this bottle of italian Aperol in the supermarket in Puerto Madryn! 19 March 2013: We visited our friends Luciano and Nadia in Esquel and were served a fantastic traditioan argentinian dinner: First “picadas” (cheeses, salamis, nuts and prosciutto) and then the famous “milanesa”, breaded beef steak, the national dish of Argentina! Thank you so much to Luciono and Nadia and to Martin who let us sleep in one of his cozy cabins when we could not eat or drink anymore! 25 March 2013: We changed country but still did not change menu! At “La Noma” restaurant in Santiago, eating one of our all time favourites…..the mashed potato with fried onion and chives on top! 27 March 2013: Hoooopla, back on the pisco sour again! But at least we also ate something: Ceviche for starter and then a fantastic fish soup (called Levanta Muertos!). We are in Valparaiso, a surprisingly nice and interesting city on the chilean pacific coast. 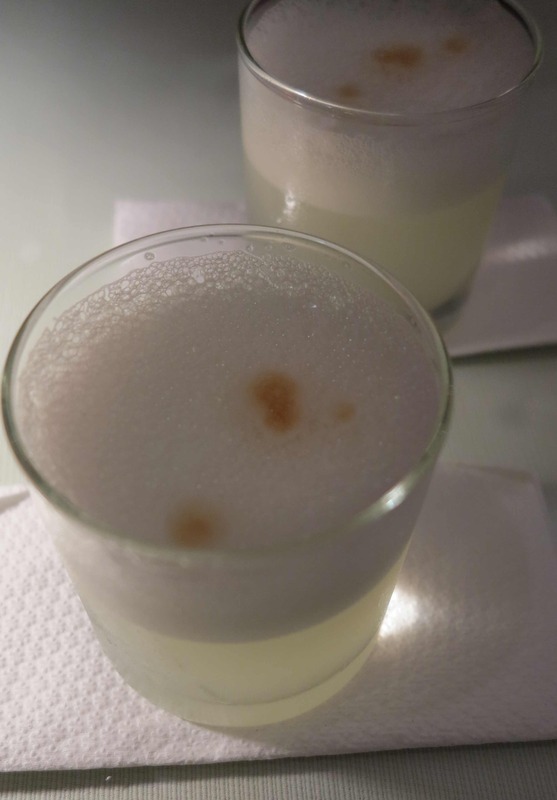 28 March 2013: Again, the pisco sour! 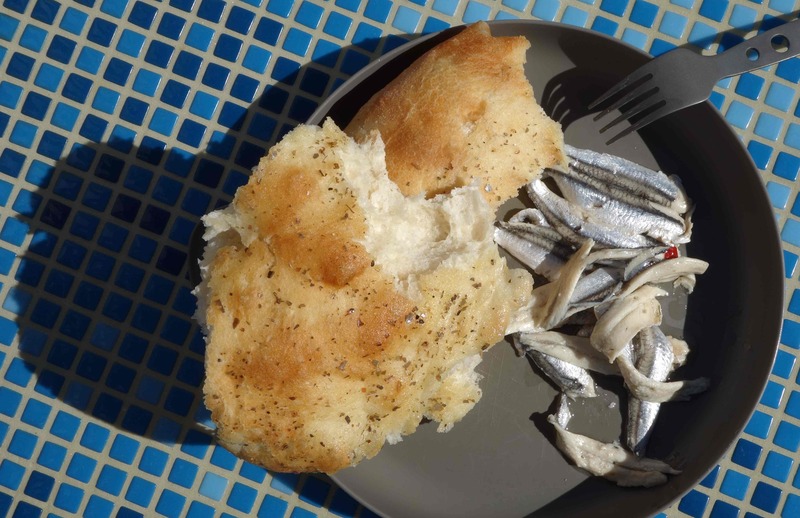 And tonight with a plate of the local fish, “reineta”. 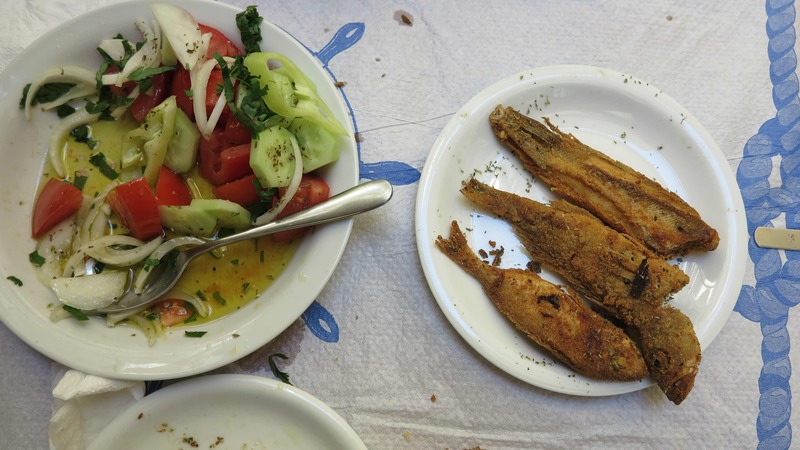 The fish here in Valparaiso is delicious! 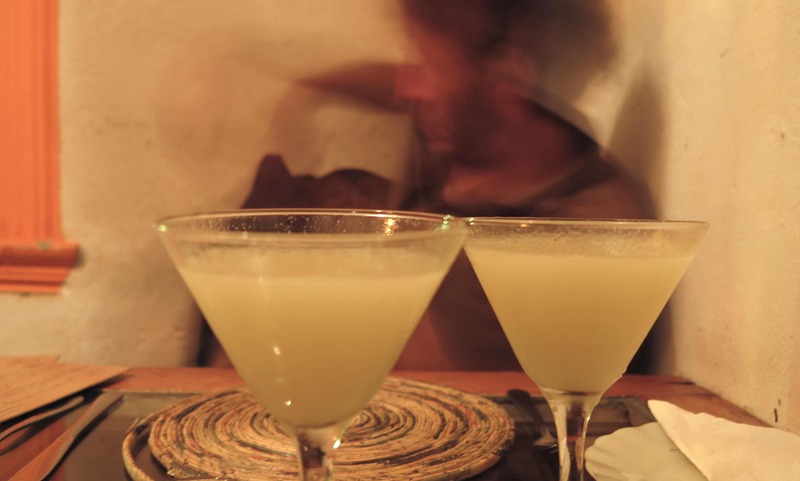 Pisco sour….very nice, very dangerous! 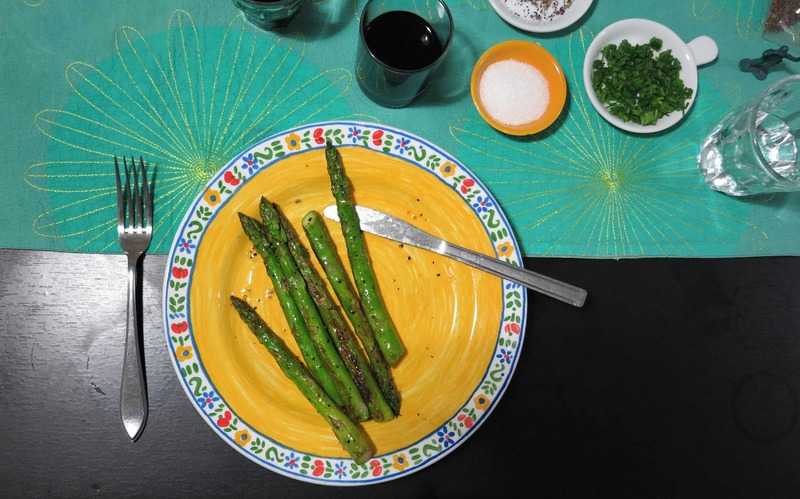 29 March to 4 April 2013: Mashed potatoes with basil, pasta with tomato sauce and basil, mashed potatoes with basil, pasta with tomato sauce……and then suddenly: Pan fried fresh green asparagus with olive oil, salt and pepper. What a joy! And accompanied by an excellent chilean red wine from Viu Manent. We are at a small Bed & Breakfast in Santiago and we are utilising their kitchen to the max! 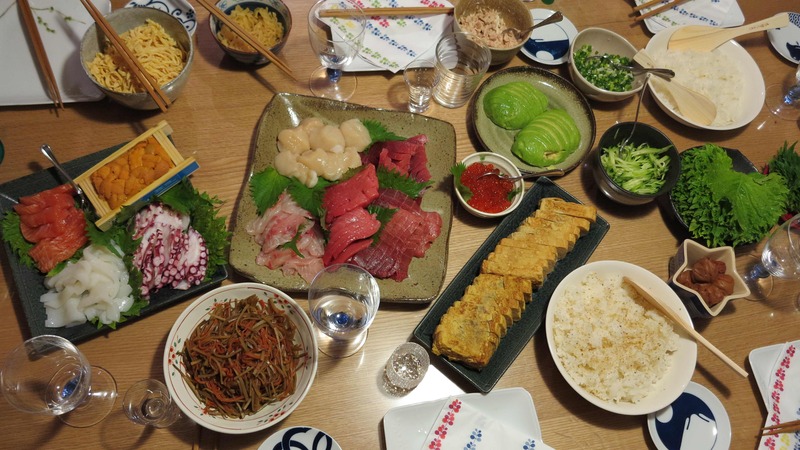 6 April 2013: How to describe in words the culinary feast that Claudio and Yuko’s family had prepared when we arrived to Japan! 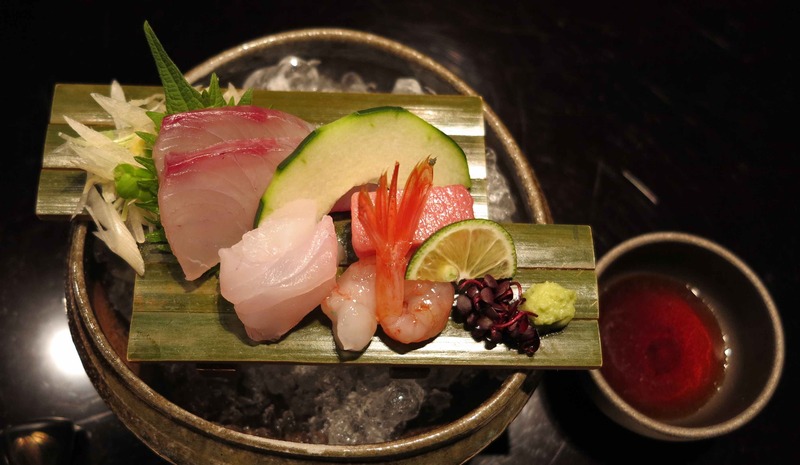 Make-your-own-sushi with a fantastic selection of ingredients including crab brain and sea urchin. Thank you guys and happy birthday to Claudio and Dani!!! 7-8 April 2013: The next couple of days we ate lots of good food including spicy ramen noodles, indian style curry (which is also very popular in Japan) and dim sum. 9-11 April 2013: It is becoming increasingly difficult to describe what we are eating as most of the time we simply don’t know! So we have to substitute text with photos. 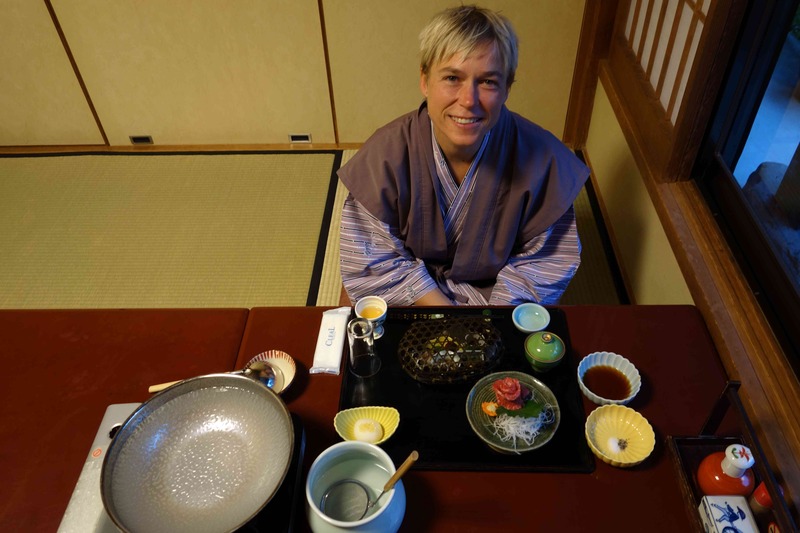 Right now we are in a ryokan, a traditional Japanese guesthouse, in Nikko north of Tokyo and they are serving us very nice traditional Japanese food. 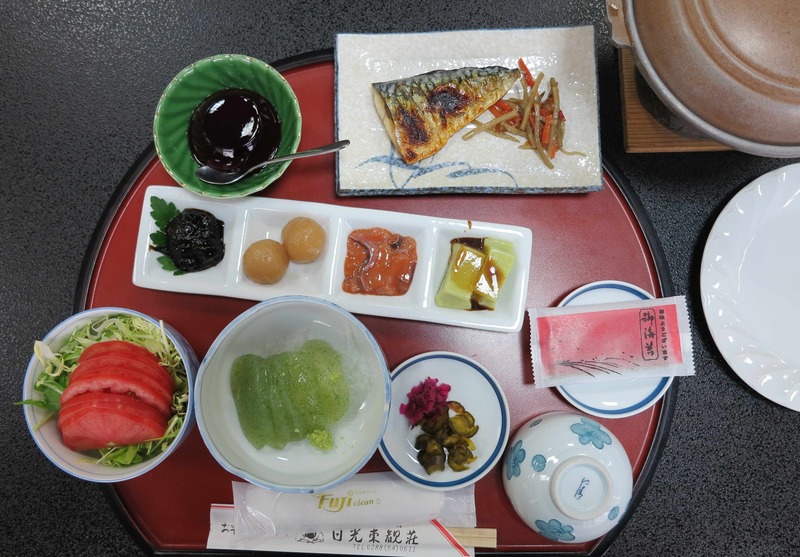 Example of breakfast – on the picture is just missing the rice and the miso soup. Example of dinner – add rice and miso soup. 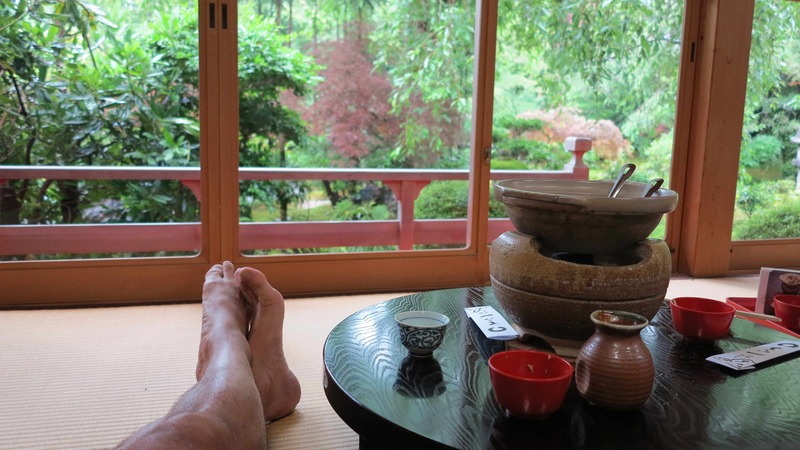 13-14 April 2013: We spent the weekend in a fantastic ryokan – Japanese guest house – on the sea with a view to Mount Fuji. The food was incredible!!! Pictures below. Green tea and snacks in the room when we arrived. Unfortunately the bigger package contained a rather smelly dried fish! When we are out walking around we often grab something quick for lunch – and we aim to try as many different things as possible! Here some nice examples of lunch and snacks. 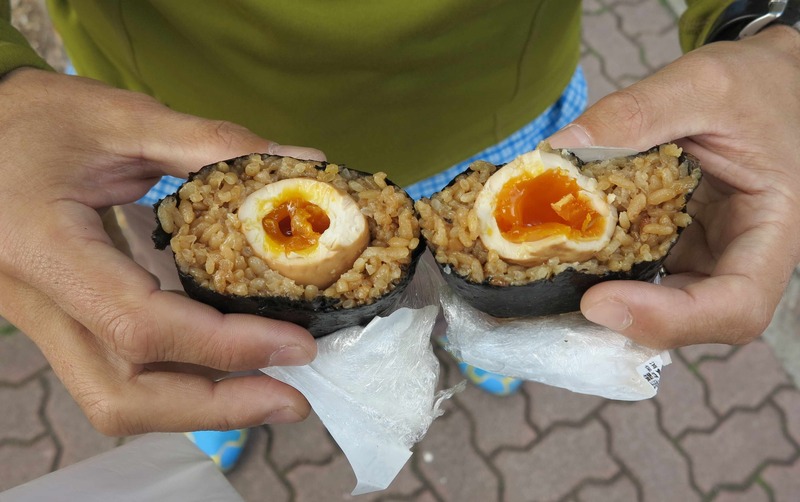 Onigiri with a whole egg inside. Very tasty! 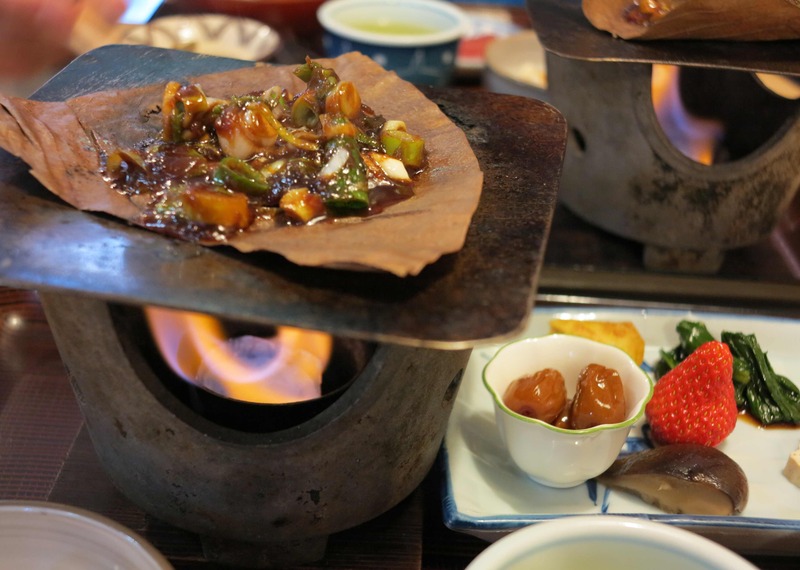 Daifuku – mochi rice cakes with a filling of sweet red been paste and heated on the grill. Delicious! 16-19 April 2013. 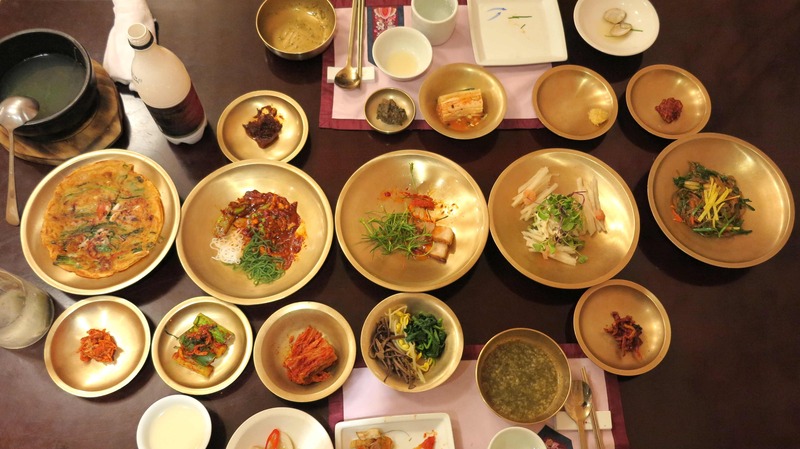 We took a quick trip to South Korea and ate like emperors! And we tried about 5 different kinds of alcoholic beverages, our favourite being the korean rice wine Makgeolli, a milky white drink made by fermented boiled rice (can be seen in the cups below). Delicious and refreshing! 20-30 April 2013. We are back in Japan, fully enjoying all the different foods we have the opportunity to eat! 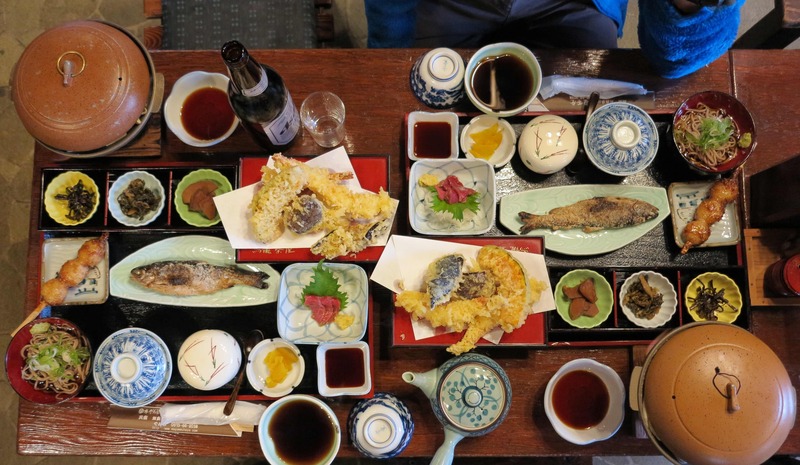 Below are some examples from our recent travels west of Tokyo to the Sea of Japan. Breakfast is the most difficult meal of the day for foreigners like us. 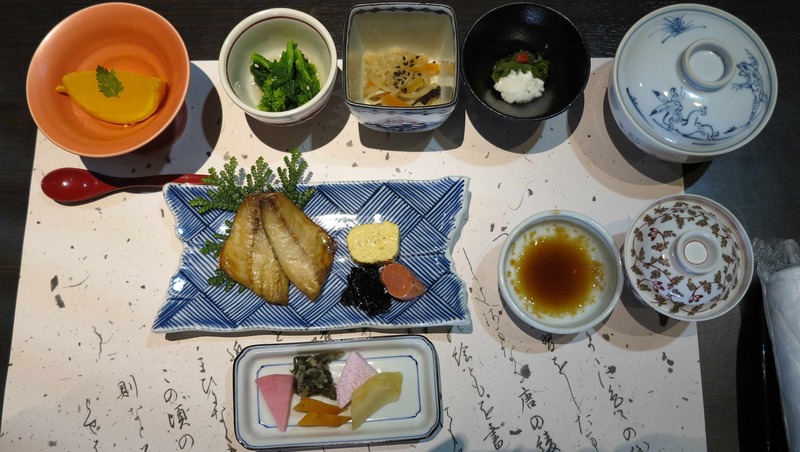 Forget about yoghurt, bread, cheese and jam and prepare yourself for fried fish, (almost) raw egg, raw fish, sour pickles, rice and miso soup. 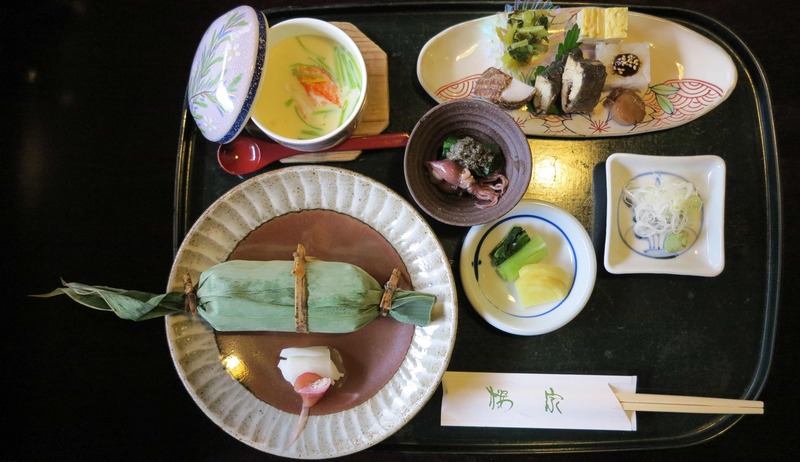 Lunch in Matsumoto with the local speciality sasamushi – eel steemed in rice wrapped in bamboo leaves. 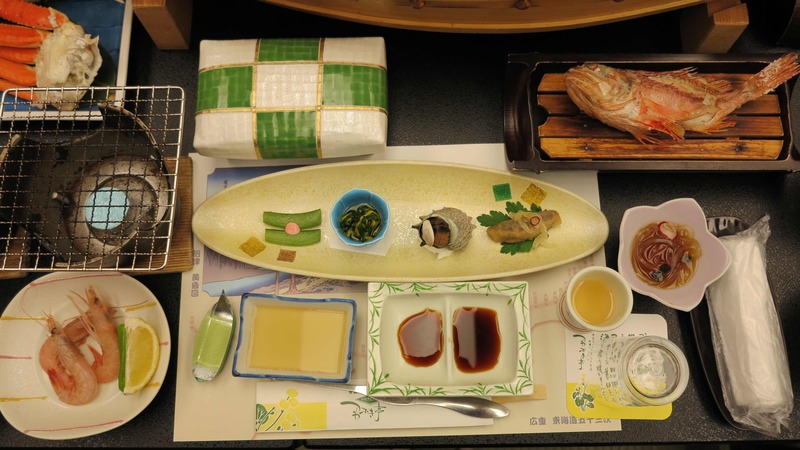 The small dish in the middle contains very small, raw squids. A delicacy, but requires some determination to eat (for Malene at least)! 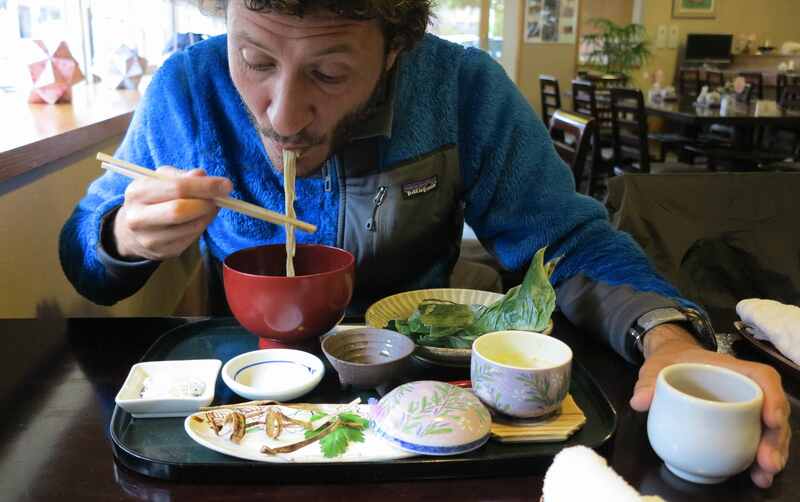 Marco enjoying his cold soba noodles – zaru-soba. Lunch in Takayama. Green onions are frying in a tasty soy sauce before being mixed with the rice. Lunch in Kanazawa. 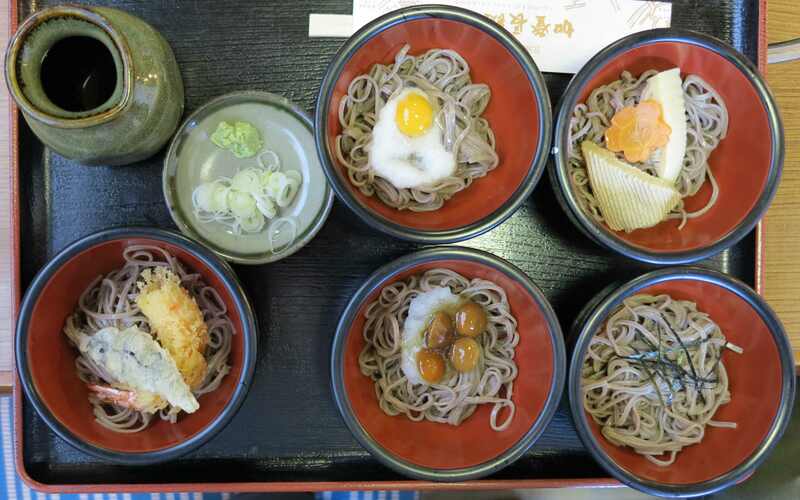 Five different types of cold soba noodles. Dinner in Magome at our guest house. 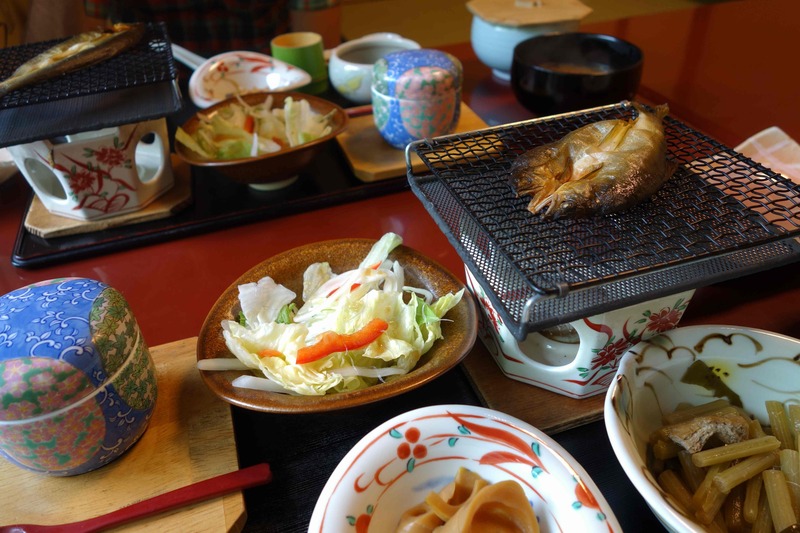 You have the tempura there in the middle, the usual fried fish (always very tasty and always full of small bones, i.e. lots of work with the chopsticks! 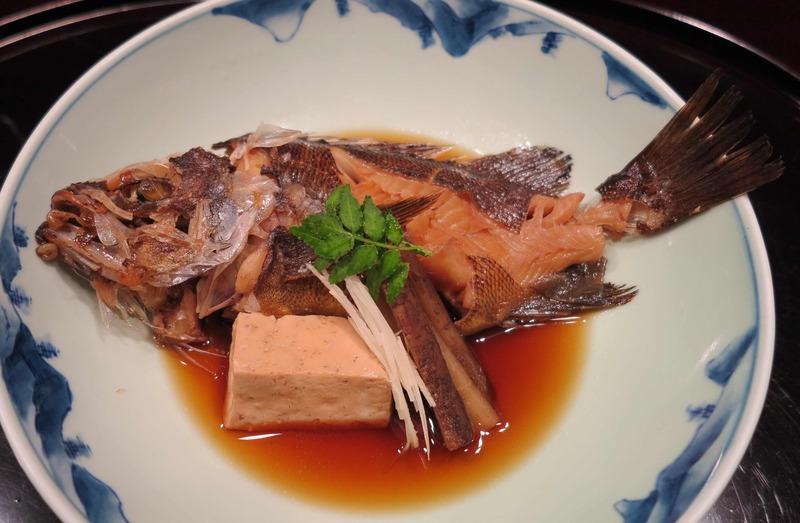 ), then to the left of the fish the barbequed mochi (paste of glutinous rice) with soy sauce, then there are some different vegetables in different dishes, there is the dish of cold soba noodles, the usual pickles of different types of vegetables, the miso soup and a bit of sashimi. 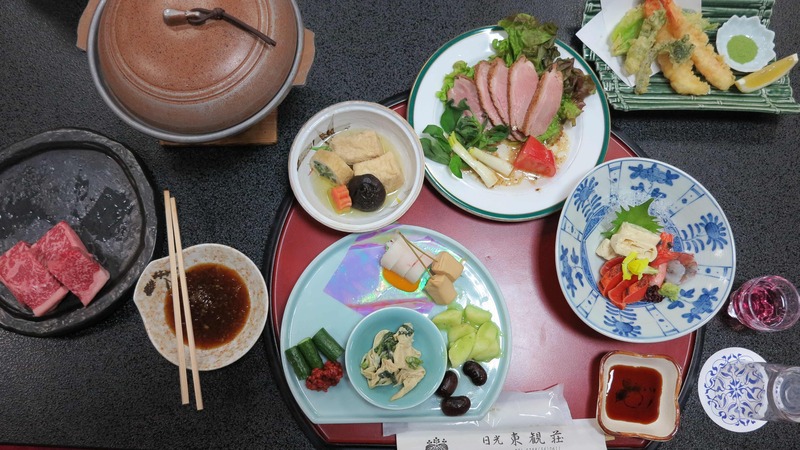 Exclusive dinner in Kanazawa with lots of small dishes and lots of seafood. 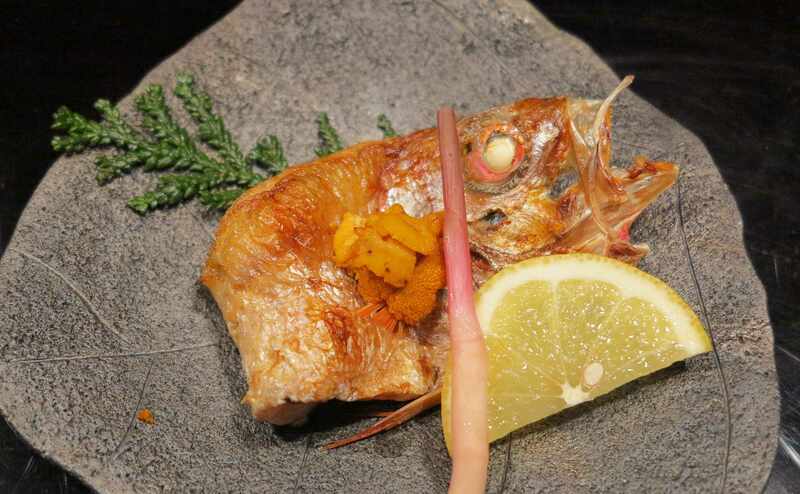 The orange stuff on top of the fish is sea urchin – very strong taste but ok with a squeeze of fresh lemon on top. He may not be beautiful, but he was very tasty! 1-8 May 2013: We are eating out and we are eating in! In the house we are eating delicious gyoza (japanese fried dumplings) or we are making a pasta or mashed potatoes (yeah!) with meat sauce. Outside in restaurants we have been eating yakitori, which is meat or vegetables grilled on skewers, and okonomiyaki, a kind of thick japanese pancake, very tasty. And one night we went out to a very authentic Indian restaurant in Tokyo for some (very) spicy curries. 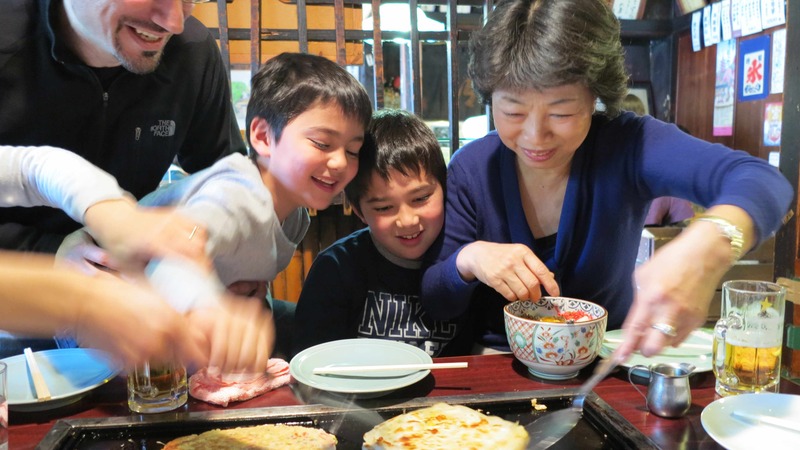 It is a great social experience to prepare the okonomiyaki! 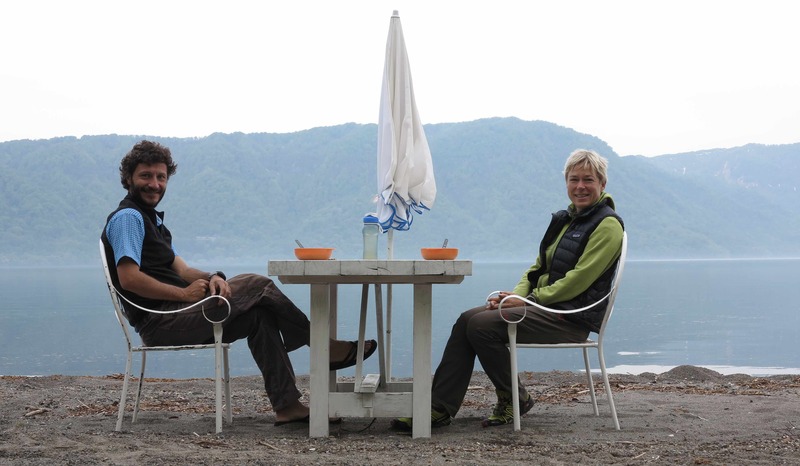 9-11 May 2013: We are on the road with Frida and we are cooking Japanese rice with wasabi/seaweed/sesame seed topping or we are making cold soba noodles with miso/wasabi sauce. 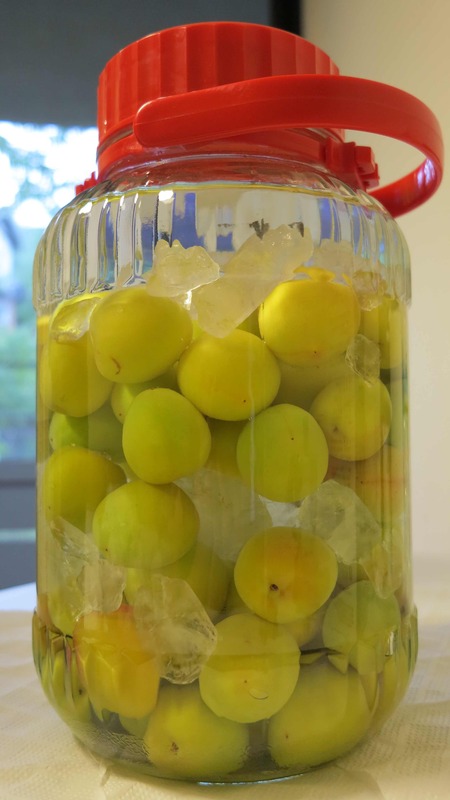 For drinking we have a big bottle of 3-year-old, home made umeshu or plum wine from Yukos mother, delicious! 15-18 May 2013: We left our friends in Yokohama and went north in Frida. We are eating soba noodles, rice and onigiri till we are blue in the face! Fortunately there are also fresh strawberries, cherries and melons for sale everywhere. 19 May 2013: Today we went to the fish market in Hakodate in the southern part of the Hokkaido island, famous for its fresh fish and in particular the sea urchin! The sea urchin has a very particular taste…..it is very hard to really like it! But Marco made a big effort since all things which taste bad tend to be very good for you (and in particular for man!). Marco with the sea urchin sushi “para macho”! 21 May 2013: We are on the northernmost island of Hokkaido and tonight we had a fantastic Jingisukan, which also translates to Genghis Khan, a dish which is special to Hokkaido. 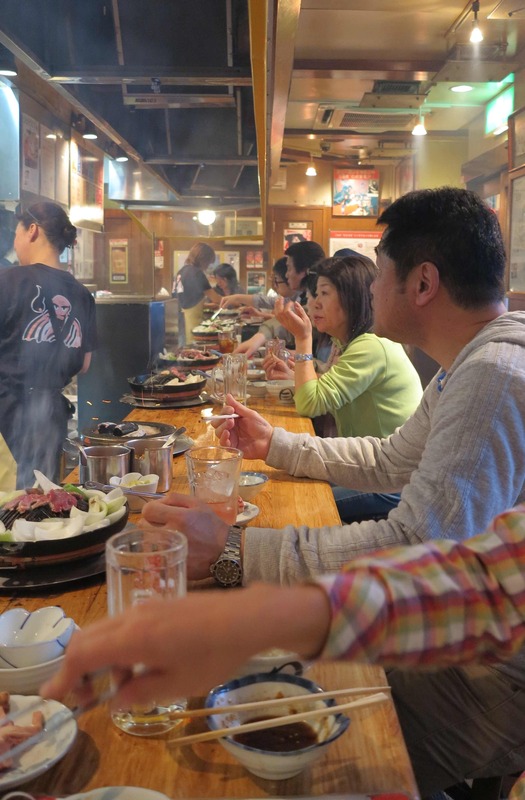 It is basically a Japanese style Mongolian barbeque where you grill your own meat at your table. Very tasty and very popular! 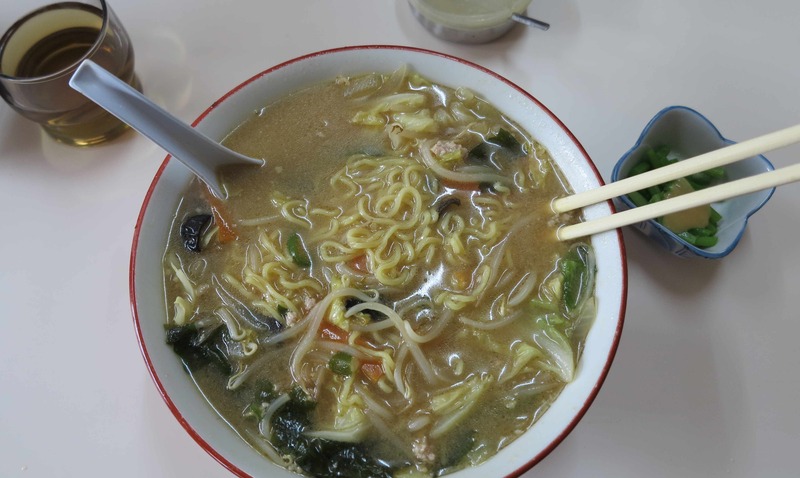 Eat it in Sapporo – and flush it down with a cold sapporo beer! Japanese lamb barbeque in Sapporo. 28 May 2013: On the road, south of Aomori, we went for a 10 km run, then to the public bath in a small village with natural hot spring water (in fact it was incredibly hot!) and then finally, the ramen! Cold ramen for Marco, hot miso ramen for Malene. 29 May 2013: Today was our 1 year anniversary for the trip! It is fantastic to think back to all the things we have experienced, the people we have met, the food that we ate! We had breakfast on the shore of the Towadako Lake. 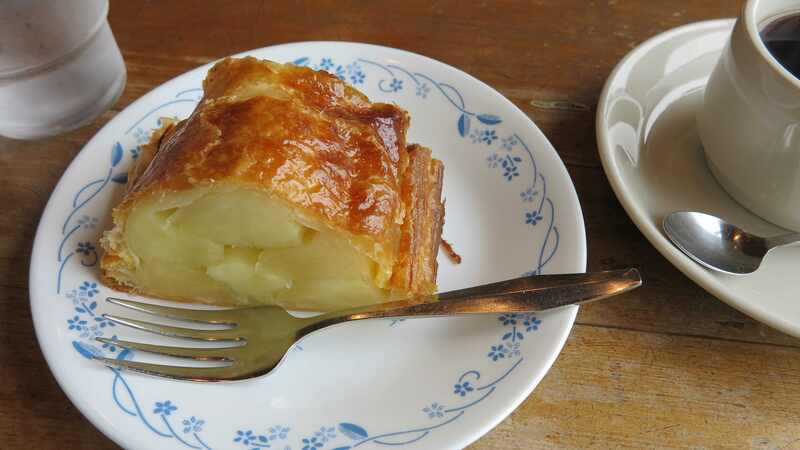 Then we had freshly baked apple pie and coffee! 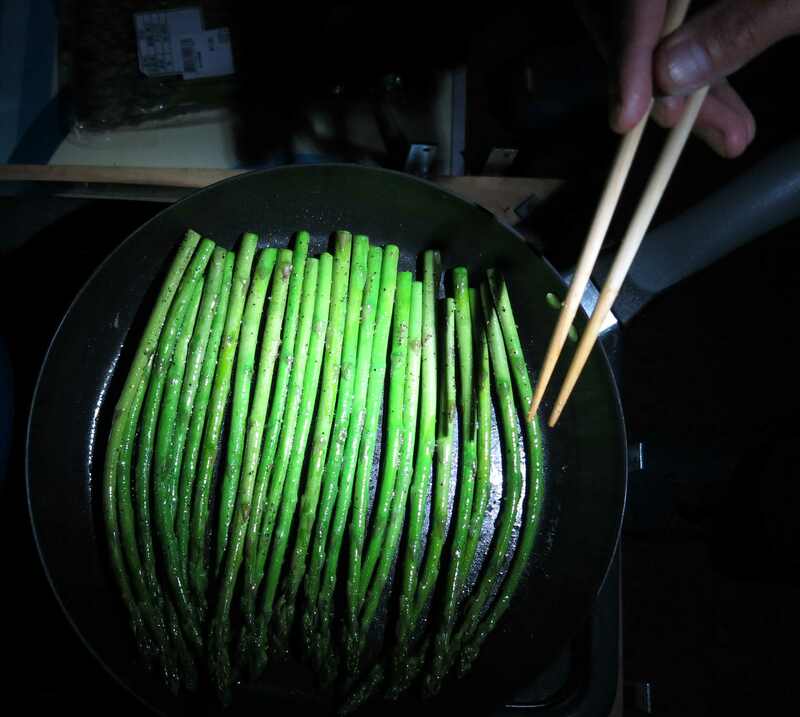 For dinner we had pan fried small green asparagus sprinkled with salt and pepper. 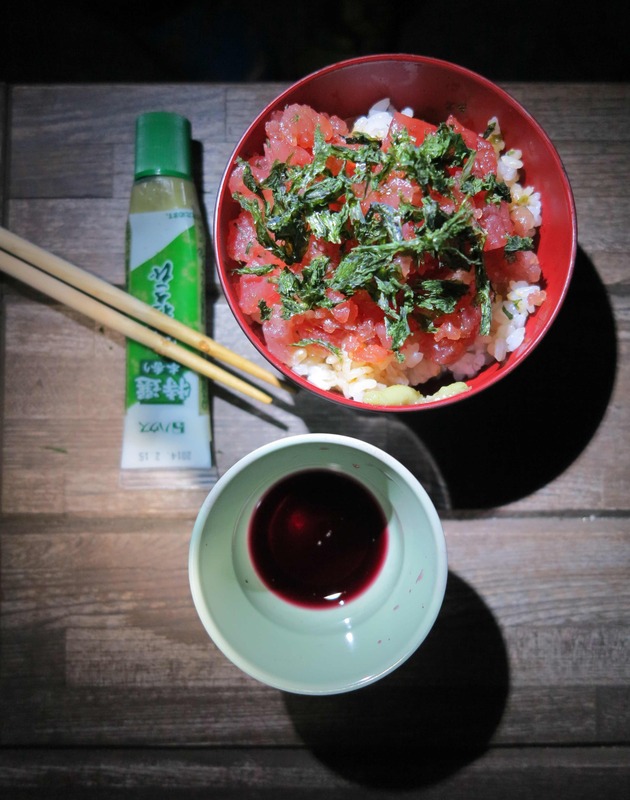 And tuna tatar with nori, wasabi, soy sauce and Japanese red wine! 31 May 2013: Today was the day of the sushi! 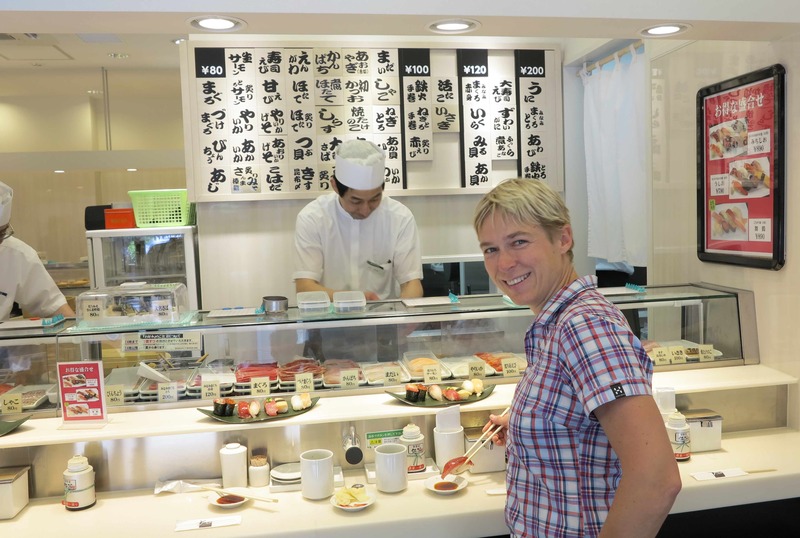 After picking up our visas for Russia, we went to the suburb of Kanda and had a lot of sushi. The sushi is freshly prepared in front of you, it is extremely tasty and not expensive at all. Chiyoda Sushi, recommended! And then we went to our friends in Yokohama and discovered to our delight that they had prepared a big sushi feast for us! How lucky can we be!!! 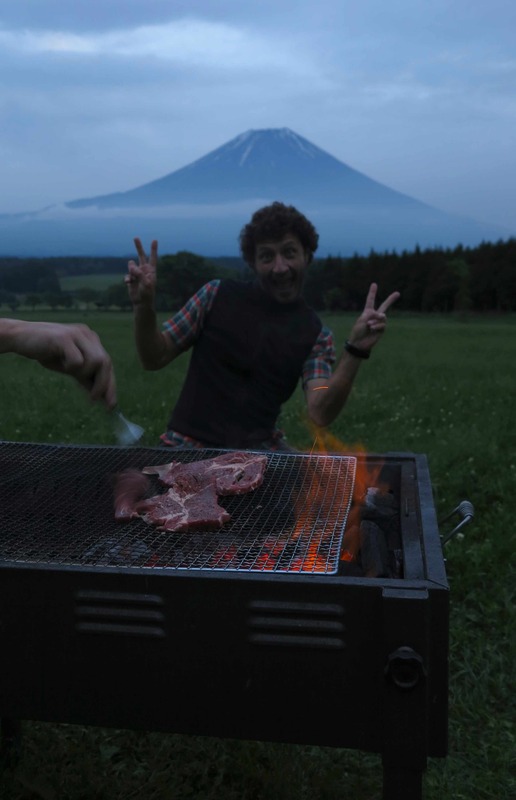 1 June 2013: Argentinian Asado with a view to Fuji-san! 3-11 June 2013: We drove south from Mount Fuji to the Kii Hanto peninsular, then we passed through Nara before taking the bridge to Shikoku Island and finally we took a ferry to Beppu on Kyushu Island. We have been eating a lot of sushi take-away or sushi from the supermarkets, a lot of onigiri from the convenience stores and a lot of inari sushi, our favourites, tofu pockets filled with rice. We have been cooking a bit like for example pakistani style eggplant and penne arrabbiata. For lunch we sometimes had noodles in small restaurants. One night we made a delicious pasta with very fresh shrimp. That was the highlight of the last week! Second half of June 2013: Long time no update! Let’s see, what did we eat… We started cooking a very delicious salmon: Pan fried with olive oil, soy sauce and sake and a bit of dried sea weed or Japanese basil on top. Or try this chicken: A lot of freshly grated ginger, quite a lot of garlic, chili (fresh if you have it), olive oil, sesame seed oil, soy sauce and a 2-3 tomatoes. Let it simmer for a bit and then add chicken breast in pieces. Eat with cous-cous. This is called the Hakusan Chicken. We are also eating a lot of broccoli: Fry an onion in olive oil, add broccoli in pieces plus a good amount of soy sauce, fry until broccoli is tender, add more soy sauce as needed. Eating tofu and vegetables with a spicy soy dipping sauce in Kyoto with a view to Japanese garden art. 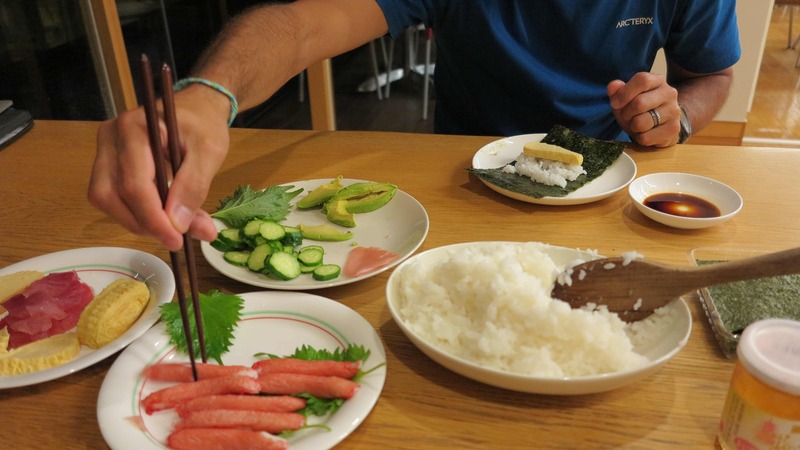 Home made sushi in Kyoto! 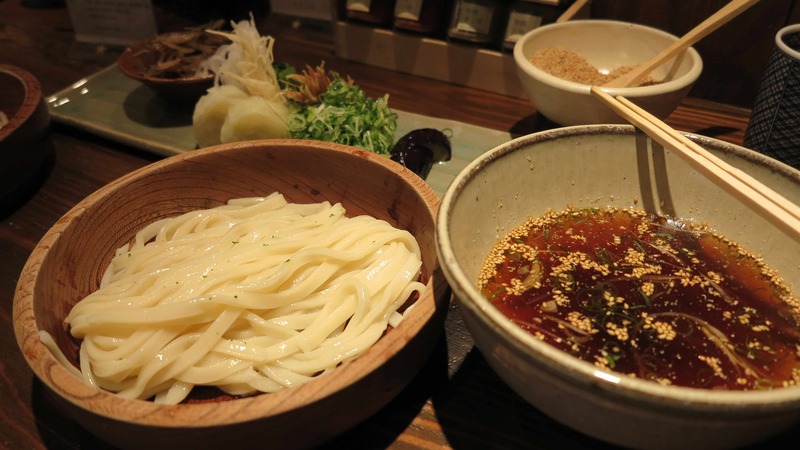 Cold udon noodles with dipping sauce and toppings. A perfect summer dish. 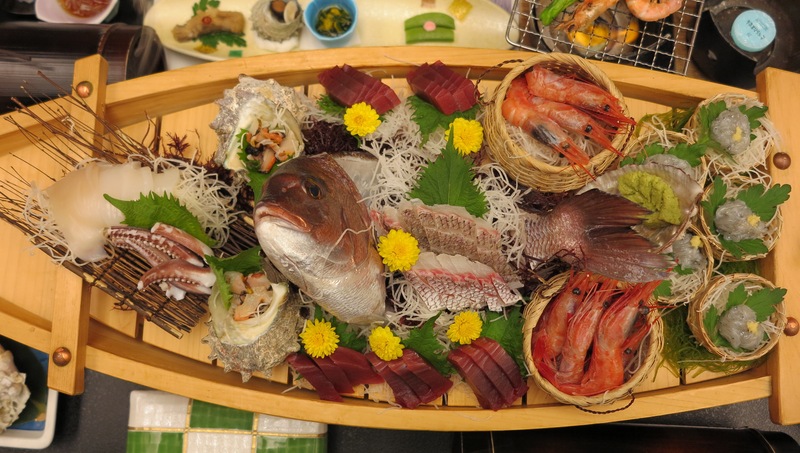 Cooking by the sea on the southern island of Kyushu. 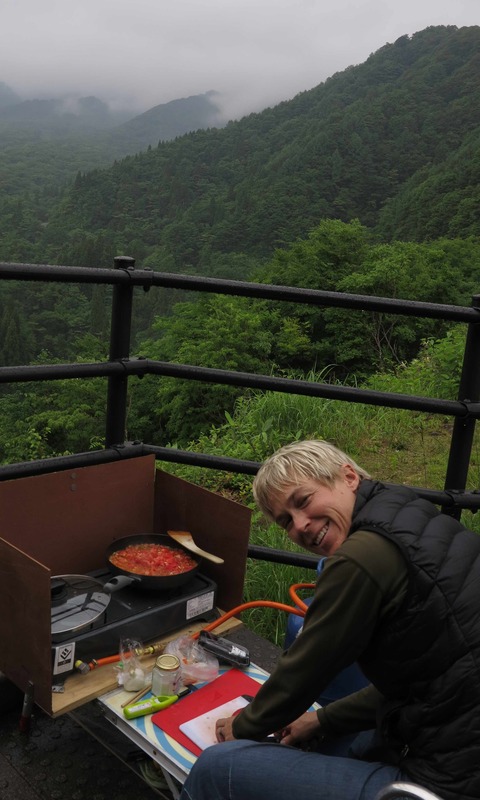 Cooking chicken in spicy tomato sauce (with fresh ginger, garlic, chili, cumin, coriander and garam masala) in the mountains close to Kyoto. Umeshu Update: We love umeshu! It is a liqueur made from Japanese apricots, also called Japanse plumb wine. It is sweet and fruity and absolutely irresistable – especially when it is home made!!! So we decided to try and make our own! We used 2 kg of unripe apricots, 1 kg of rock sugar and as much white alcohol 35% as would fit into a 5 liter container with the other ingredients. And now we are waiting……we have 2 x 5 liters in Frida! 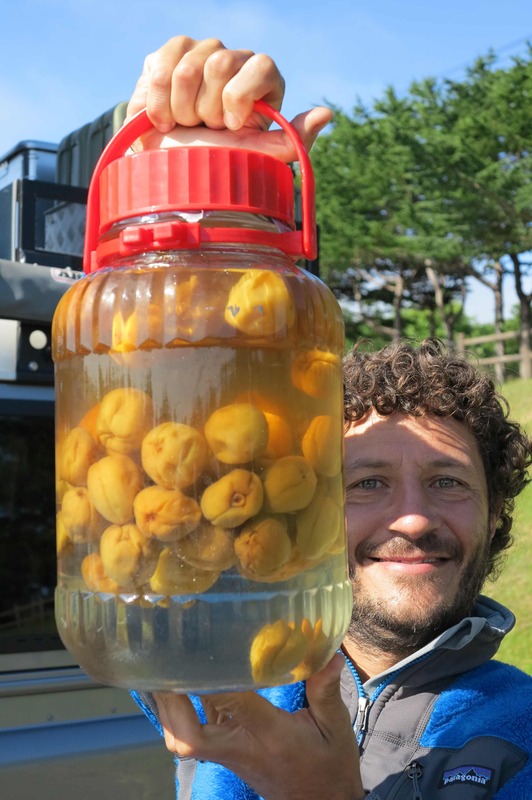 Unfortunately we have to wait at least one year before drinking it so by that time it will probably be the most traveled Umeshu in the world! Hopefully it will survive the heat and the bumpy roads. 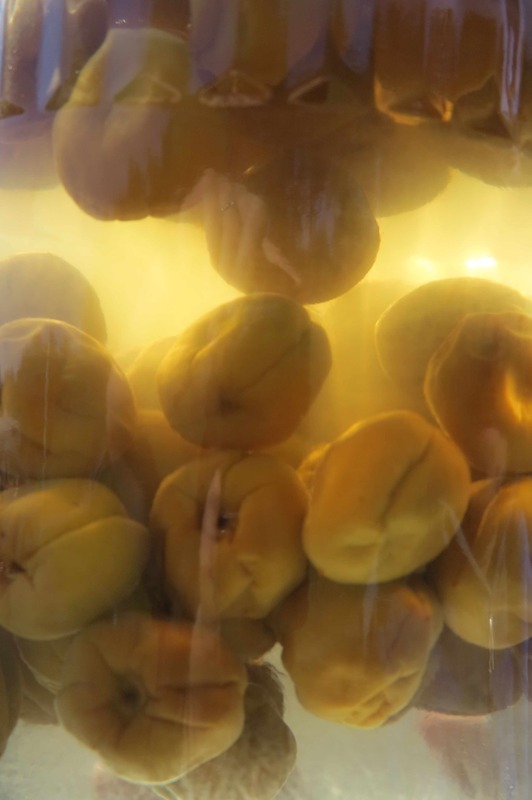 Here the apricots are drying before going in the container with the sugar and alcohol. 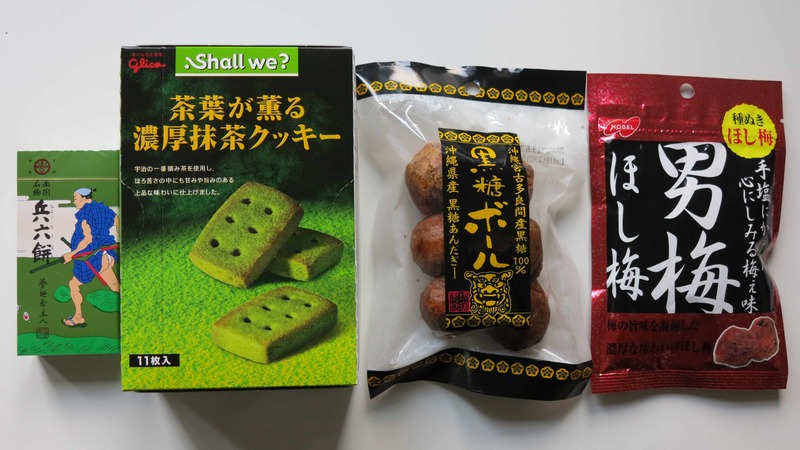 For the first batch we used ordinary green apricots but for the second batch we found the more expensive Kishuu sort from around Wakayama. 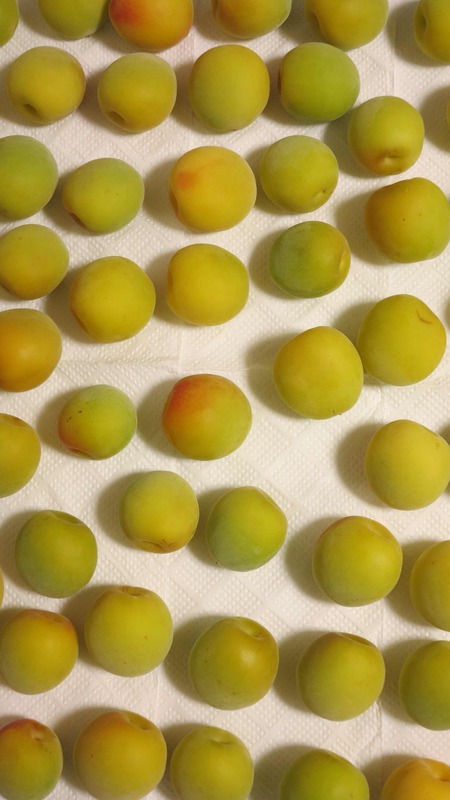 Umeshu day 1 – unripe apricots, rock sugar and white alcohol. Now wait one year! 26-27 June 2013: At Konashinoyu Ryokan in the Central Japanese Alps, enjoying our last culinary feast in Japan before heading north to catch the ferry from Hokkaido to Sakhalin Island in Russia. 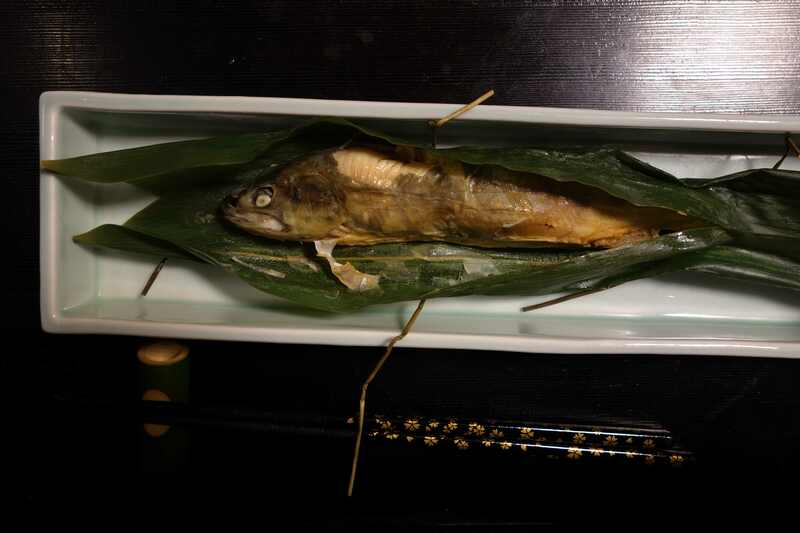 Fish from the river stuffed with miso, wrapped in bamboo leaves and steamed for 3 hours. 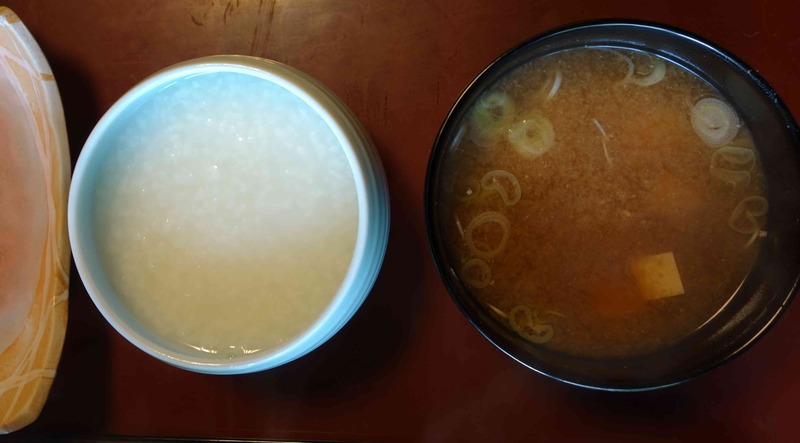 Rice pudding cooked with the mineral rich water of the natural hot spring – and miso soup. 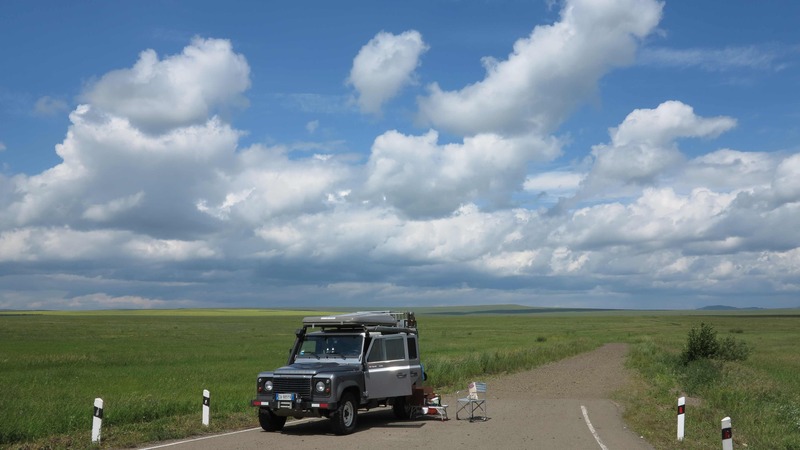 1-7 July 2013: We are back on Hokkaido, now in Wakkanai at the northern tip of Japan, waiting for the ferry to take us to Sakhalin tomorrow. 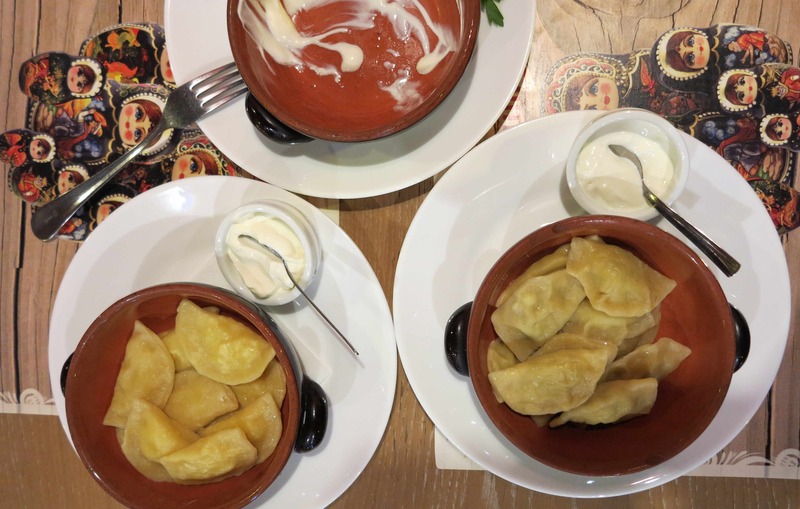 It will be a sad goodbye to a lot of fantastic food that enriched our experience here in Japan – but on the other hand it will be a hello to dark bread, cheese and salami, a variety of lovely Russian soups, pelmini and piroshky! Meanwhile in Hokkaido we have been to a crab festival in Esashi. 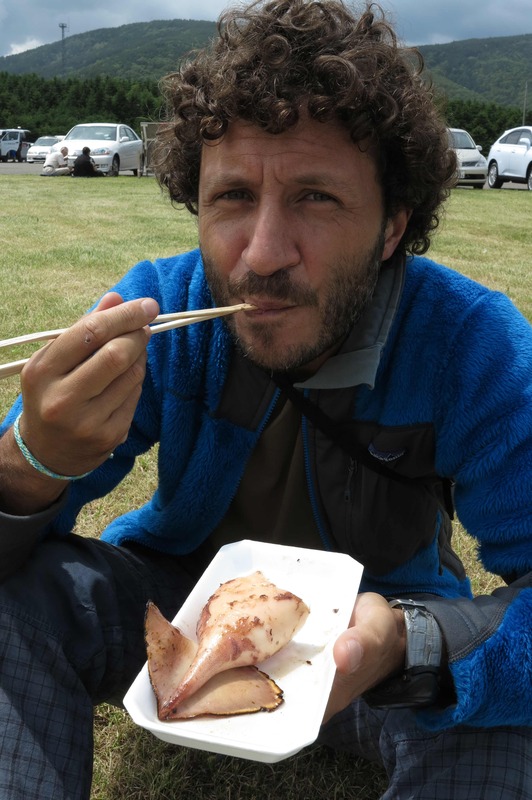 So we had crab for lunch and crab for dinner – and Marco also had a freshly grilled squid. Slurp! 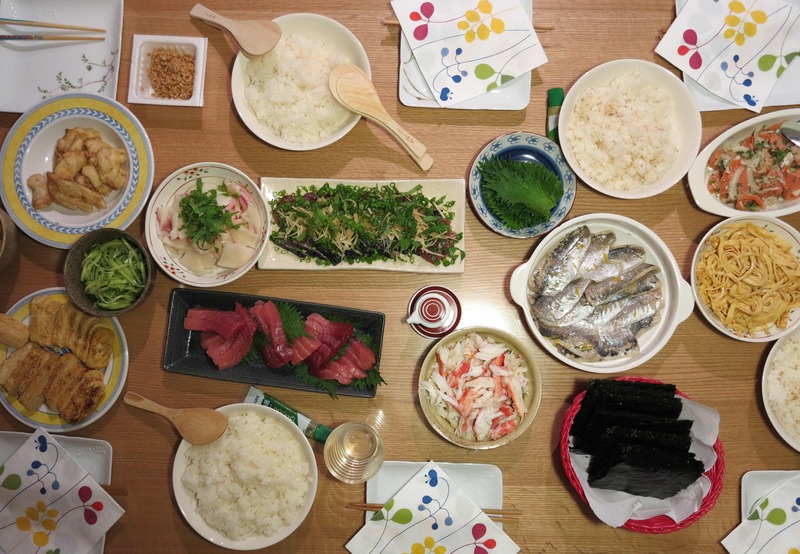 8 July 2013: Our first night in Russia, on Sakhalin Island, we had onigiri, rice packages with salmon, brought with us from Japan and Umeshu, plum wine. 9-10 July 2013: With Elena and Pavel on Sakhalin, we had shashlyk, freshly caught crabs boiled on the beach and sushi. Delicious! 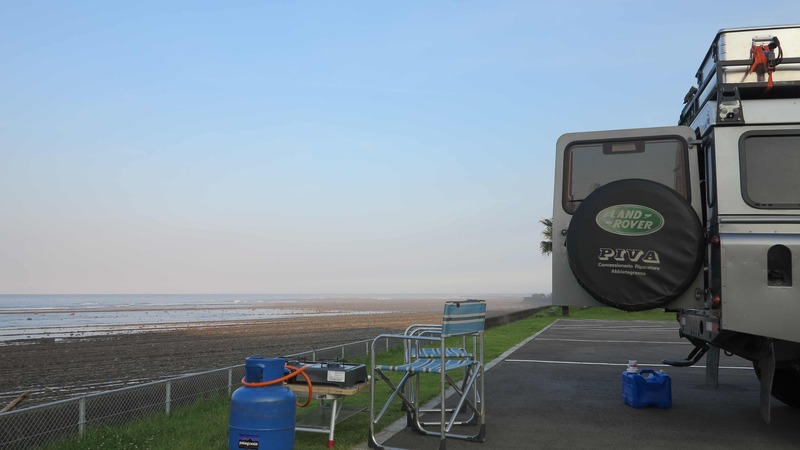 11 July 2013: Waiting for the ferry to the mainland, we took a good bath in a shallow river, then made pancakes and ate them with home made jam from Japan. 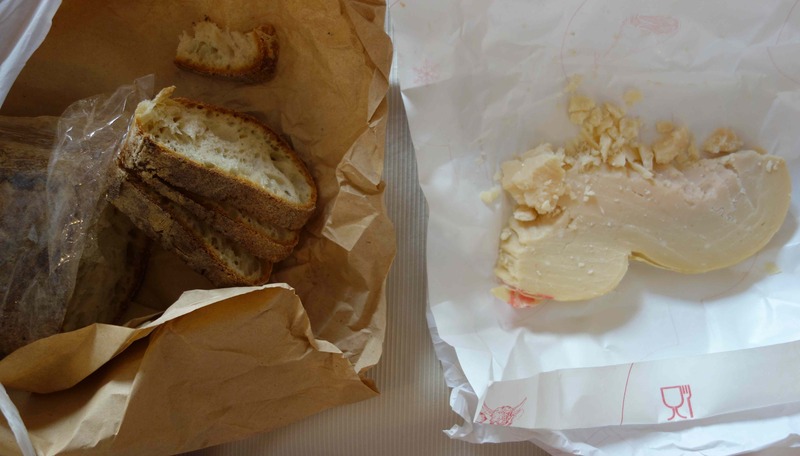 12 July 2013: Dark russian bread and cheese on the ferry from Kholmsk to Vanino. 13-14-15-16 July 2013: Our bread-and-cheese diet continues! Either there are too many mosquitos to cook anything – or it is raining! We ate a lot inside the car theese days…..
17 July 2013: We were desparate for some cooked food and the sun was shining so we stopped for lunch and pulled out the kitchen to make mashed potatos with spicy lentil sauce. Slurp!!! 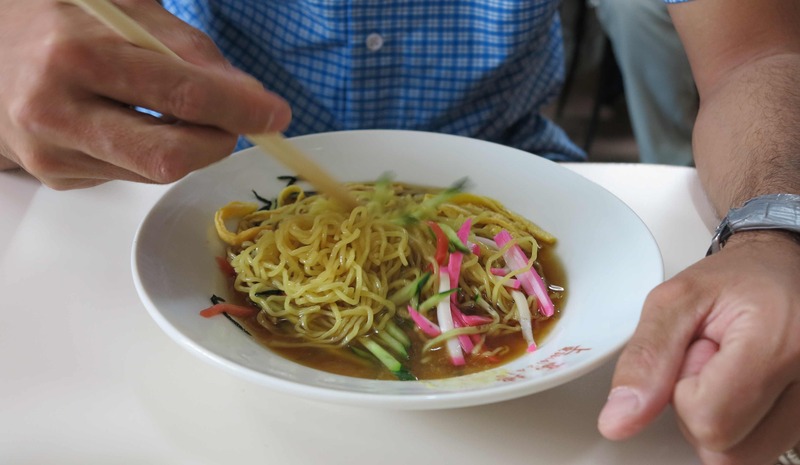 19 July 2013: Just outside Ulan Ude, camping on a beautiful hill overlooking the big Selenga River valley, we had cold soba noodles with miso sauce. 20 July 2013: Bought new thin honey on the road side in one of the “old believers” villages close to Ulan Ude and had pancakes with honey for dinner. 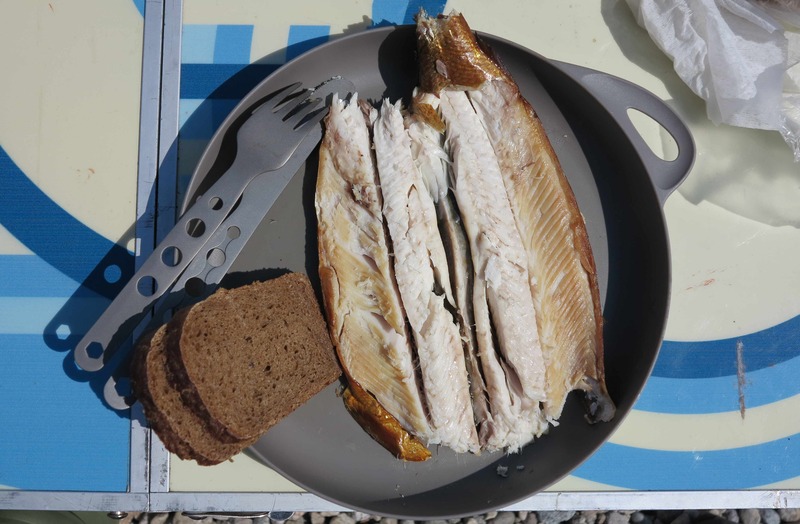 21 July 2013: Smoked omul fish from the Baikal Lake for lunch followed by strawberries from the datchas along the road. Then couscous with vegetables for dinner. 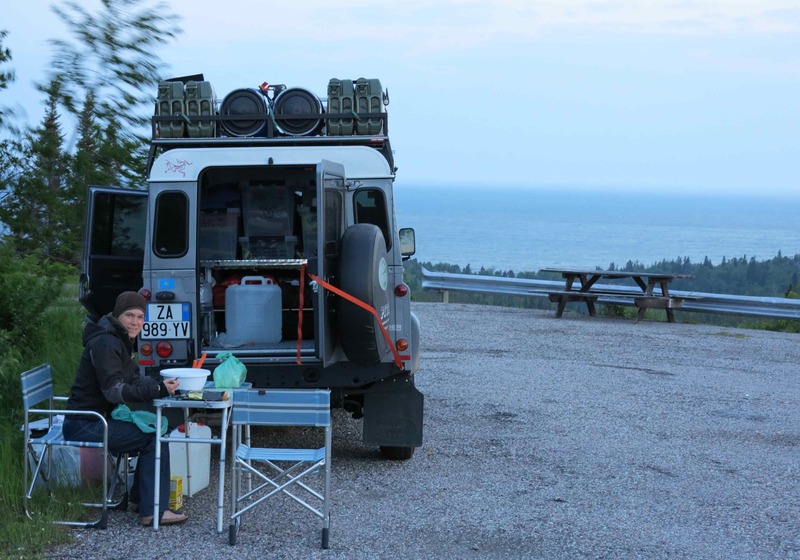 We are camping on the shore of the Baikal Lake, lovely view! 22 July 2013: Mashed potatos with the very last drop of umeshu / Japanese plum wine. 23 July 2013: A new invention by Marco, after a couple of glasses of vodka/juice: Pasta with nori (dried seaweed), pepperoncino and olive oil. Really tasty! 24 July 2013: Japanese white rice with wasabi furikake (stuff to sprinkle on top). 25 July 2013: Vegetable stew. 26 July 2013: Aubergines with tomatos. 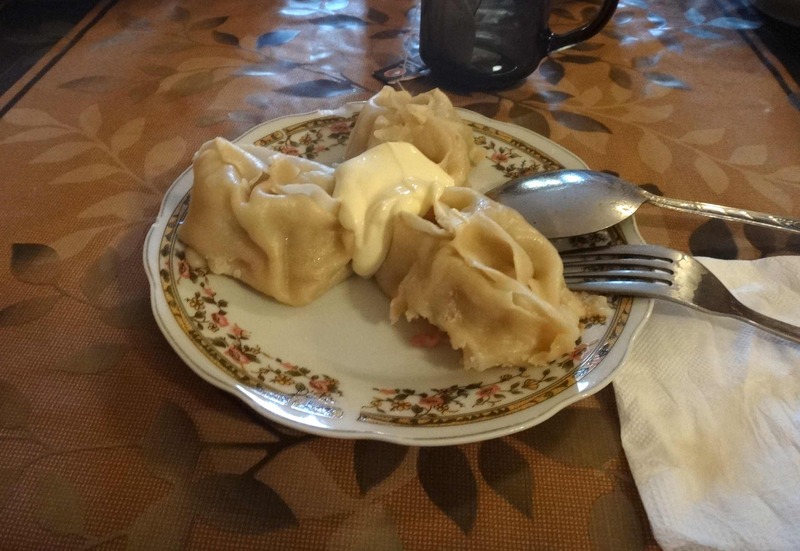 27 July 2013: Pelmini and vareniki for lunch at Russian restaurant in Krasnoyarsk. Bread and cheese for dinner. 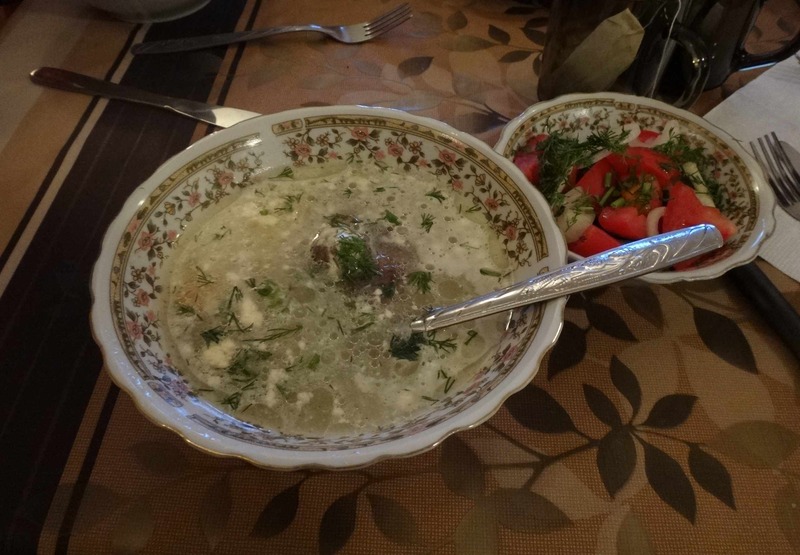 Pelmini with meat (the empty dish, disappeared even before the picture was taken!) and vareniki with potatos and with cabbage. 28 July 2013: Mashed potatos with spicy lentil sauce. An all time favourite! 29 July 2013: Pasta with olive oil, peperoncino and nori/japanese sea weed. For the first time in ages there are no mosquitos so we can sit outside and enjoy our dinner. A miracle! 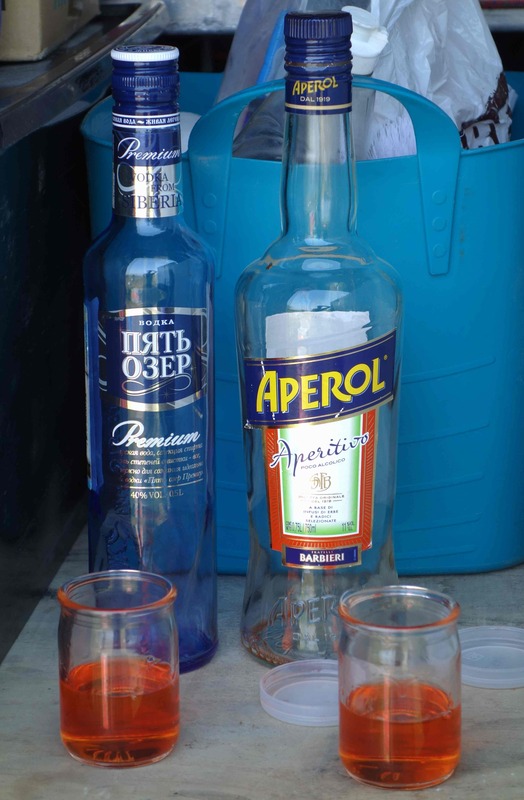 And because we forgot to buy beers we had to invent a new drink with whatever we had in the car: Aperol with vodka and sports-energy-drink. 30 July 2013: Big lunch at georgian restaurant in Omsk, then 1 liter microbrewery beer for dinner. 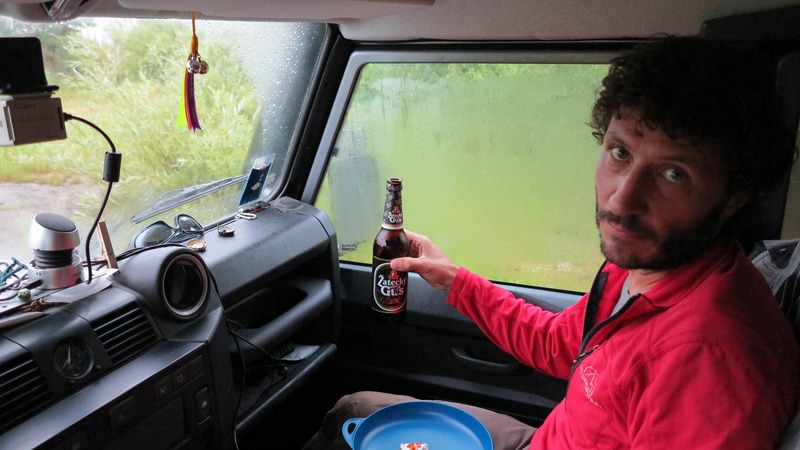 31 July 2013: Bread and cheese and beer in the car – it is raining. We are just outside Yekaterinburg. 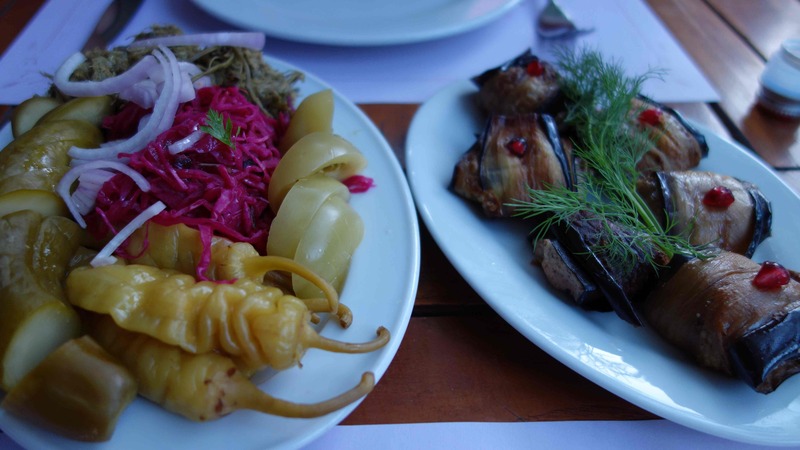 1 August 2013: Pelmini, salads and kompot in Yekaterinburg. 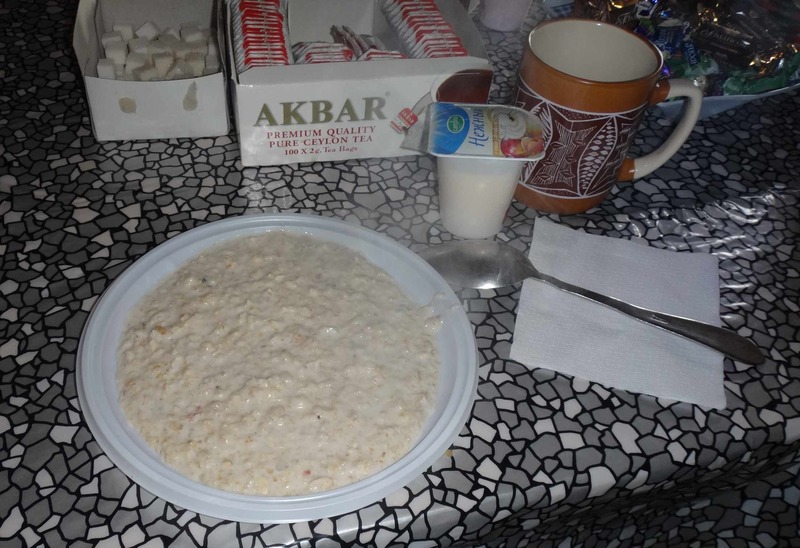 2 August 2013: Boef Stroganoff and mors (fruit juice) in Yekaterinburg. 3-4-5 August 2013: We are in cost savings mode (and a little bit tired of the cooking ritual) so we are eating easy things like soba noodles with miso sauce, white rice with furikake (japanese topping for rice, for example with wasabi, sea weed and sesame seeds), or pasta with peperoncino. And what are we drinking? Red Russian of course! In our own version: Vodka, aperol and a bit of water. Could be improved but this is what we have. And it is still better than the old Soviet version! From Wikipedia: A Red Russian is a cocktail named for its red color (….) In the former Soviet Union during World War II, it was sometimes prepared with boiled cow blood. 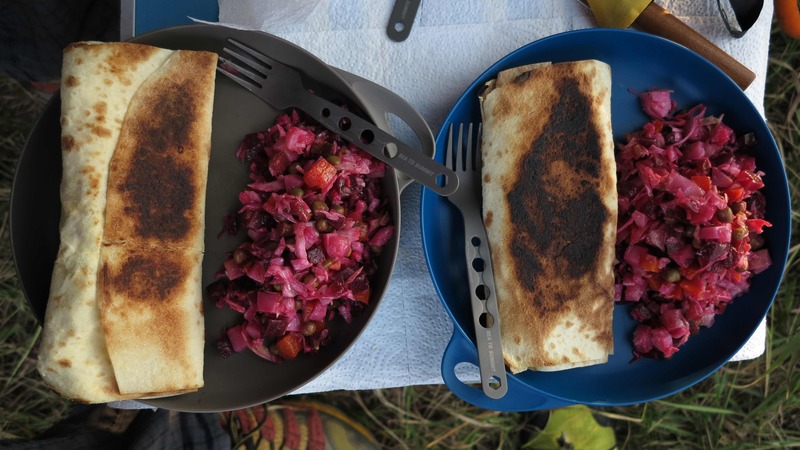 12 August 2013: We are in the foothills of the Caucasian Mountains in the southwestern corner of Russia and tonight we ate a superb dinner of Russian salted salmon and creme cheese wrapped in lavash bread and “baked” on the frying pan. 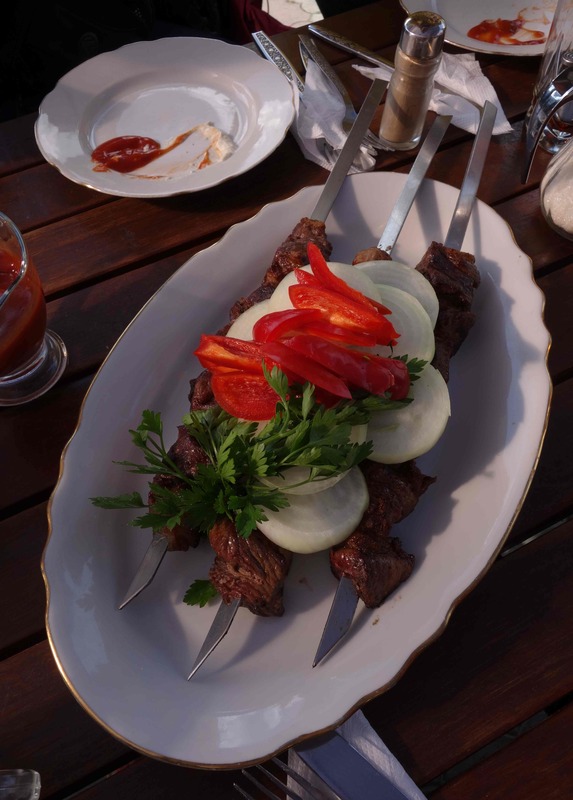 Served with Russian vinaigrette salad and enjoyed with the view over the green hills. 13 August 2013: For “lunch” first coffee and several different sweet things at the french bakery Provence here in Kislovodsk, then a visit to the “drinking gallery” where the healthy drinks on offer are water with sulfur minerals or water with dolomite, enjoyed either hot or cold at one of the many drinking stations (see photo below). And finally we had pancakes with honey and sweet condensed milk for dinner. A good day! Marco enjoying a healthy glass of sulfuric water! Actually it tastes slightly better than it smells. 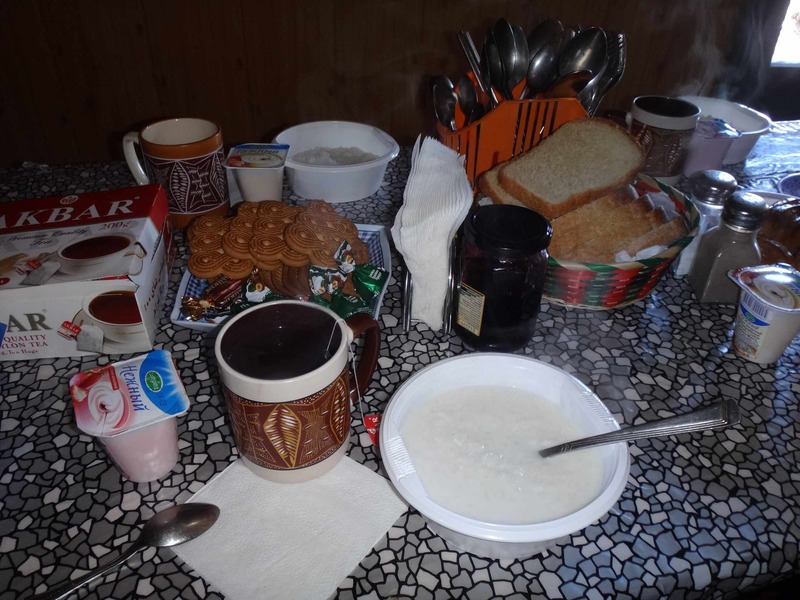 24-30 August 2013 – What did we eat while climbing Mount Elbrus? 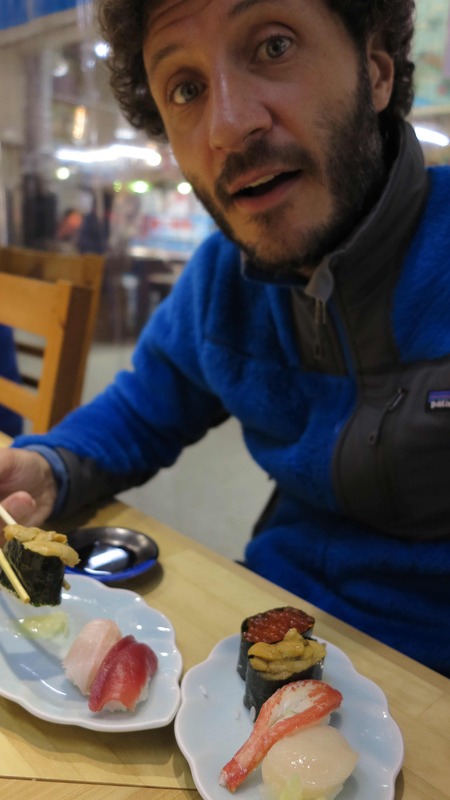 Thanks to our Japanese team member Ken, who took all the photos below, we are able to give a quite detailed account on what we ate before, on and after Elbrus! 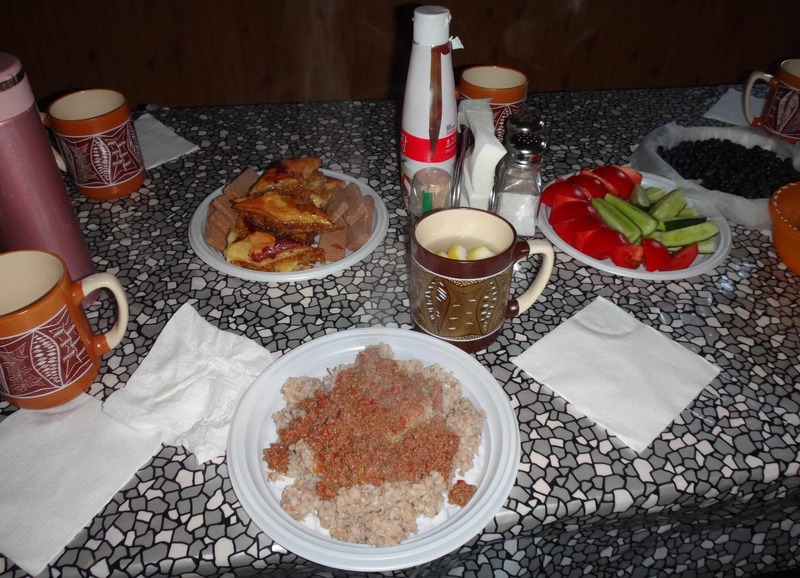 In the village of Terskol, at the foot of Mount Elbrus, we ate very well! 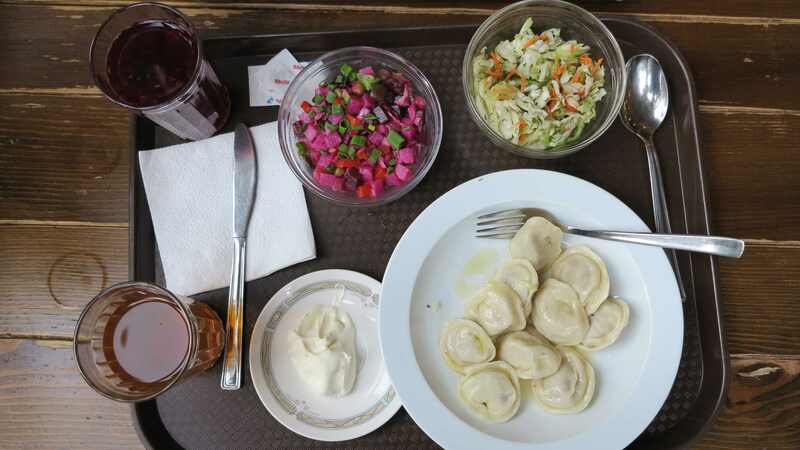 The first night we had a clear soup with meat balls, salad and then small meat dumplings with sour cream. 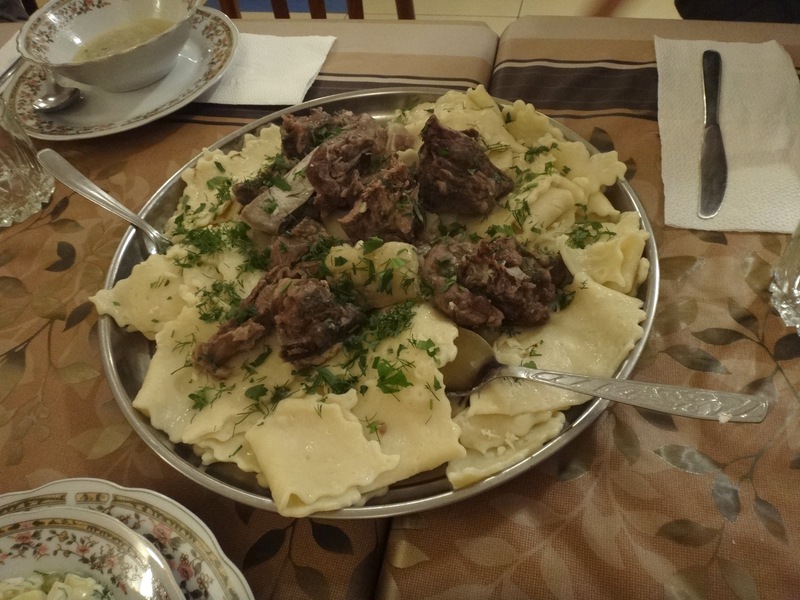 The next night we ate an excellent borscht soup followed by big, kazakh style meat dumplings. Very tasty. 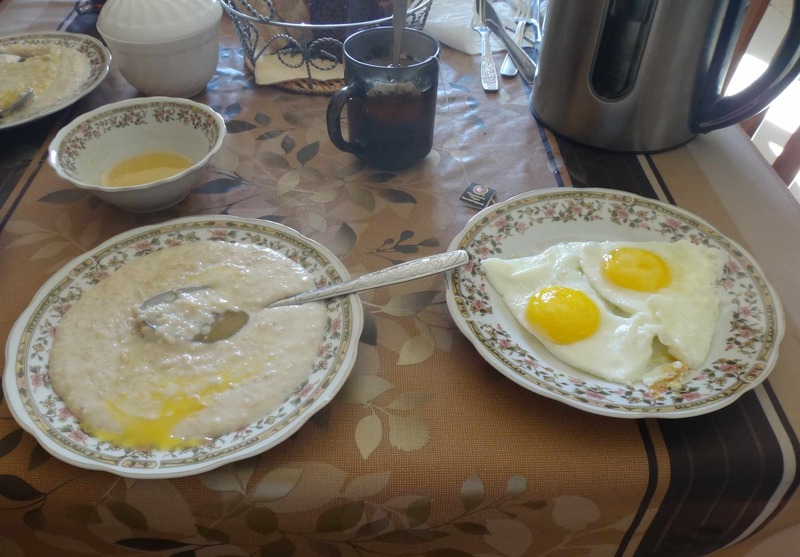 For breakfast we had porridge, eggs and bread with honey and jam. 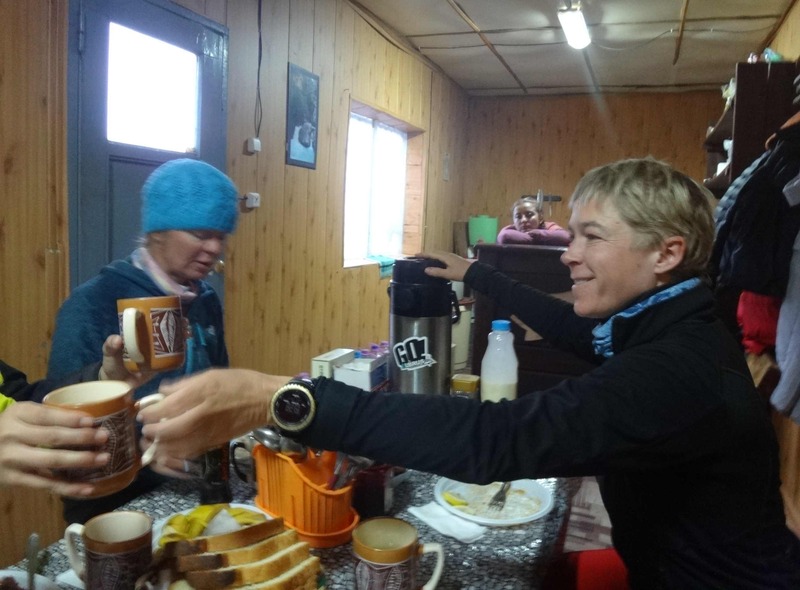 At our base camp on Elbrus, Fatima carefully cooked very good meals for us every day. Some examples below. Buckwheat with meat sauce and fresh cucumbes and tomatos. Vegetable soup with kidney beans and spaghetti with meat sauce. This was one of the breakfasts: A kind of omelet and bread with cheese and salami. And breakfast with milk rice. 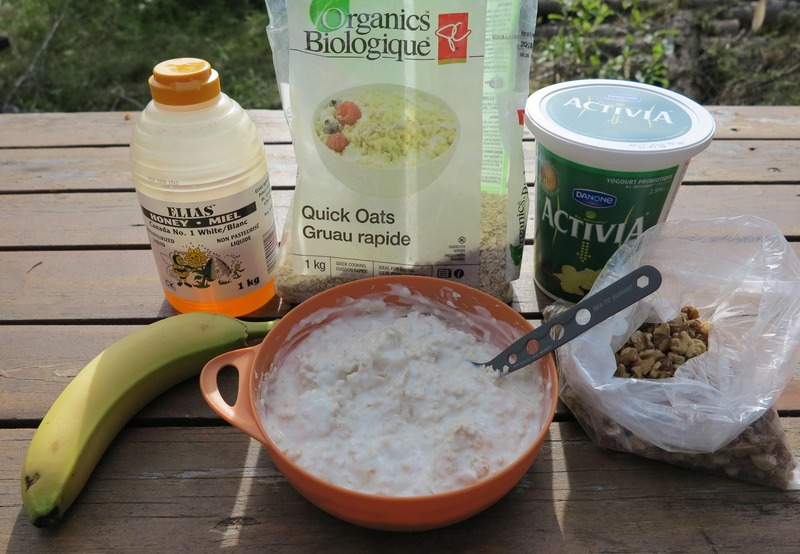 And finally a good oatmeal porridge for breakfast. 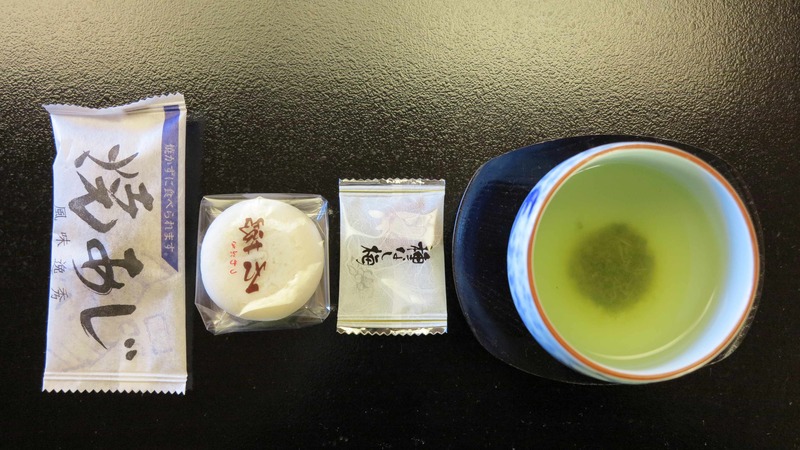 Here the daily “tea ceremoni”. Who needs hot water? Now we almost forgot the most important: Every morning Marco made espresso (de-caffeinated) in our cabin. Well down from the mountain, we had our first beer! 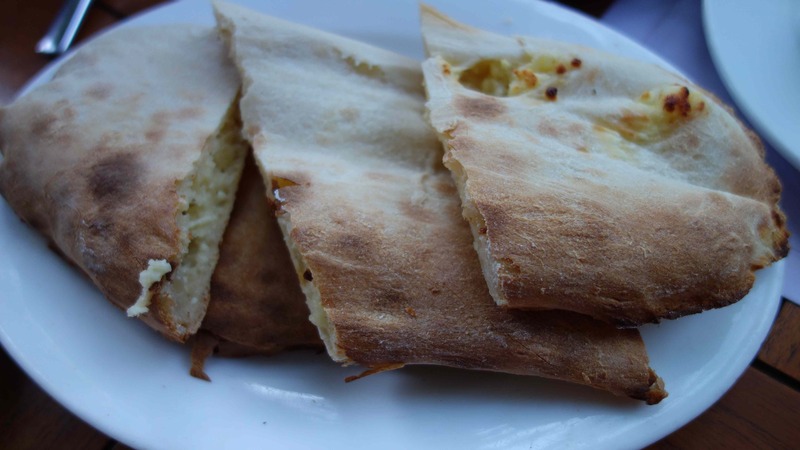 The beer was accompanied by the local version of “khachapuri”…. We are in Georgia! The land of incredibly tasty food and great wines! So far we only dived into the food. 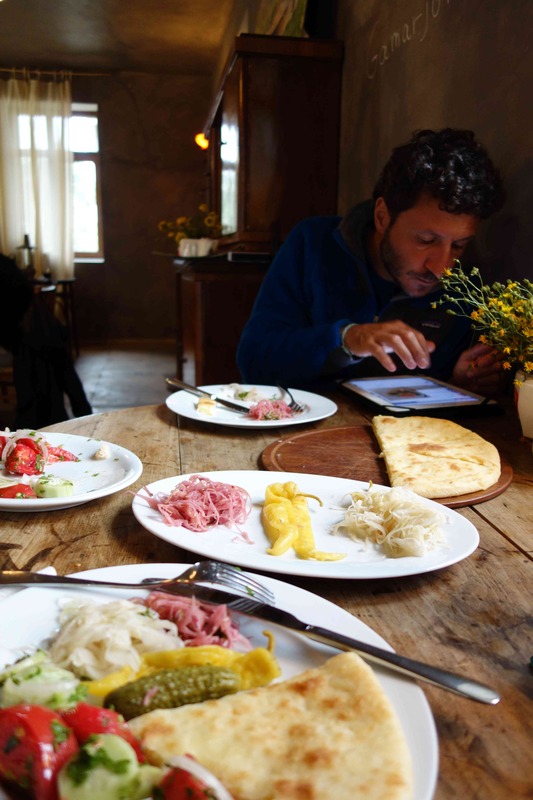 We started out by eating the famous “khachapuri” in the first village after crossing into Georgia from Russia. Now we are heading to Svaneti, the remote and mountaineous northwestern region of Georgia, then back towards Tblisi. We will keep you posted on all the fantastic food we eat along the way. 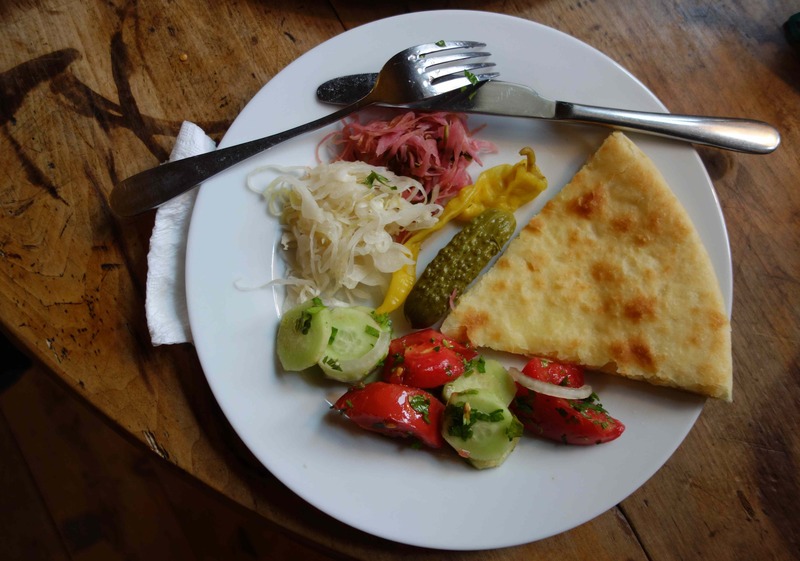 31 August 2013: Khachapuri with pickled vegetables and cucumber-tomato salad in a nice cafe in Kazbegi. Khatchapuri (bread baked with cheese inside) with pickled vegetables and cucumber-tomato salad. 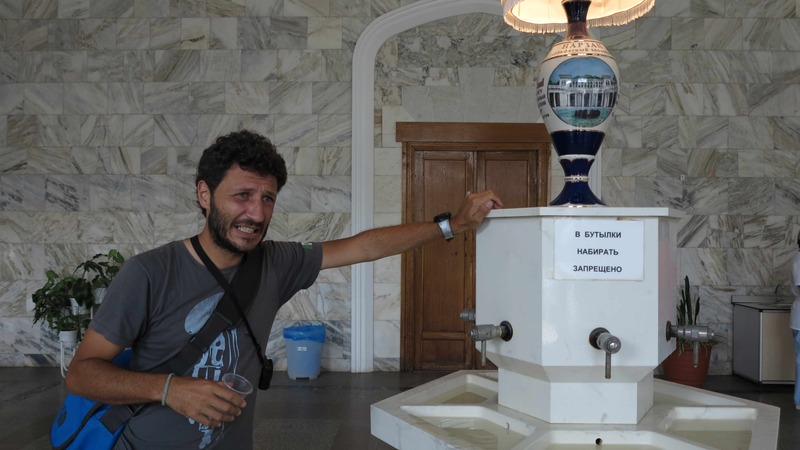 2 September 2013: In Zugdidi, on our way to Svaneti. 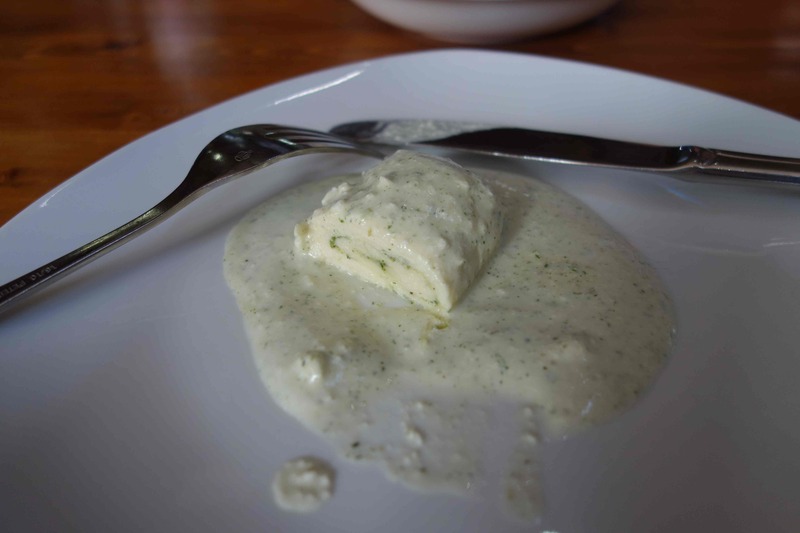 We are eating “gebzhalia” = a cold dish of boiled suluguni cheese with yoghurt and mint. Delicious. 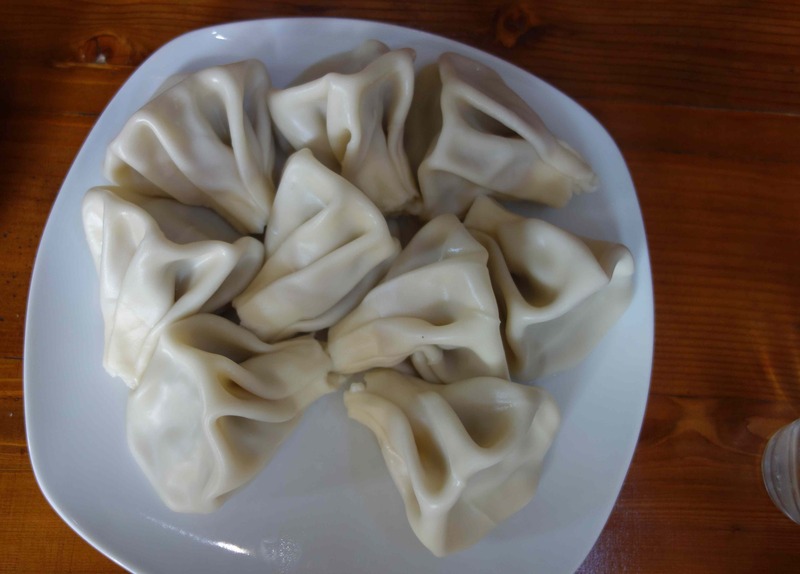 Followed by the famous “khinkali” meat dumplings and flushed down with a nice Borjomi mineral water (we have to drive!). 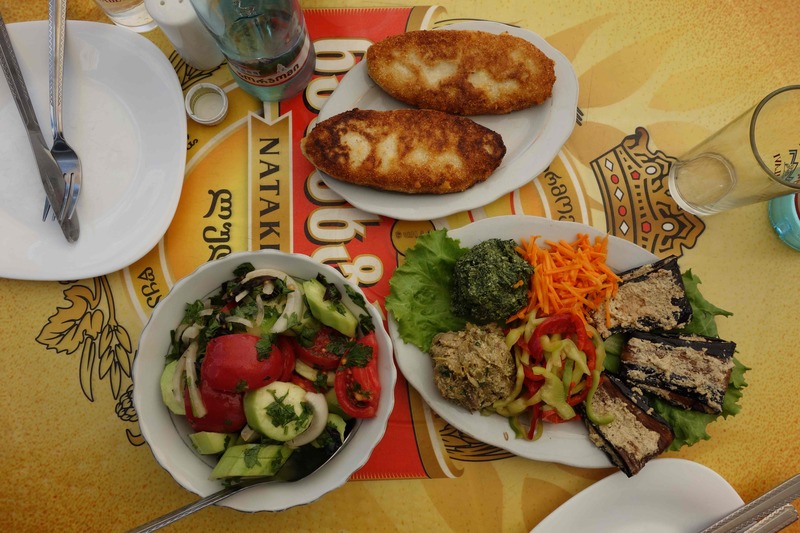 3-8 September 2013: We are filling up on lobio, khachapuri, mkhali, pkhali and tasty salads with fresh tomatos and cucumbers. And we are eating bread, lots and lots of lovely, warm, crispy Georgian bread. The Herr Lobio Supreme from Mtskheta. With khachapuri. 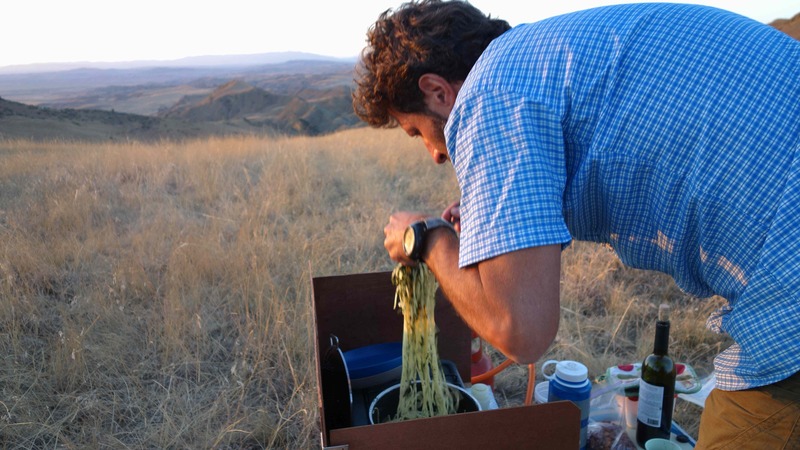 Marco cooking pasta in the hills on the border between Georgia and Azerbaijan. 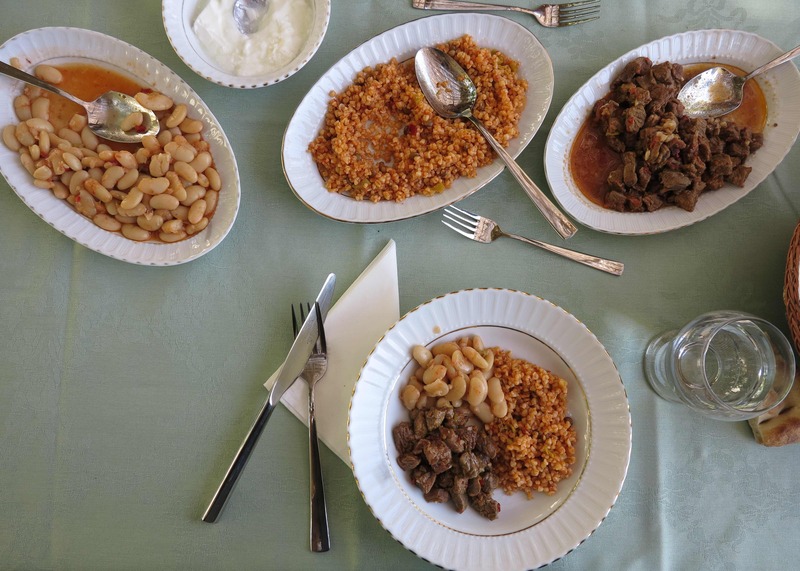 We left Georgia with our stomachs full and thought that maybe we could go a bit on diet in Turkey. But it is impossible! 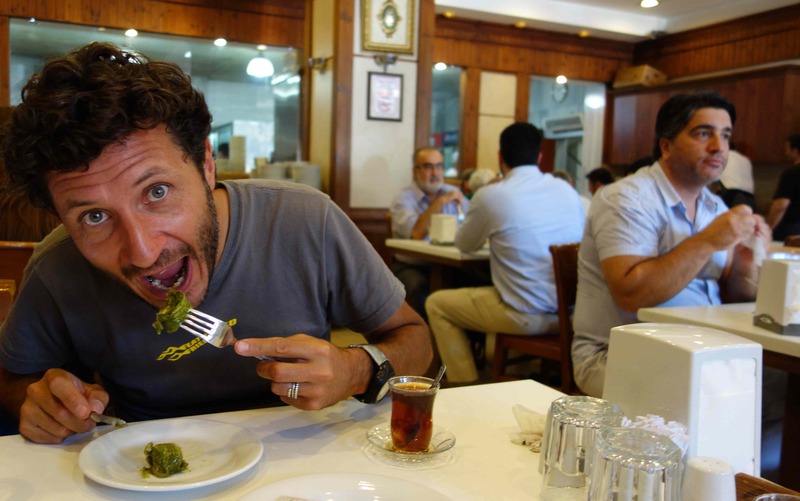 Especially in southeastern Anatolia we found delicious food and the world’s best baklava! 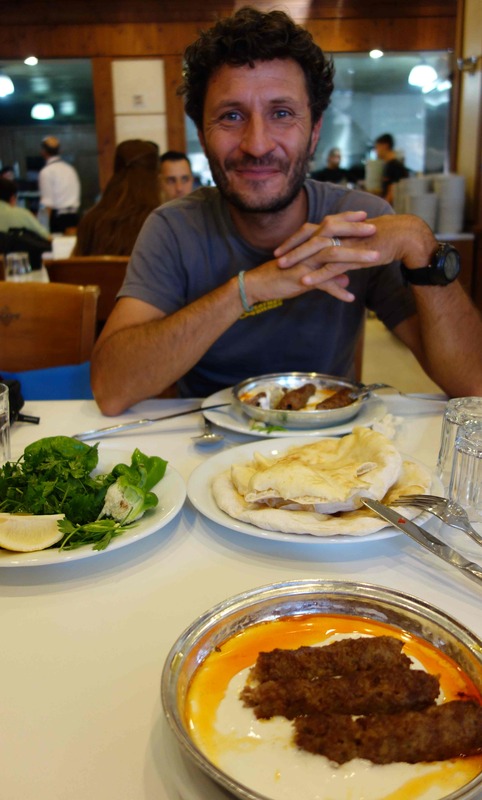 13 September 2013: We made a 500 km detour just to visit Gaziantep….and it was worth it! 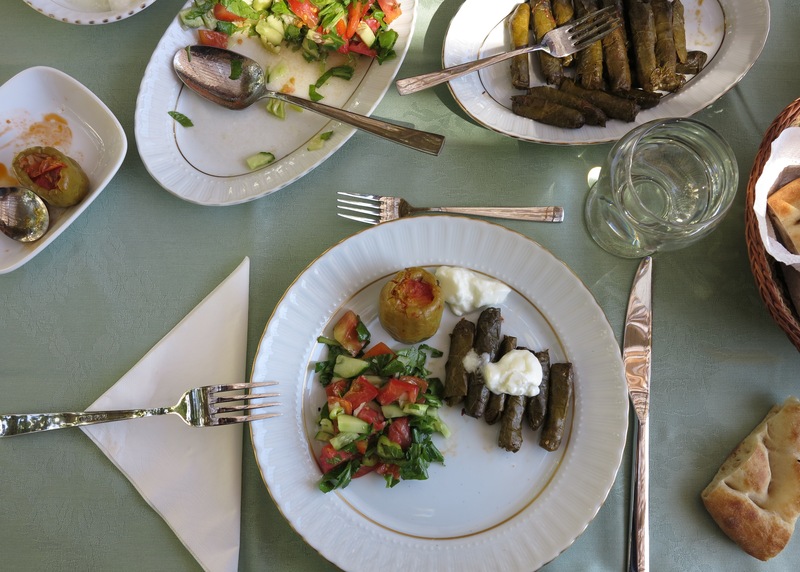 Not only do they make the best, the freshest and the tastiest baklava anywhere in the world, they also have other extremely tasty foods from the southeastern Anatolian kitchen. Marco with his plate of ali nazik kebap: Minced lamb meat, grilled, served with grilled smoky smooth aubergine mixed with yoghurt and spices. It is impossible to describe the taste – heaven! And then, the baklava! We ate a couple of pieces each and then we bought 1 kg to eat in Frida. 16 September 2013: Today we had one of those meals that we will always remember. 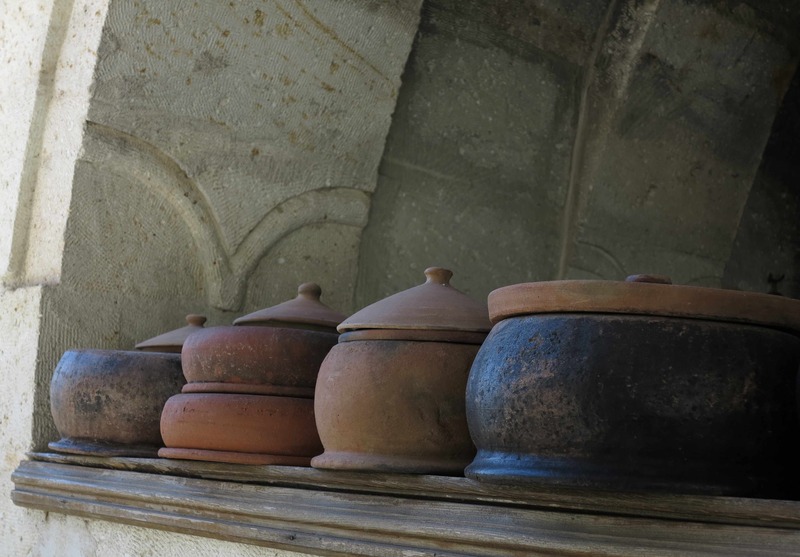 We found it at the Aravan Evi Restaurant in the small village of Ayvali in Cappadocia. Here the food is tasty like it can only be when it is home grown and prepared with a lot of care. Home grown and home pickled peppers – just to start. Stuffed peppers, dolmas, home made yoghurt and fresh salad from the garden. The main dish spent 3 hours cooking inside this tandoori oven. Very tender veal from the tandoori oven served with bulgur and white beans. 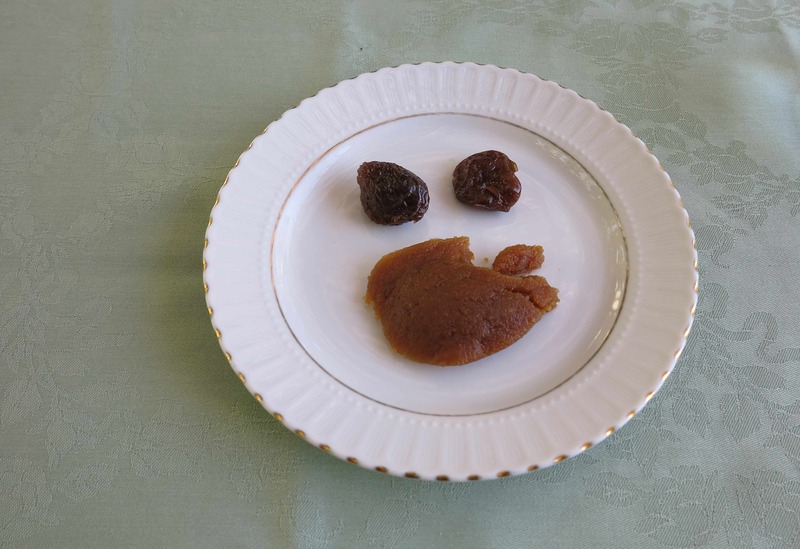 And for desert, home made “halva” and dried apricots. Very simple, very very tasty! Outside, the chicken were still alive, fortunately! 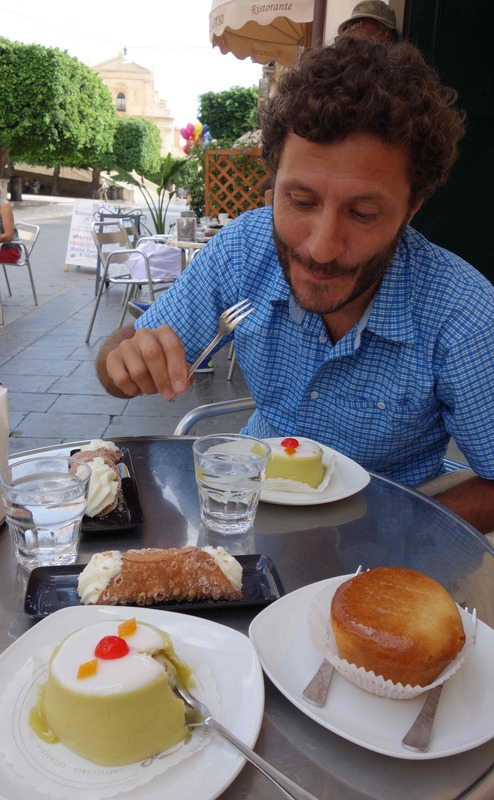 29-30 September 2013: In Sicily we ate a lot of sweets! Cassata, cannoli siciliani and a special sicilian version of the baba’. It was fantastic! In the night we had our first pizza on Italian soil. How we have been missing a good pizza! 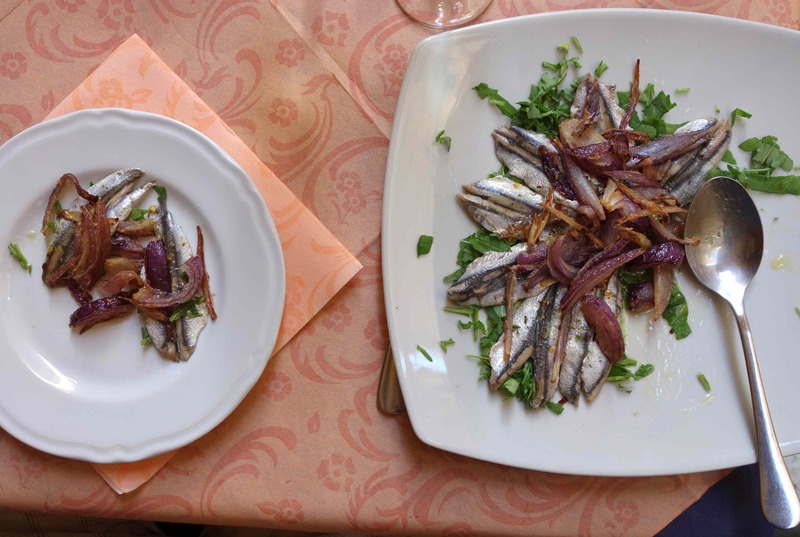 2 October 2013: In Tropea we ate caponata (a stew of aubergine, peppers, potatos and red onions), red tuna tatar, and carpaccio de alici (raw small fishes called alici “cooked” in lemon juice) served with fried red onions – see photo below. The alici were especially delicious! 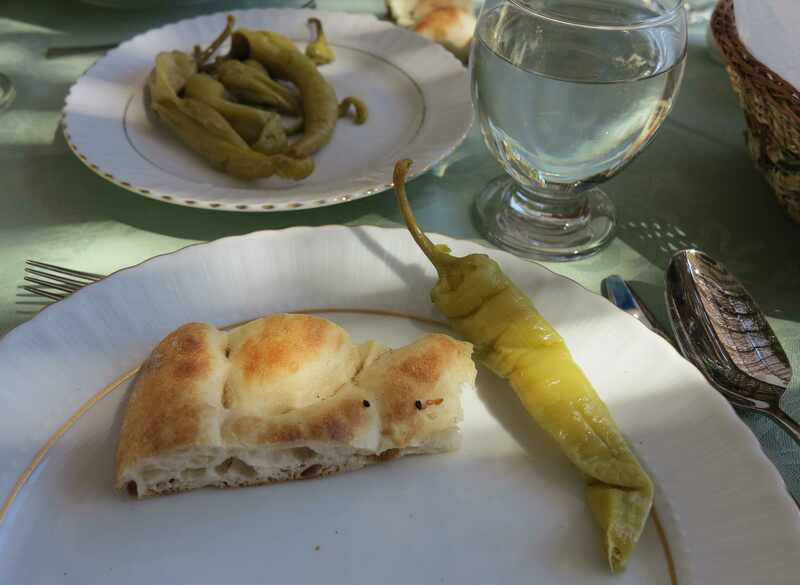 3 October 2013: The next day we bought more alici in a shop on the way and ate them for lunch with some nice focaccia. Then we passed through Battipaglia, famous for its mozzarella di bufala. 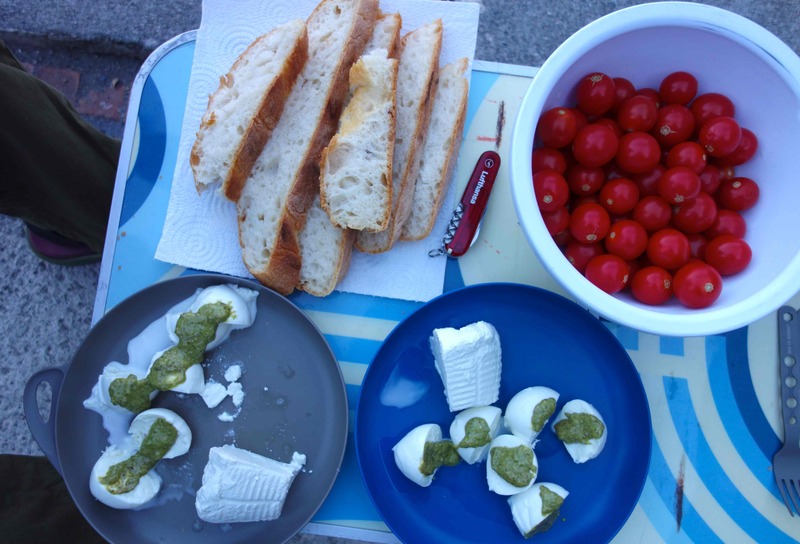 We bought fresh mozzarella, fresh ricotta, fresh green pesto, small tomatos and some good bread and in the night we had a feast. Honestly, this is one of the best meals we had on the trip! With the rest of the tomatos, the bread and a bit of garlic and basil we made nice bruschettas for dinner the next day. 5 October 2013: And then finally, we arrived to Napoli! For dinner we had a real napolitano pizza! No pictures unfortunately. 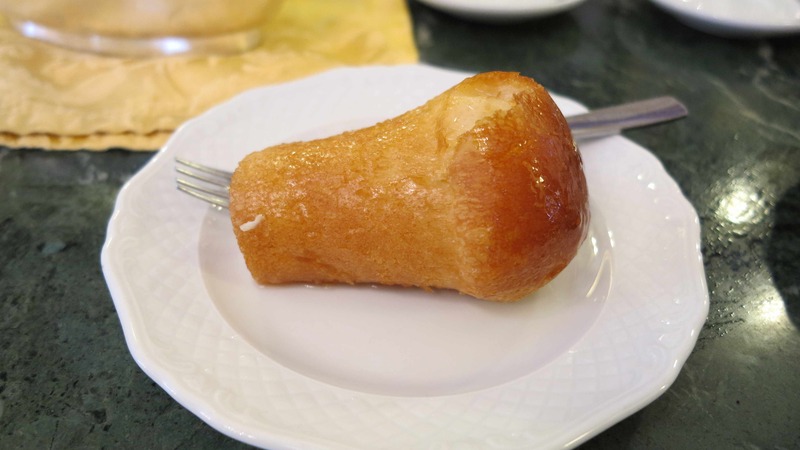 6 October 2013: For breakfast we had the famous baba’ at the cafe pasticcieria Gambrinus in the center of Napoli. 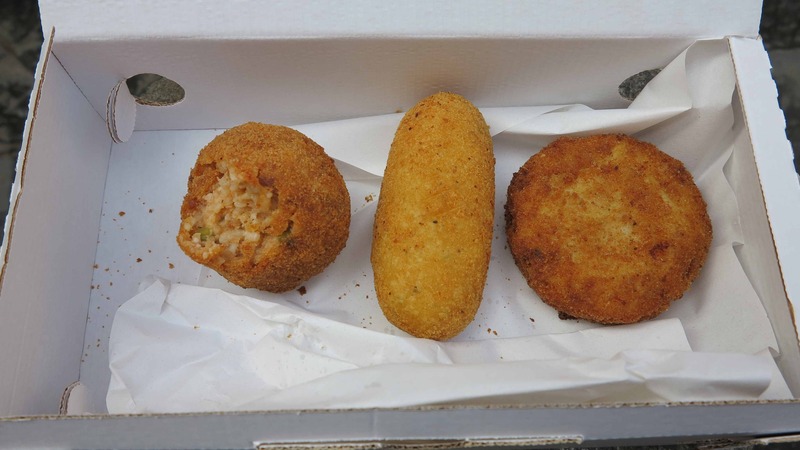 And for lunch we had arancini di riso, croquette di patate and timballo di pasta. A bit on the heavy side but it had to be done at least once! 7 October 2013: Still in Napoli! For breakfast we had each two sfogliatelle! They are crunchy on the outside and has ricotta cream inside…amazing! For lunch, bread baked with wood in the pizza oven and a very old (stravecchio) provolone. In the early evening we went out for a couple of aperitifs to celebrate our last evening in Napoli. First Tassoni con Aperol. 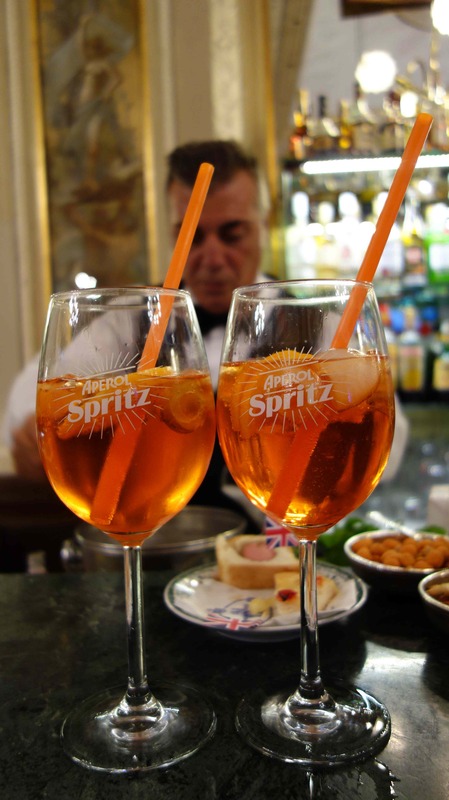 And then a classical Aperol Spritz. And finally, a good pizza!!! 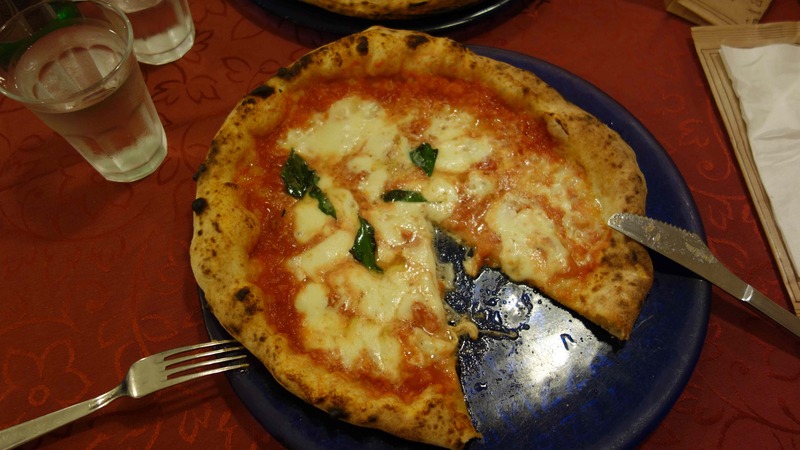 There are no pizzas like the pizzas in Napoli. At the pizzeria Di Matteo in Napoli. 9 October 2013: Driving north, we passed through the wine region of Tuscany. 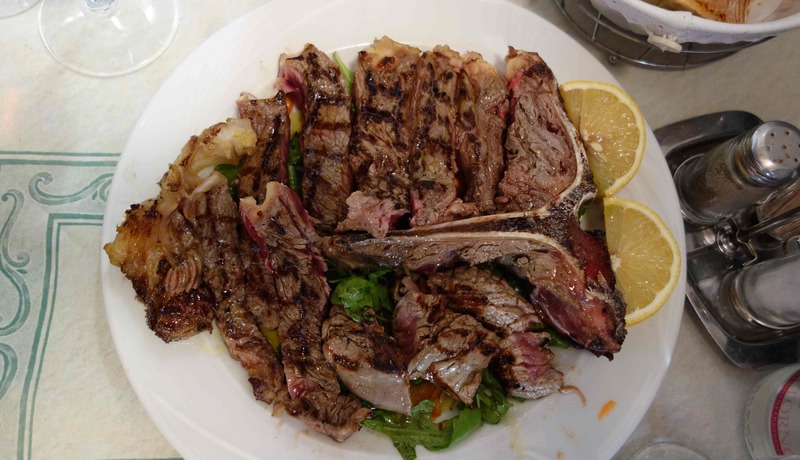 And nothing goes better with one of the excellent local red wines than the famous and enormous florentine steak! We ate as much as we could and then we made a stir-fry with the rest for dinner. Gian Marco, and where is your white rice and chicken breast? SIETE SPETTACOLARI! Questa descrizione dei cibi around the world è FANTASTICA!!! Bravi. Dovete sapere che ogni giorno, nei momenti più down, vi leggo e SEMPRE mi ritorna il SORRISO! Continuate a scrivere…. e per favore bevete le Birre locali…. Ce ne sono di buonissime!! Grazie Orietta per i complimenti…forse non ce li meritiamo tutti 😉 appena tornati da un’altra emozionante scalata del Mount Rainier (4.392 mt) Partiti per la vetta alle 12.30 del mattino sotto un millione di stelle…a 3.800 mt colti da fortissima bufera di vento (100 km/h) con temperature polari…abbiamo stretto i denti…e alla fine eravamo i primi ad alzare le braccia in vetta! Discesa con sole da spiaggia per alleviare le escoriazioni accumulate durante la salita…al ritorno abbiamo fatto il pieno di birra locale…scura, chiamata “Moose Drool”…dimenticate tutte le fatiche della scalata! vedo che procede sempre bene lì…. Qui siamo rientrati tutti dalle ferie lunedì, quindi ora ricominciavo a viaggiare solo con voi! Finally we found the herring!! Unfortunately from Sweden 😉 but when you are far from home it is good enough. Greetings from Panama to all in the Kharaib Team! Hi guys, still following your blog, and travelling with you in my mind. We’ll go for a team christmas lunch now and will enjoy some of the traditional danish christmas food. Hope you will have a nice christmas dinner with family in Buenos Aires. I wish you a very hyggelig christmas with your family and happy and safe travelling in 2013! And enjoy the argentinian wines! Thank you Christine!! Have a piece of rugbrød with herring for me and say hello to everyone in the team! Un grande abbraccio da Abbiategrasso. E noi ne siamo contenti!!! Continuate a seguirci!!! Congratulations with your 1 year anniversary on the road! I hope you have celebrated it with a lot of good food and rice wine. Enjoy the rest of the trip like it is your first day again. Are you still planning on going down under or is it on to Siberia? Thank you Christine!!! Now I will post the photos of our anniversary dinner :). Will follow your advise and enjoy like it was the first day! Now onwards to Siberia, Australia will have to be next time! Big hug!